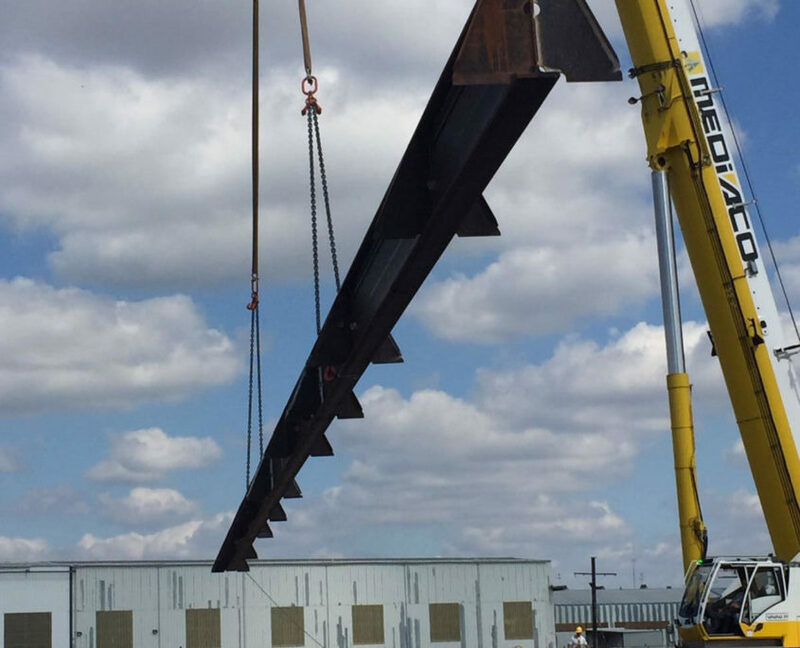 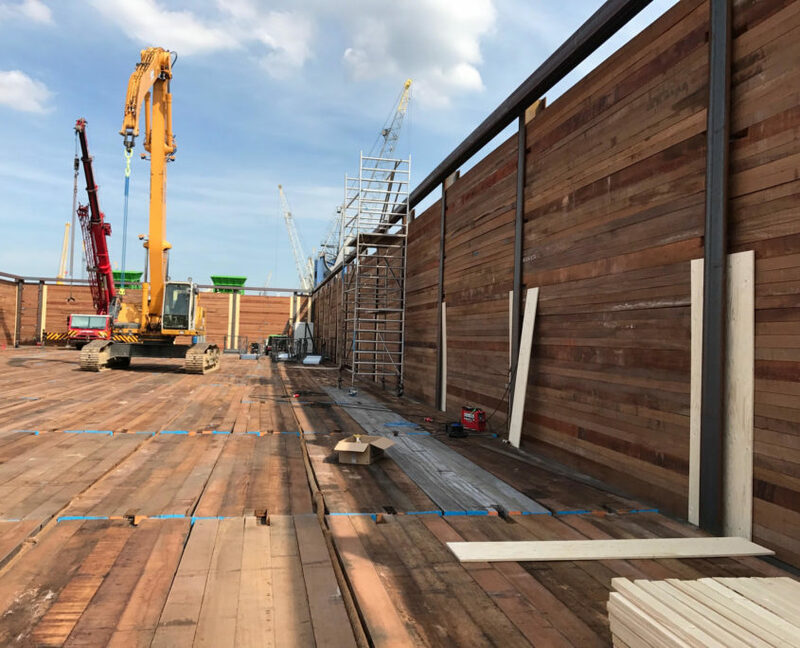 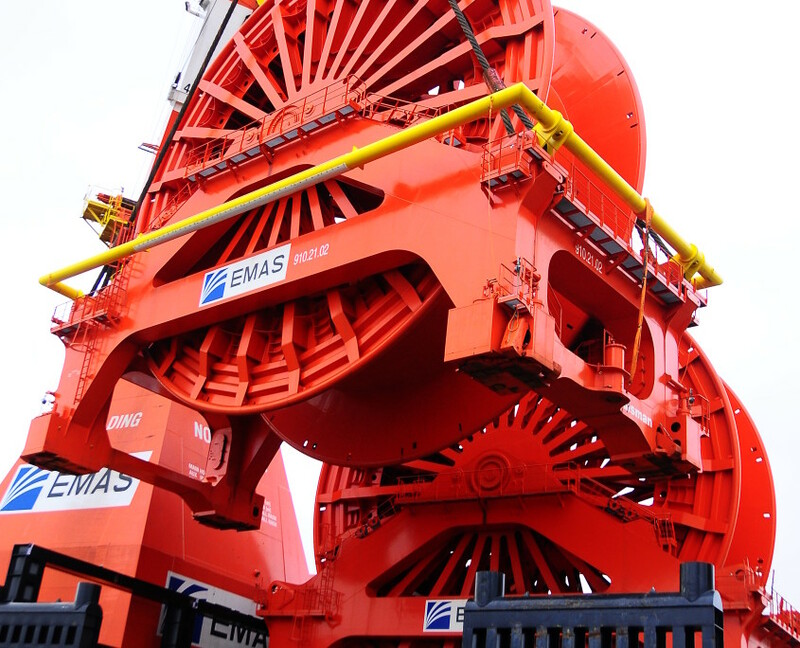 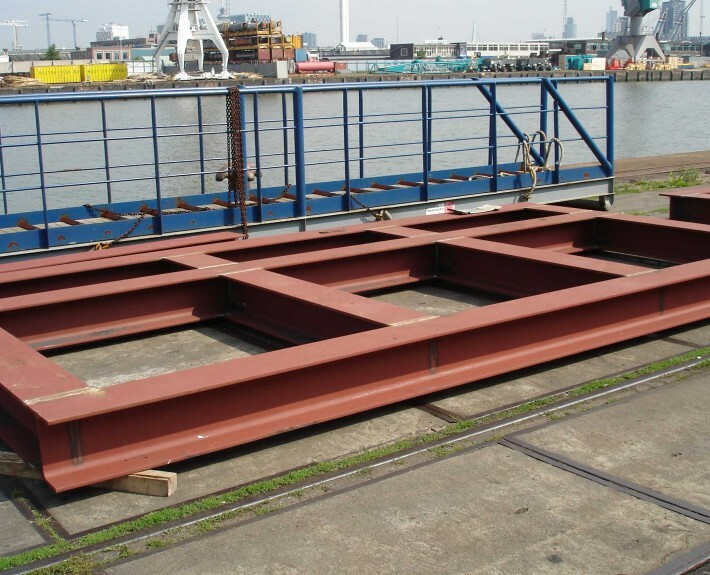 Sledge Hammer is a specialist in Offshore Steel Construction and has more than 20 years of experience in this line of business. 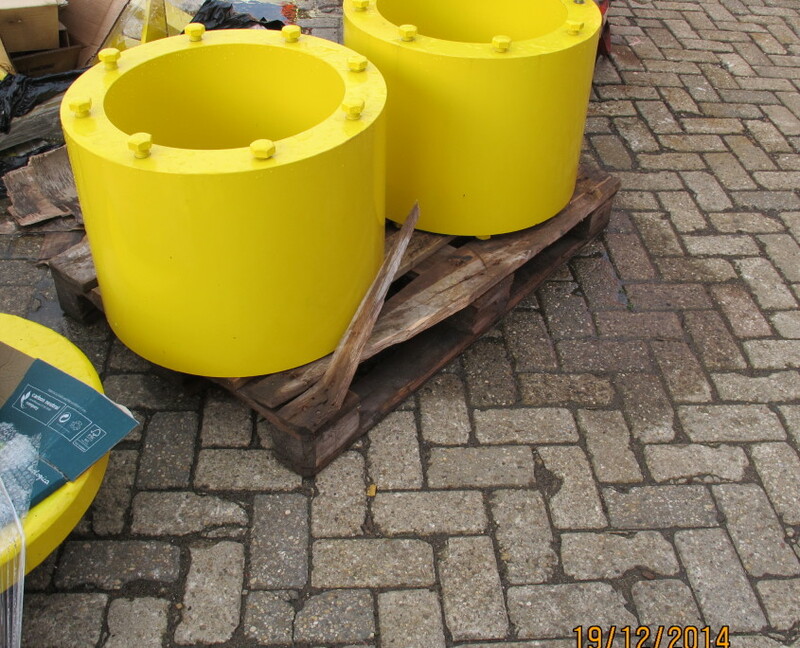 Sledge Hammer works with various steel grades and sizes. 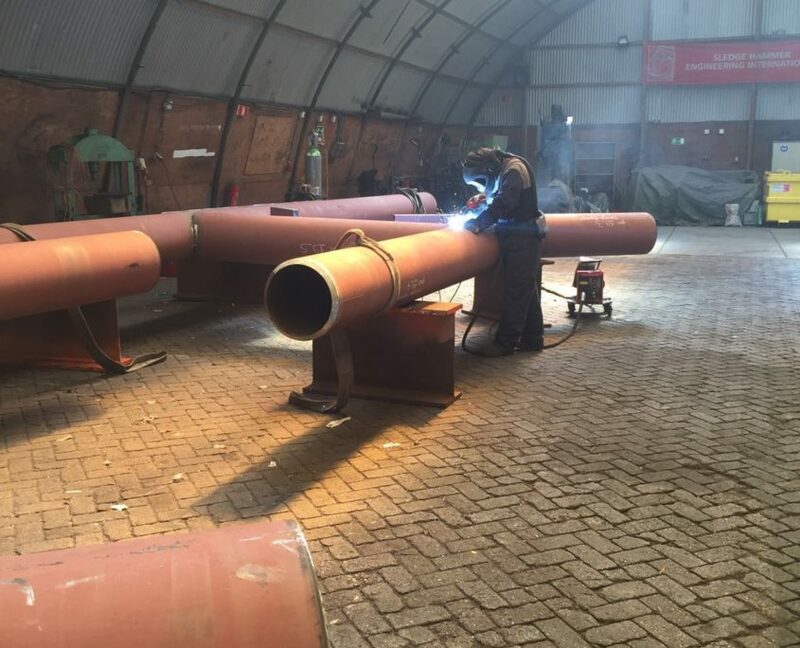 No job is too big for us as efficiency, flexibility, advanced thinking and timely delivery is always one of the red lines in our operations. 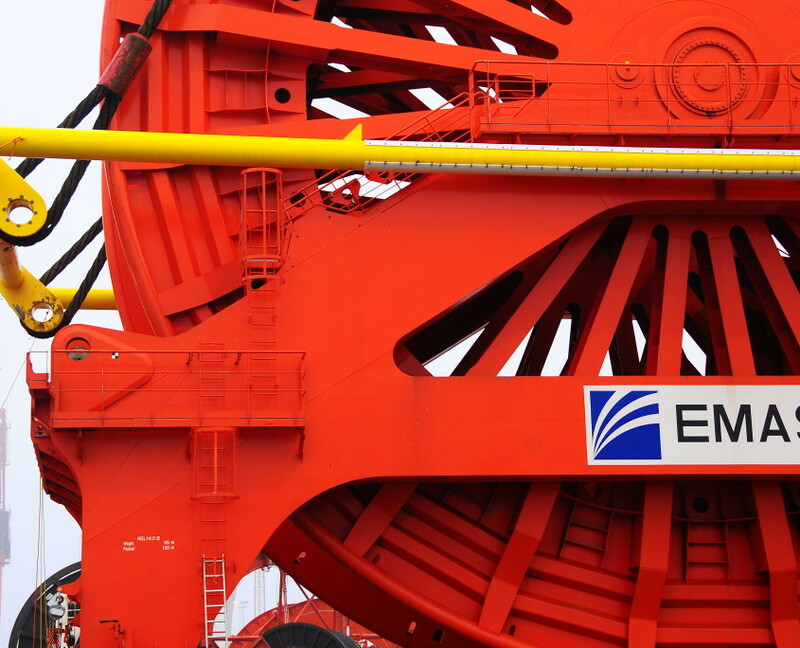 For more information or requests please contact us through our contact form by clicking here. 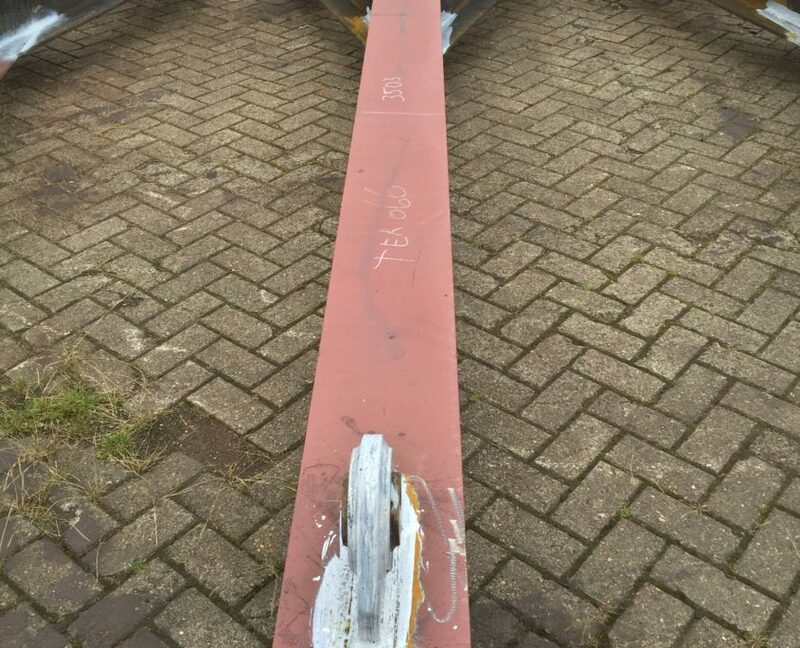 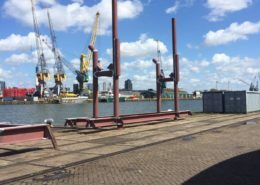 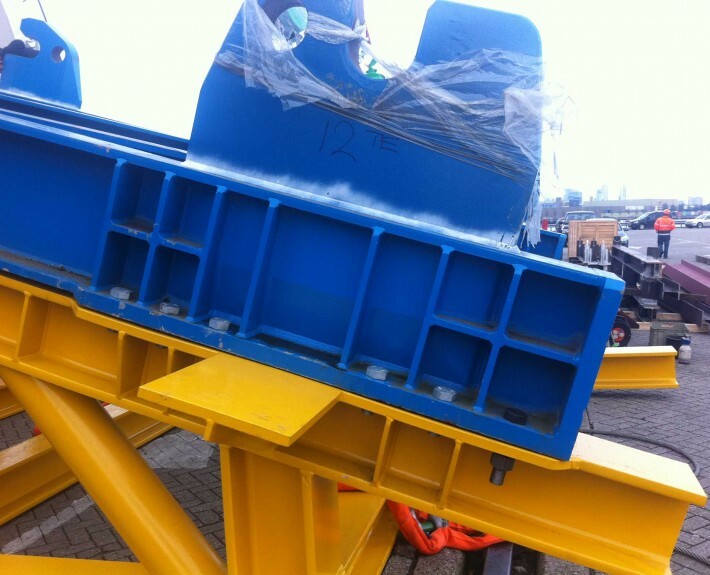 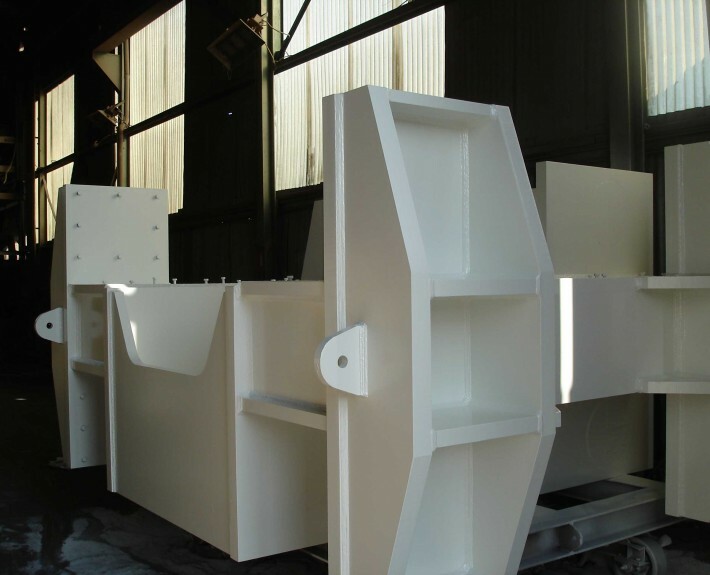 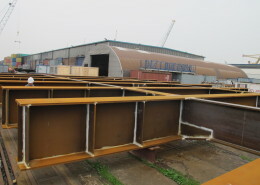 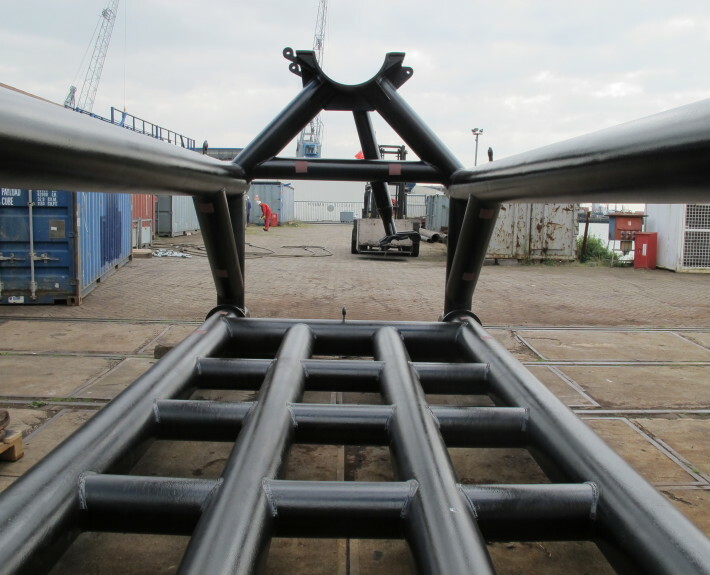 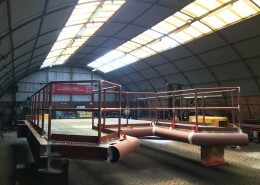 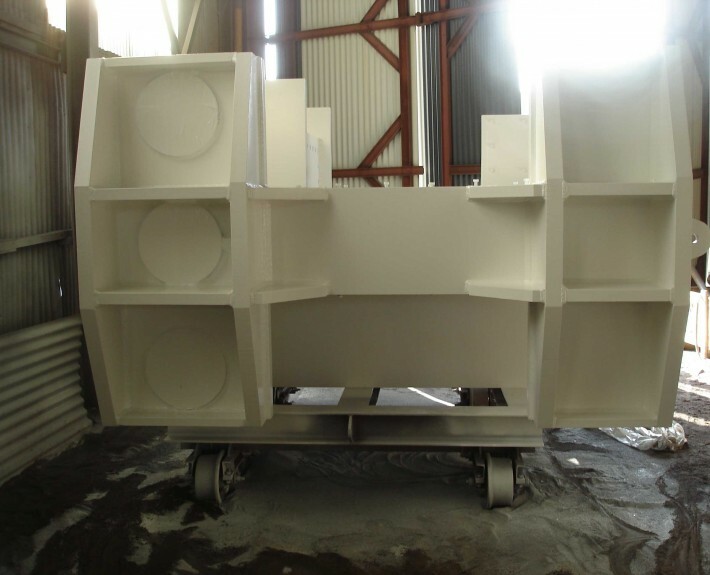 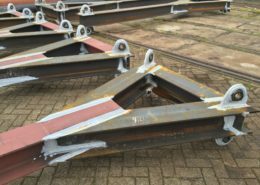 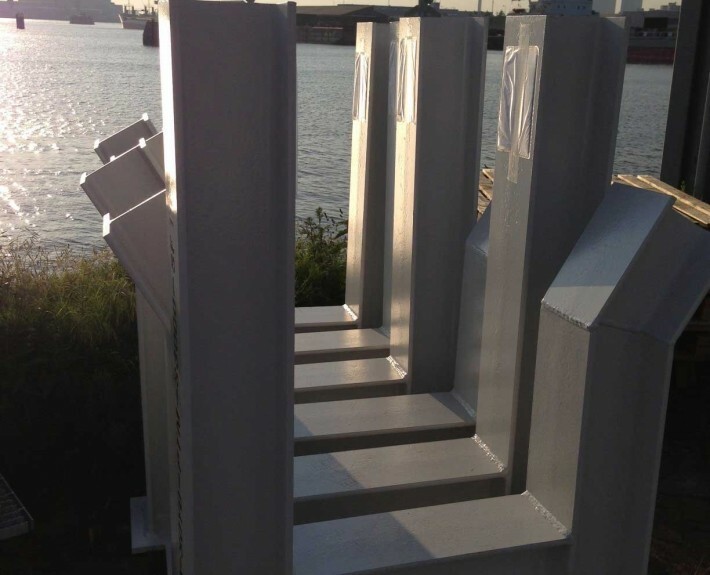 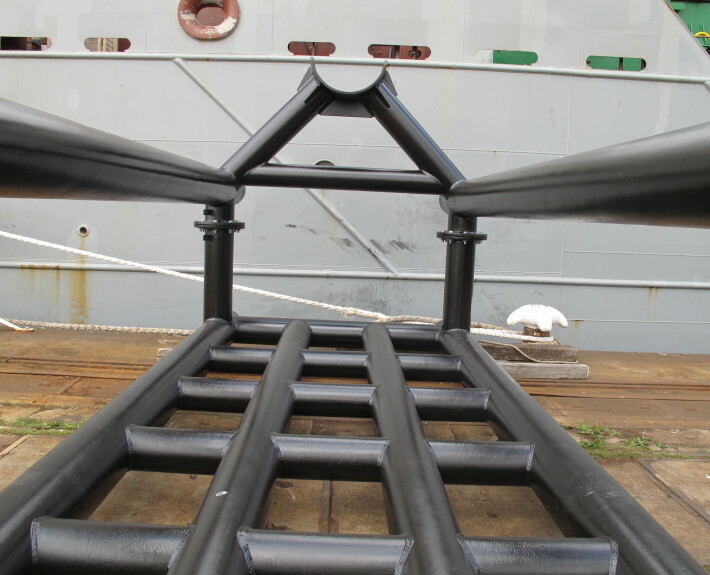 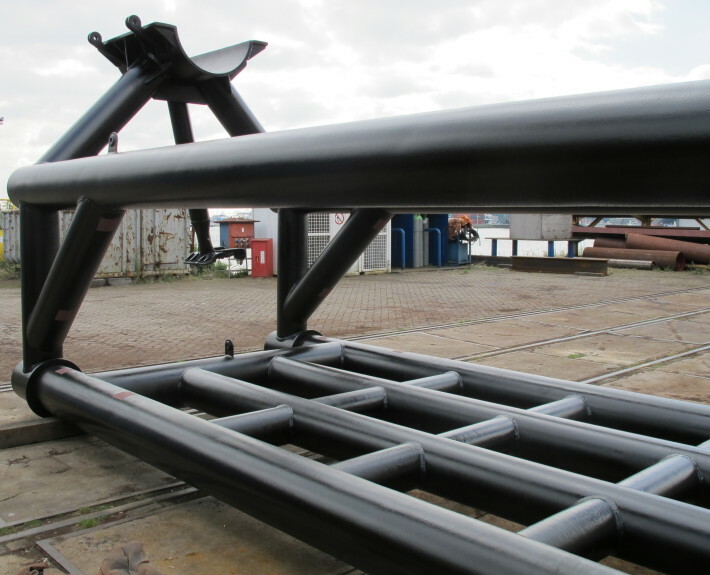 Sledge Hammer fabricated Subframes, Walkways, a Sandwall, Winch frames, Roller Box fairlead foundation, Swivel head fairlead foundation, various HPU frames and 2 Boatlandings. 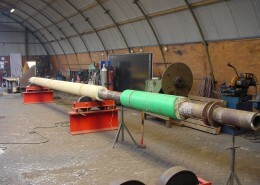 Sledge Hammer fabricated and installed the Frame for storing/ Upending frame and the Spreaderbar support for the Dong Energy project. 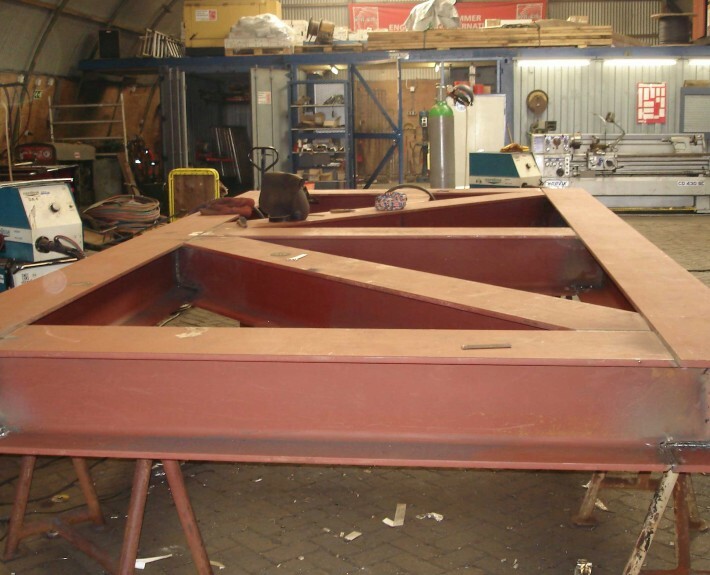 For the Vulcan & Viking project Sledge Hammer fabricated a cutting platform. 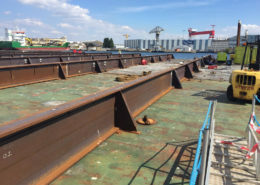 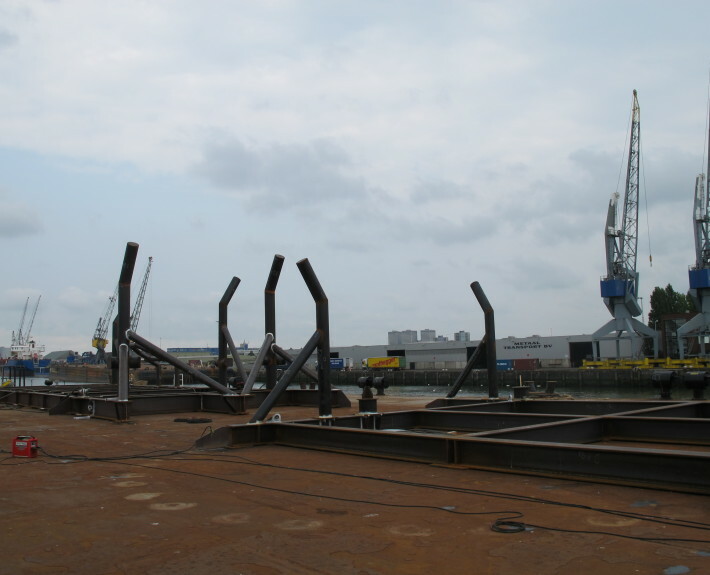 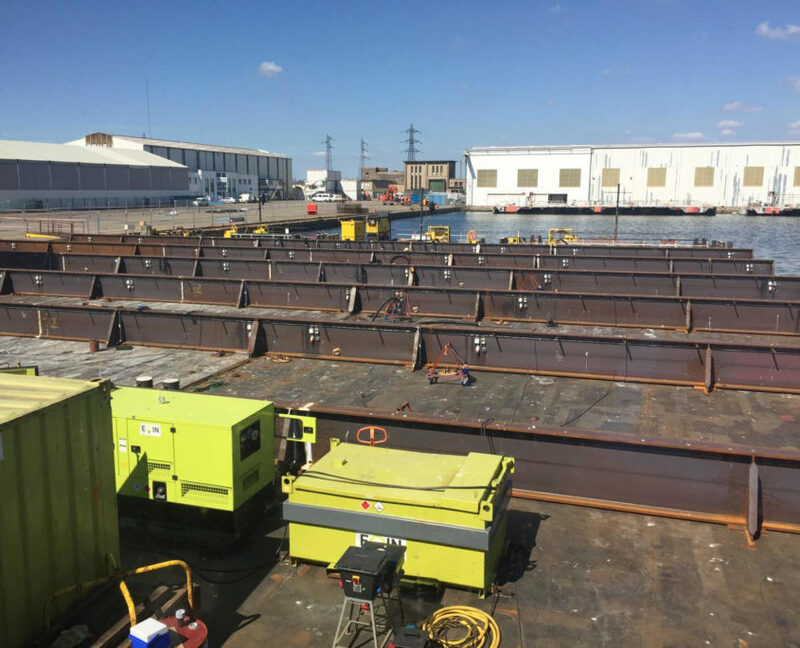 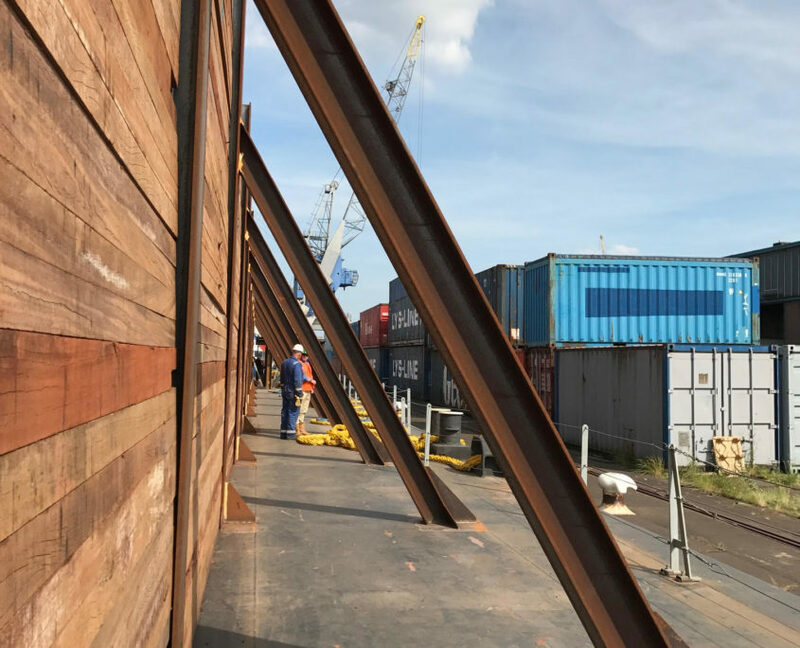 For the Trimaran project we fabricated several grillages which in turn were installed on Barge 6615 in Saint Nazaire, France. 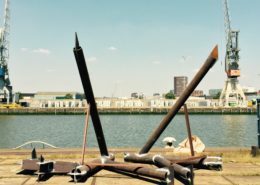 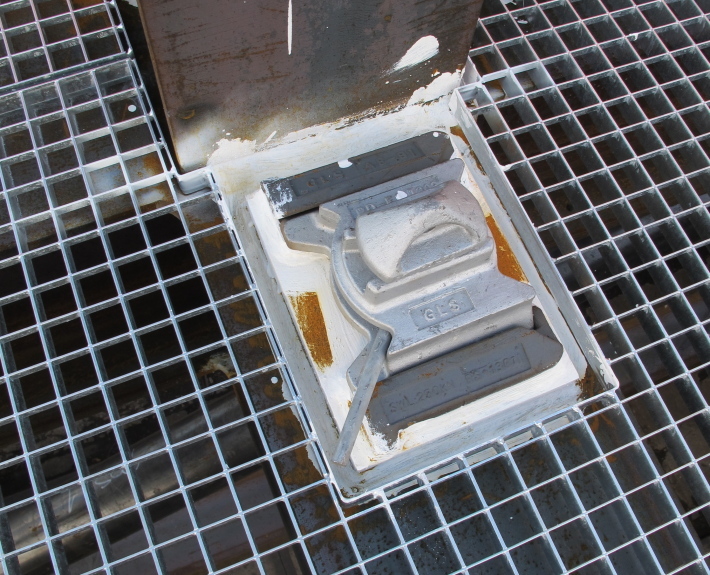 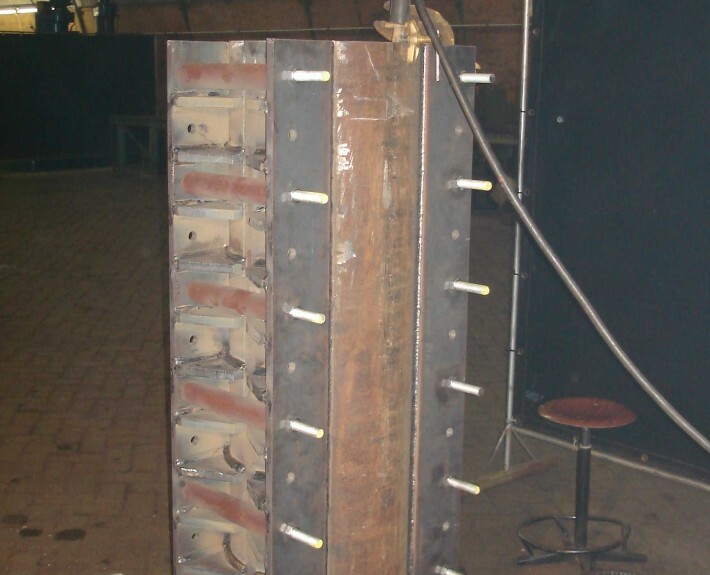 These grillages were used to connect 3 barges to each-other. 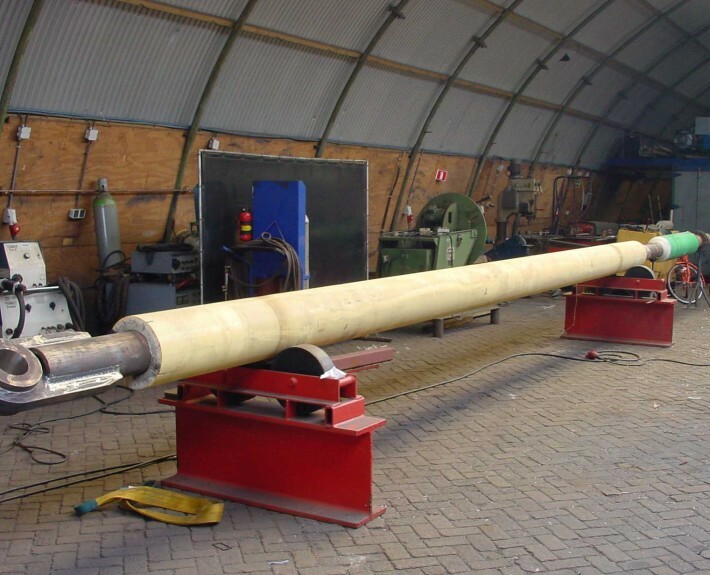 Sledge Hammer fabricated several spreaderbars for PLET/ skidframes. 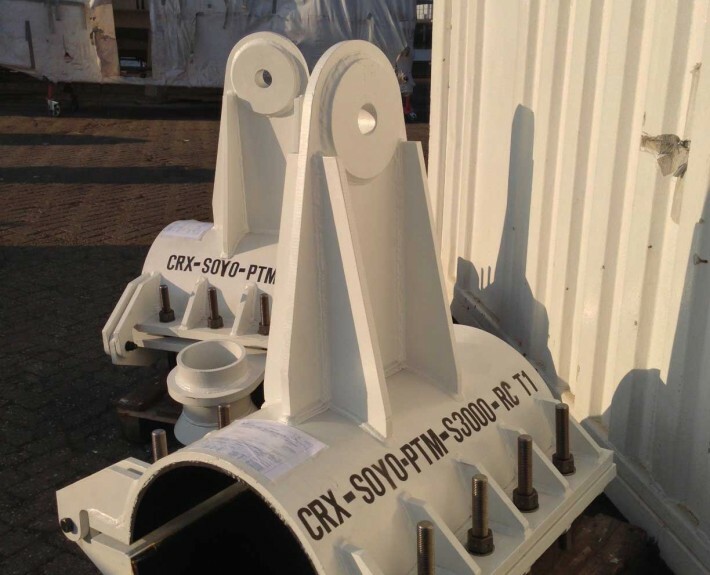 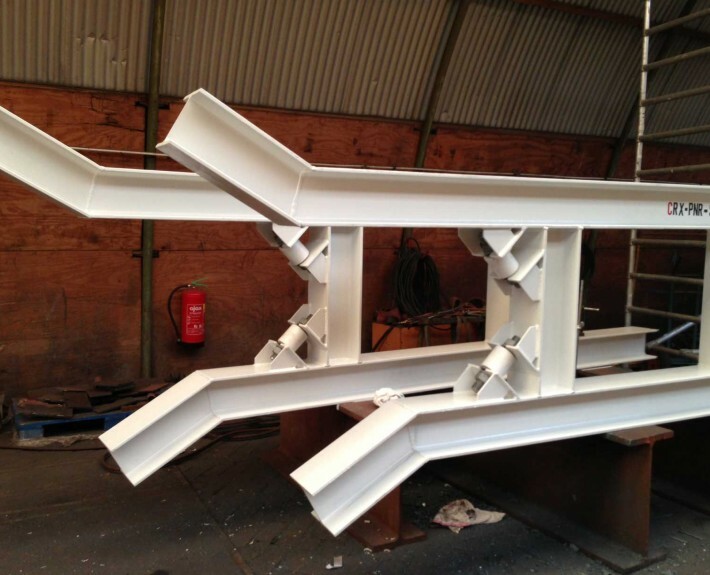 For the Alder Topside Project we fabricated spreader bar supports. 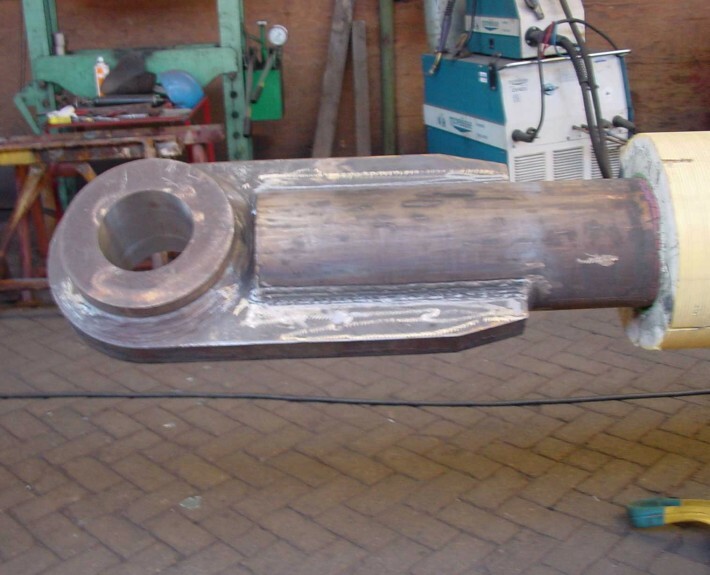 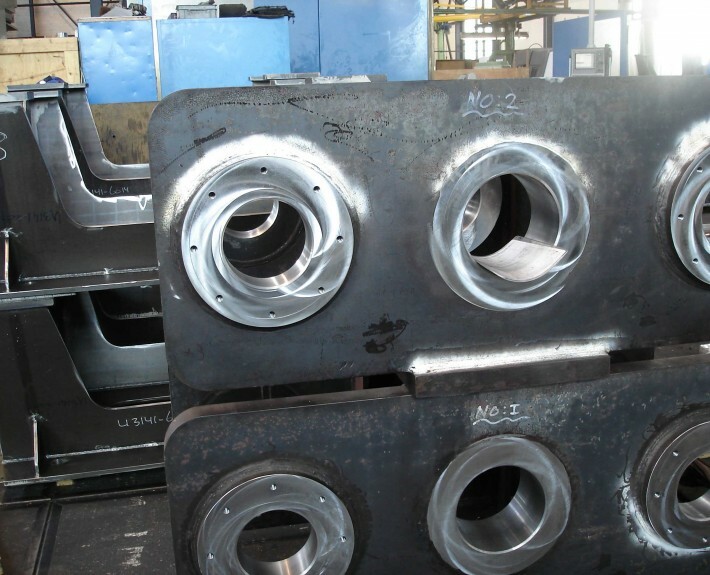 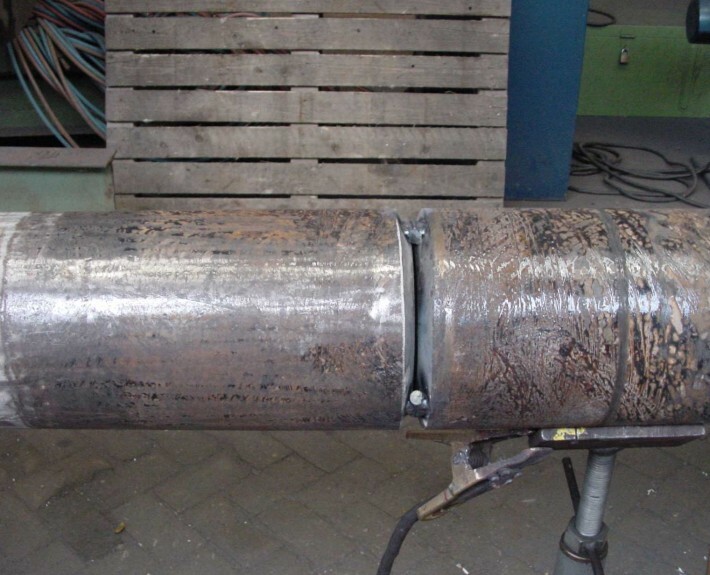 For the Stanislav Yudin we have fabricated one off blockpocket for M2H 1200mt hook, 1 off blockpocket for AH 750mt hook, 1 off foundation for M2H blockpocket and 1 off foundation for AH blockpocket. 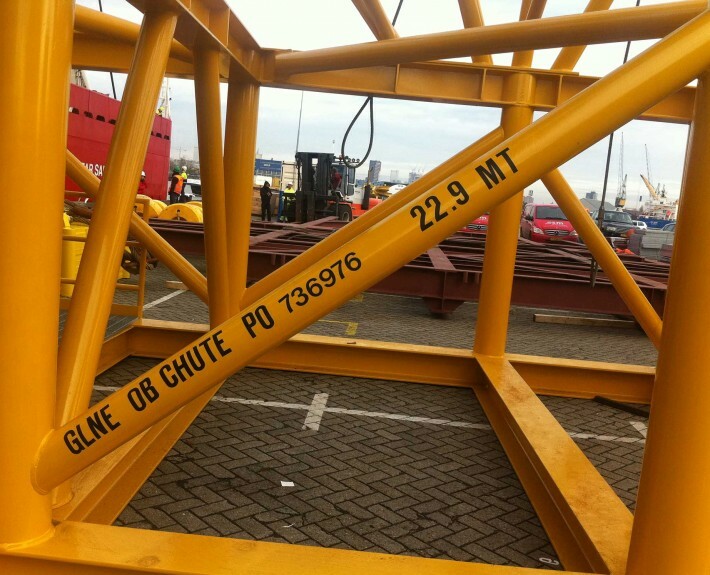 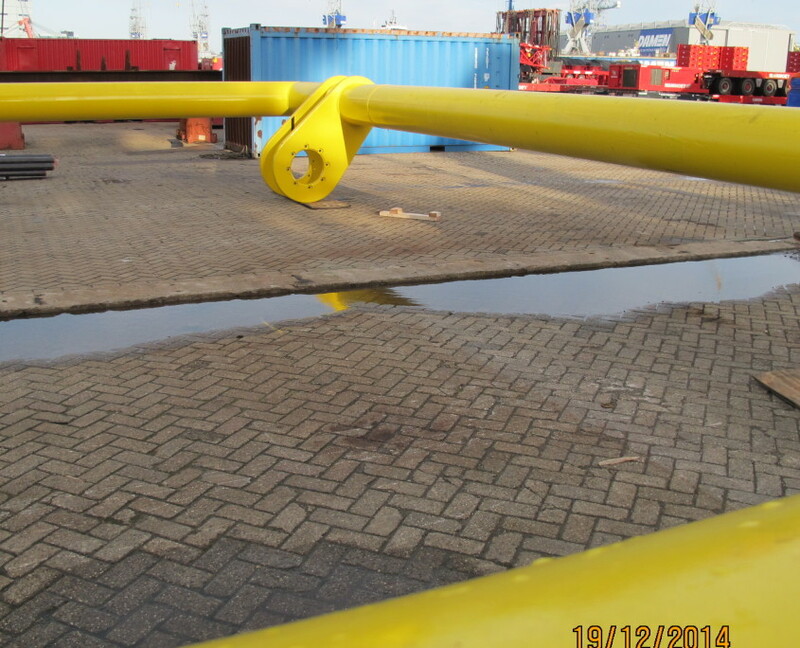 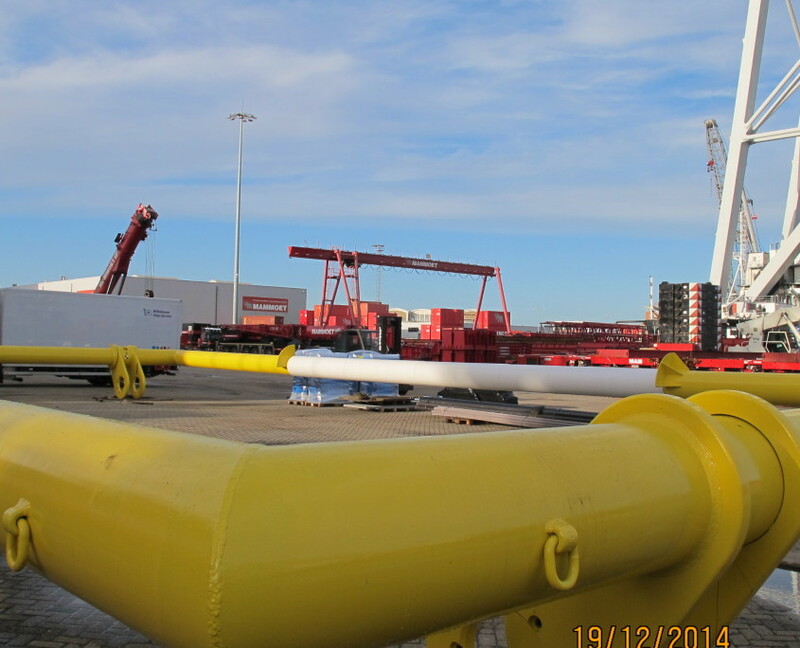 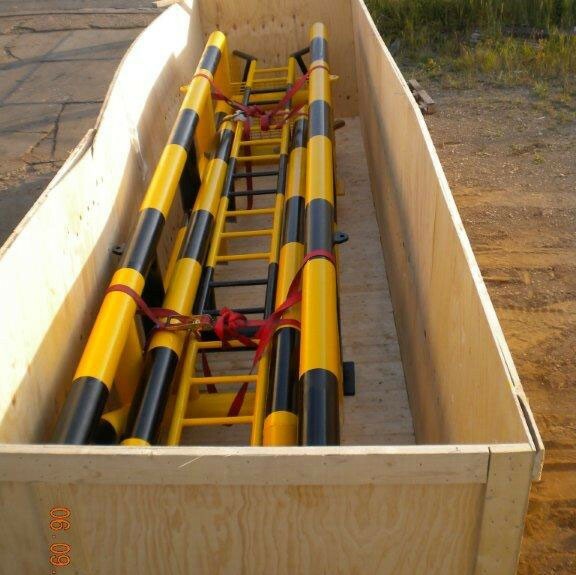 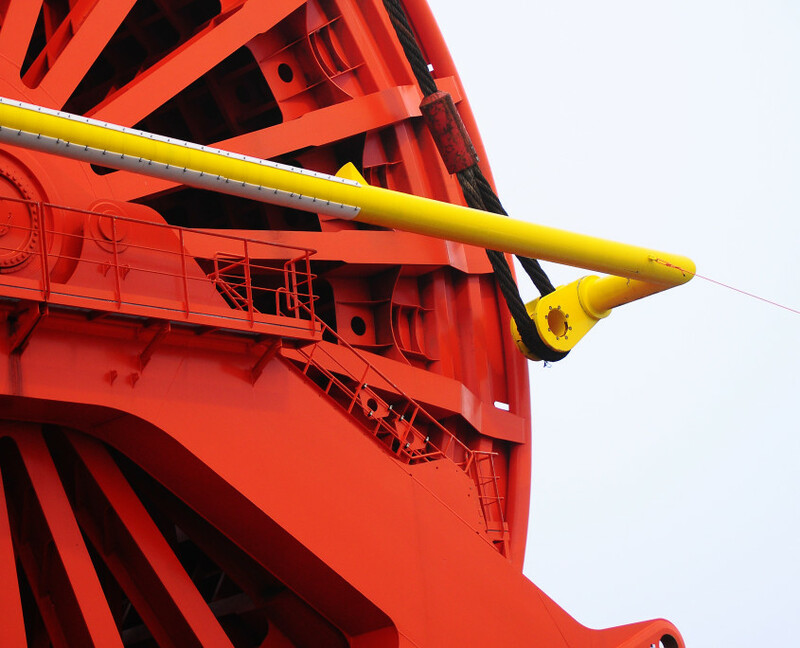 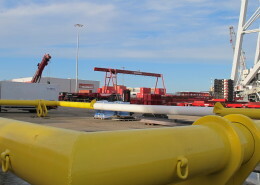 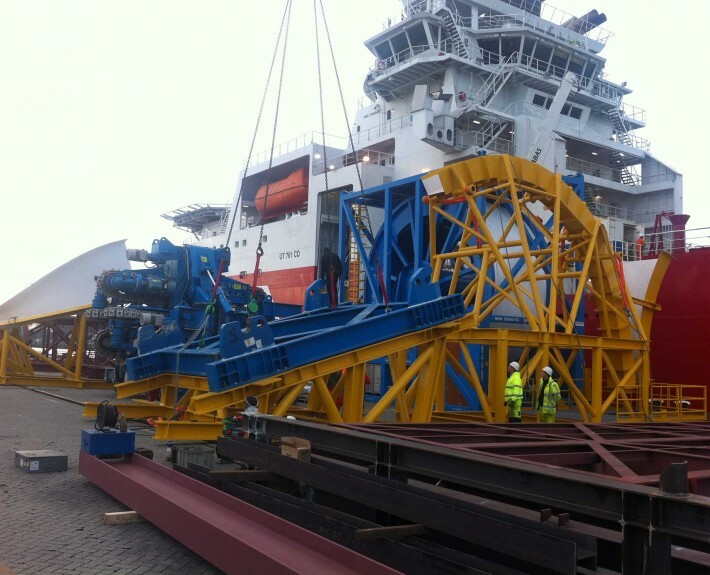 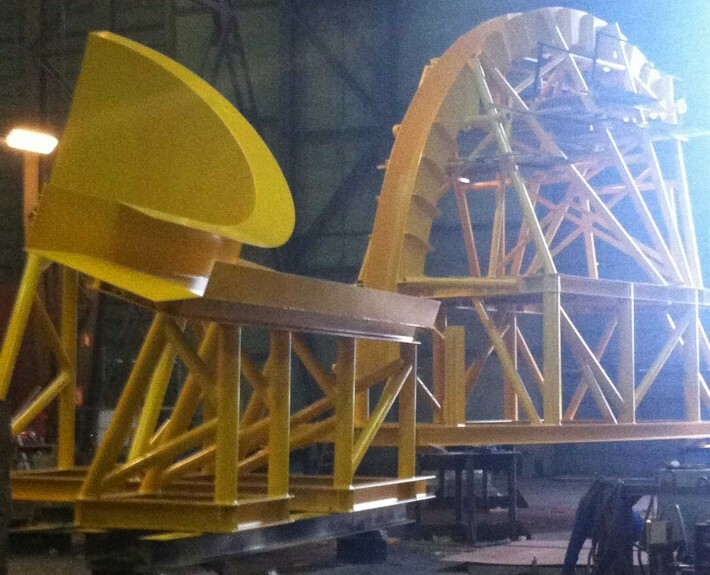 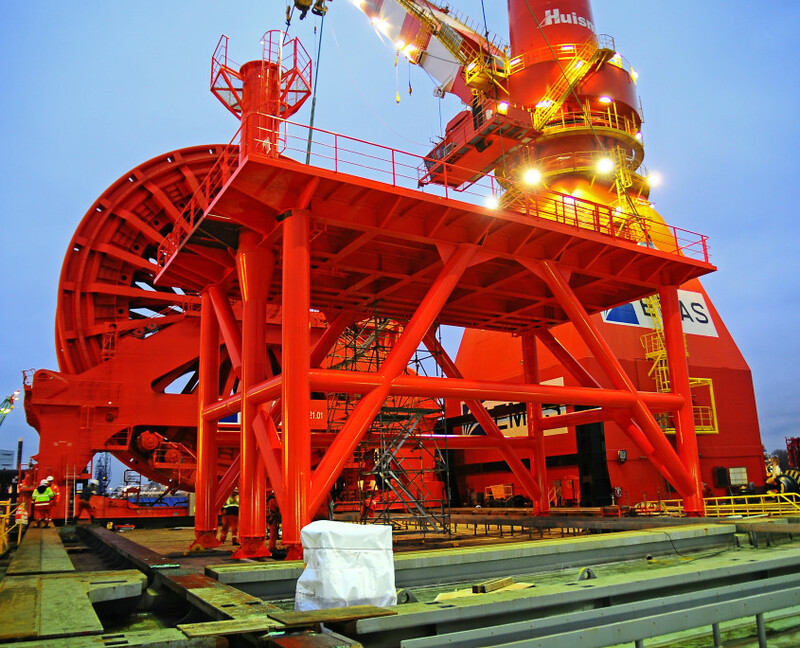 Sledge Hammer fabricated the Outrigger Access Platform for the Oleg Strashnov in line of the Gullfaks Subsea Compression project of Subsea 7. 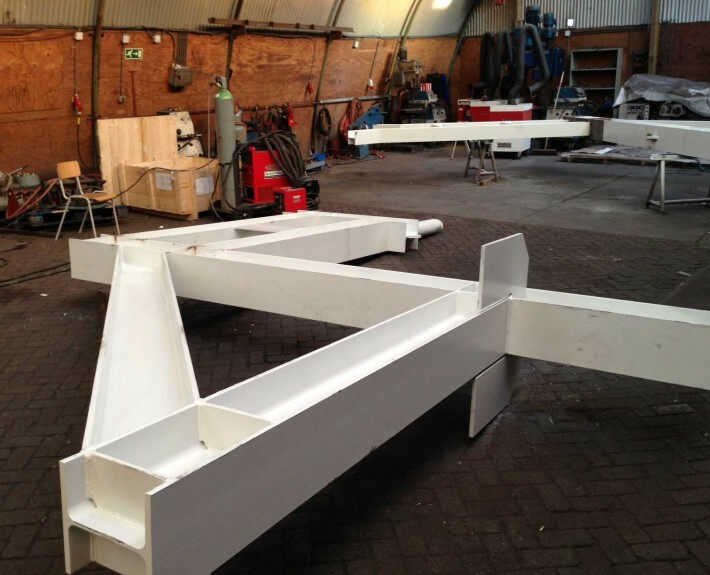 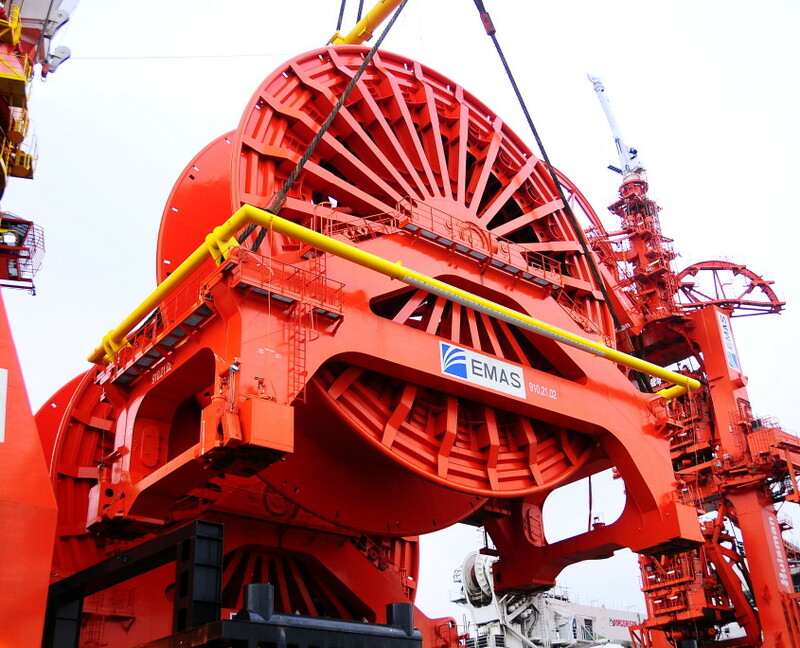 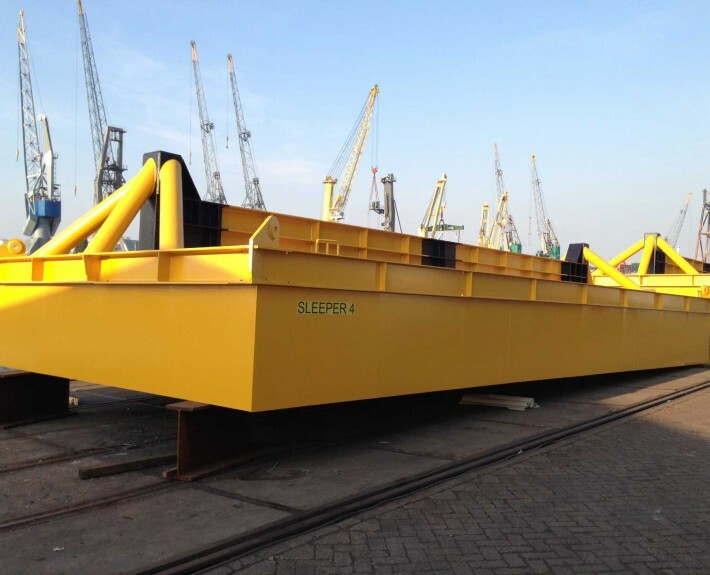 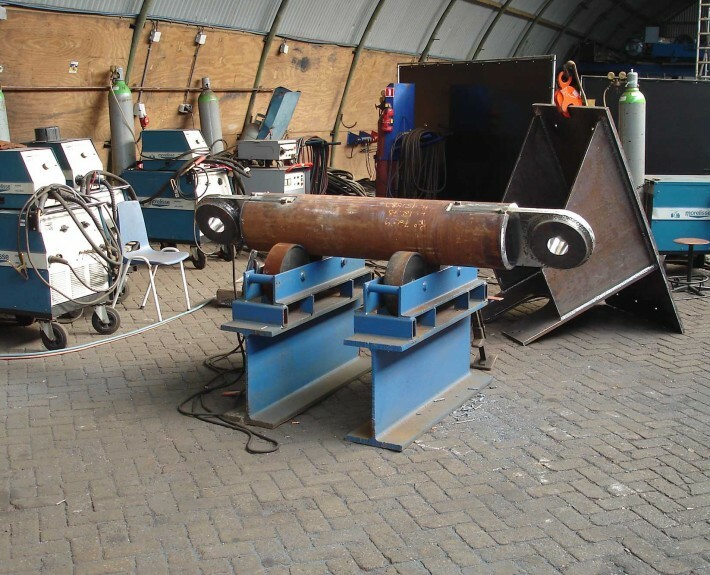 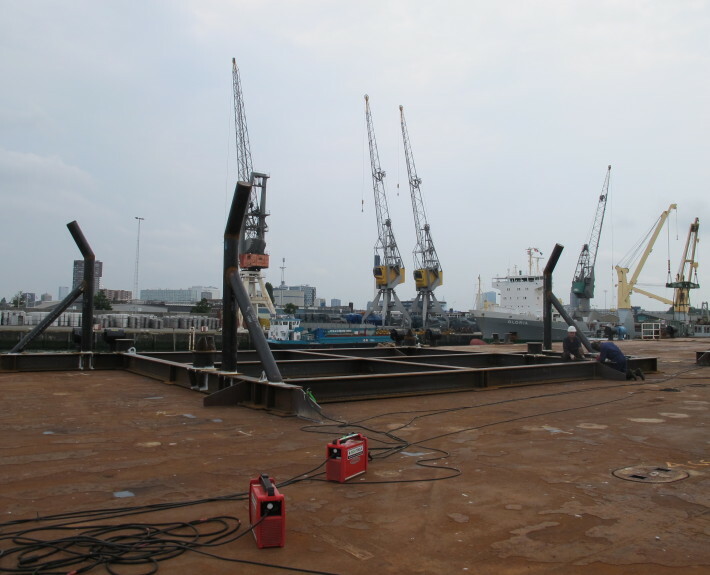 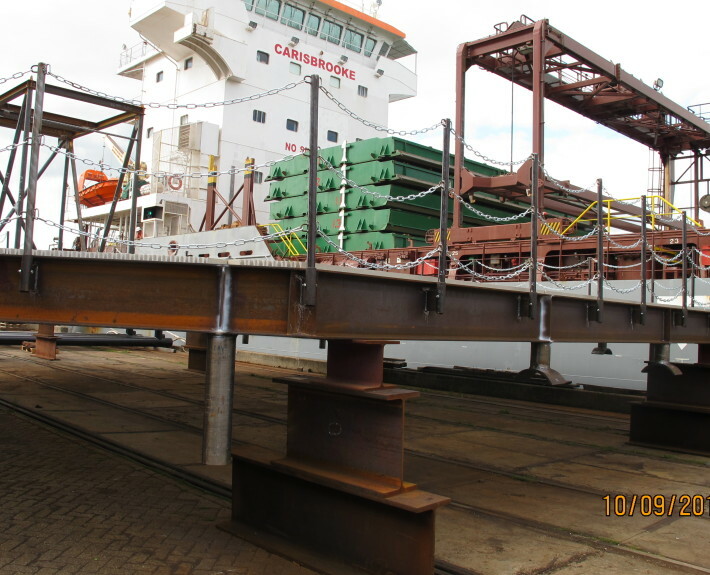 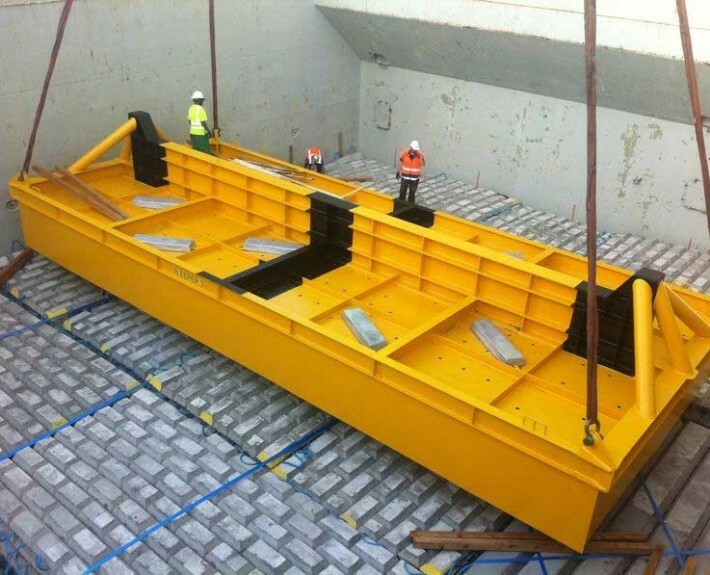 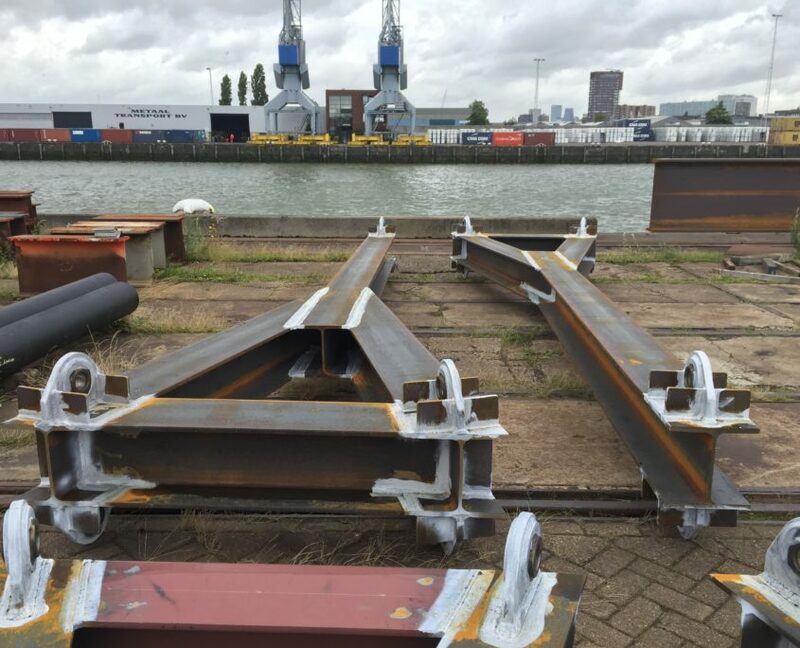 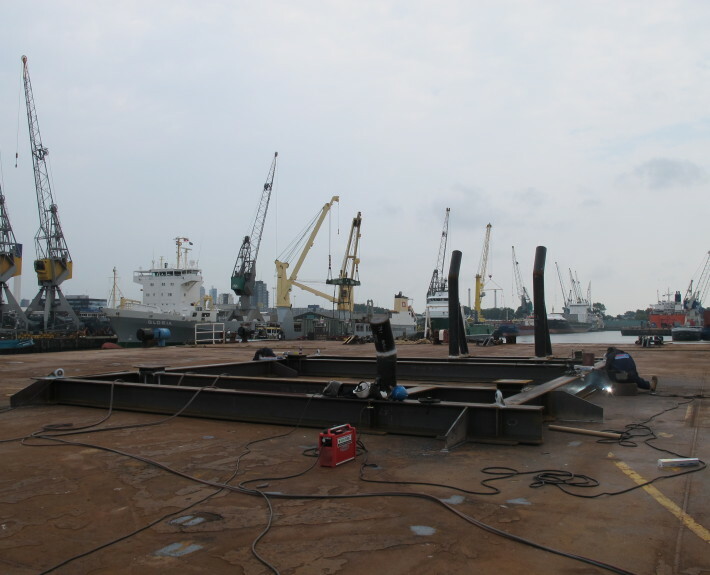 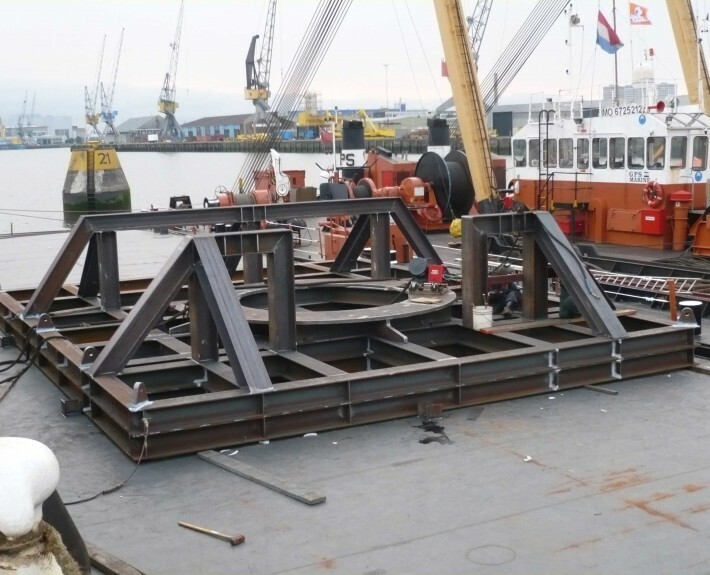 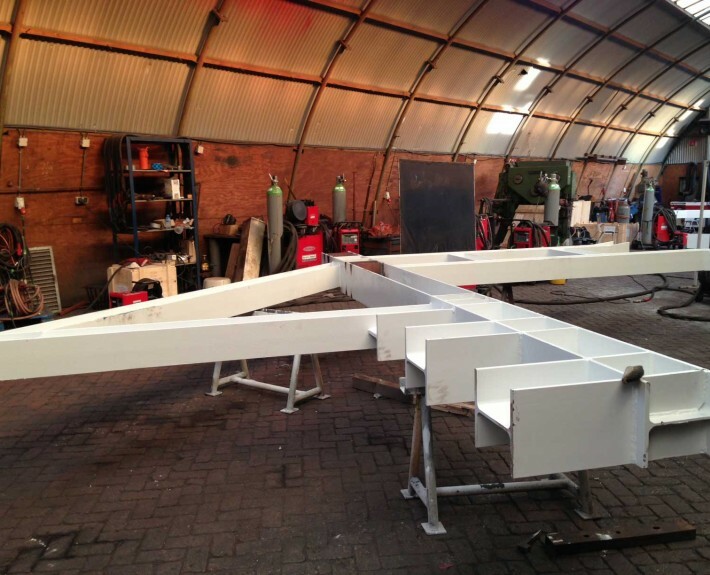 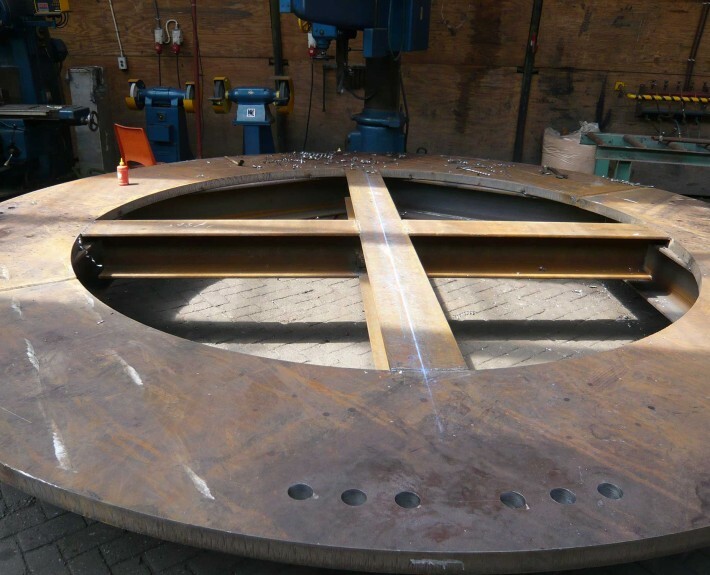 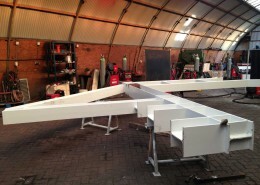 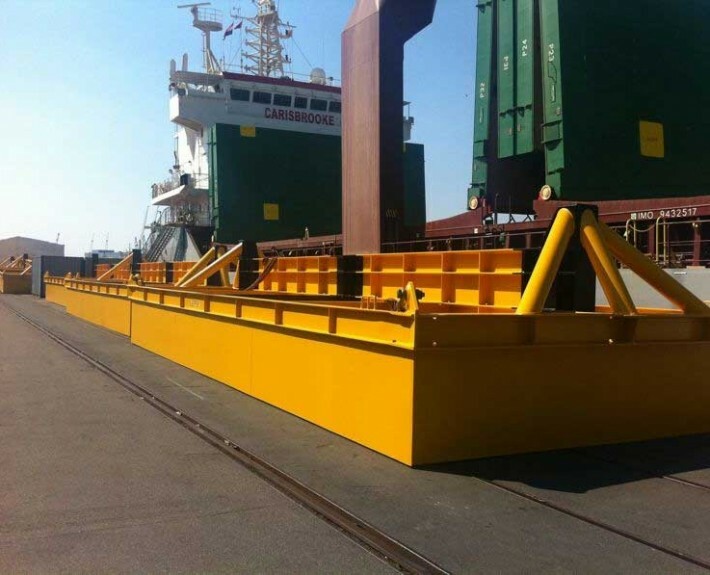 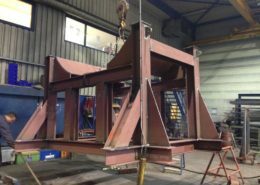 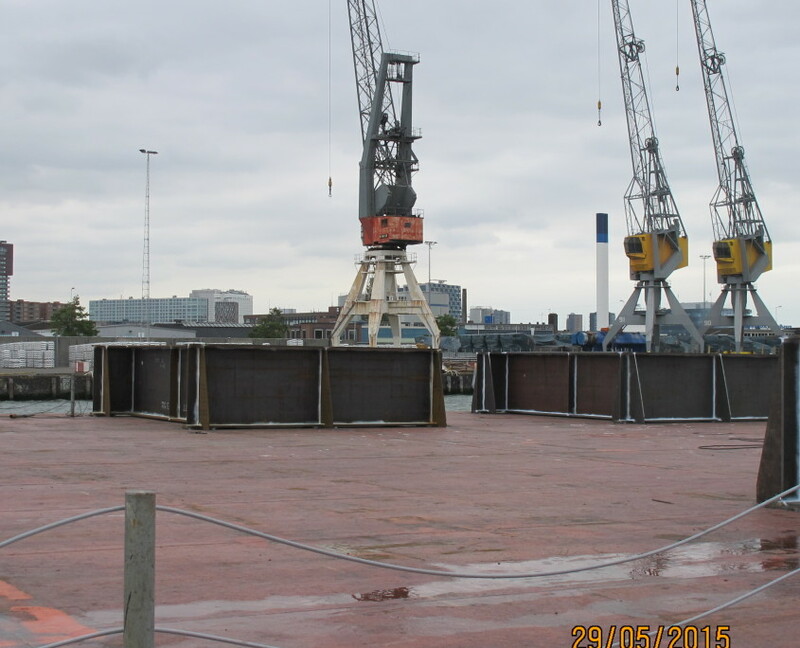 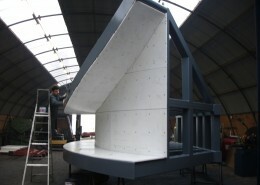 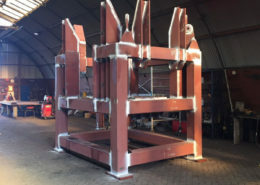 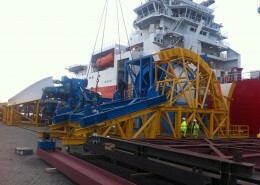 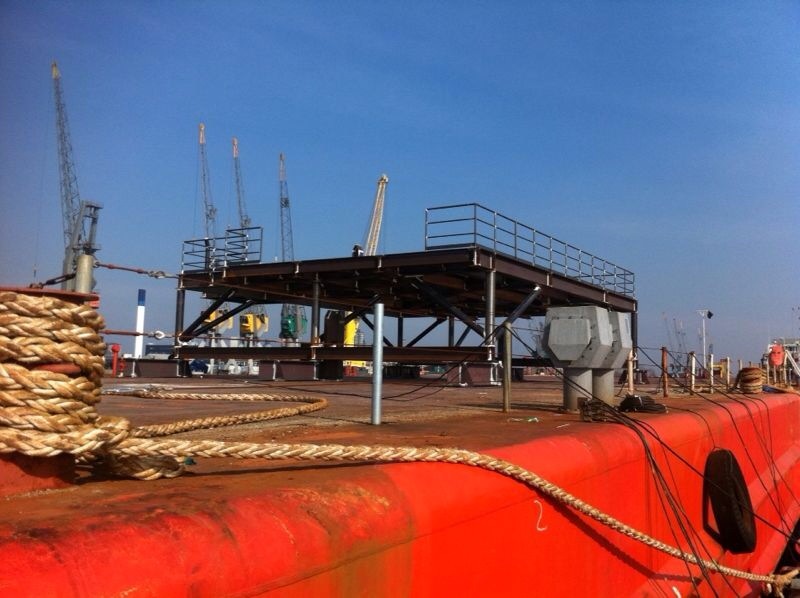 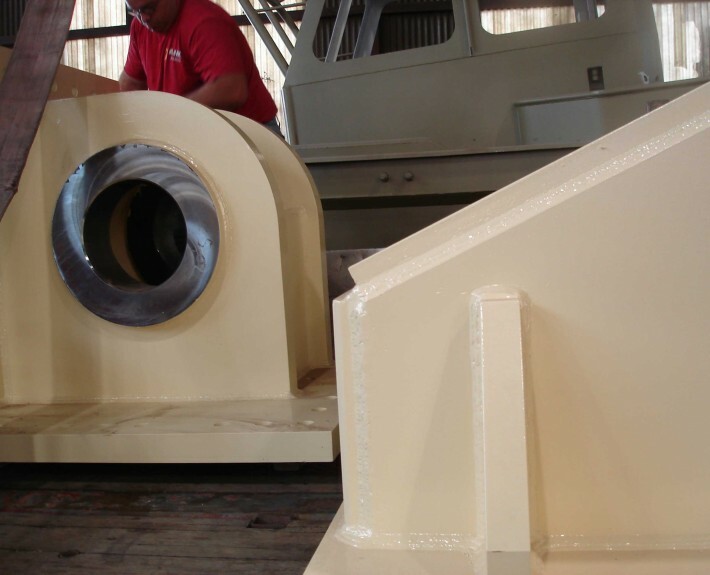 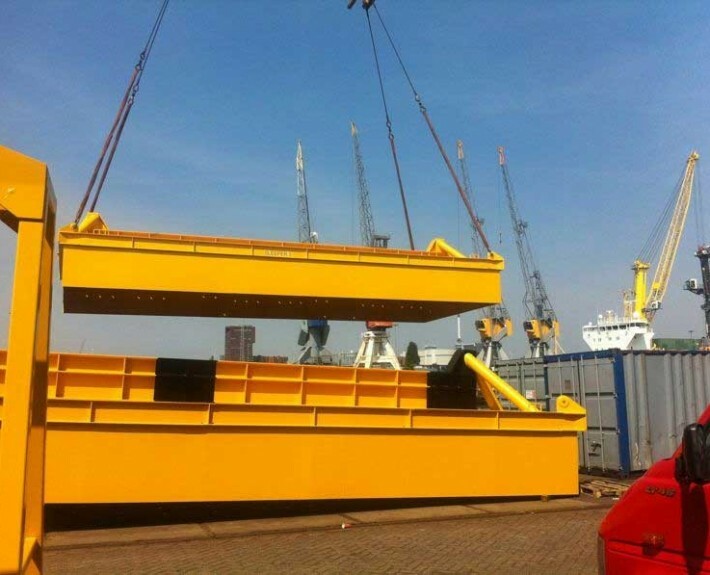 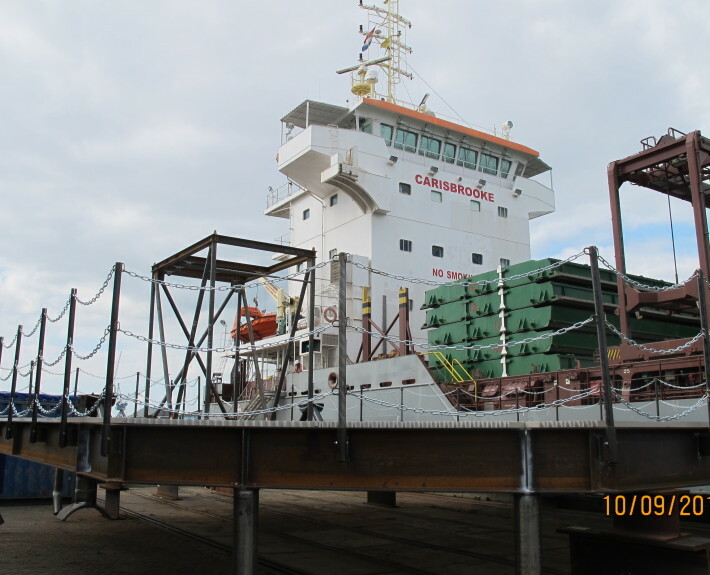 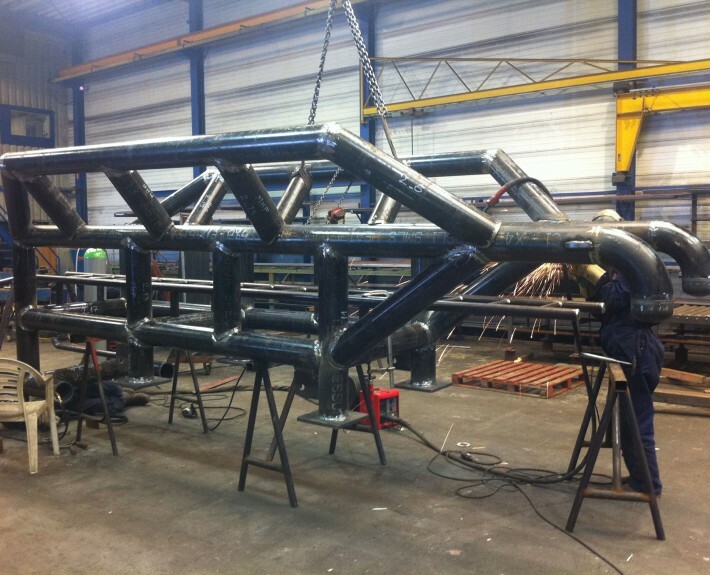 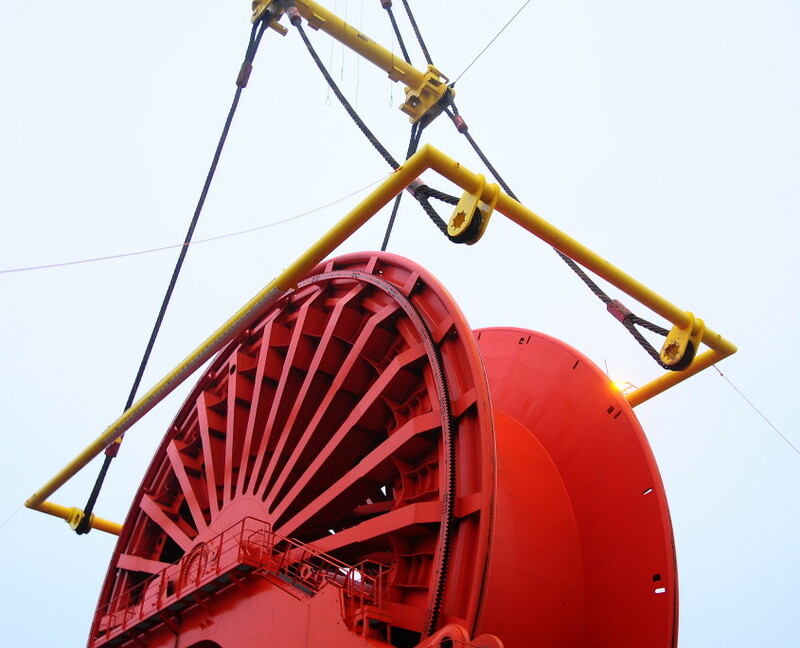 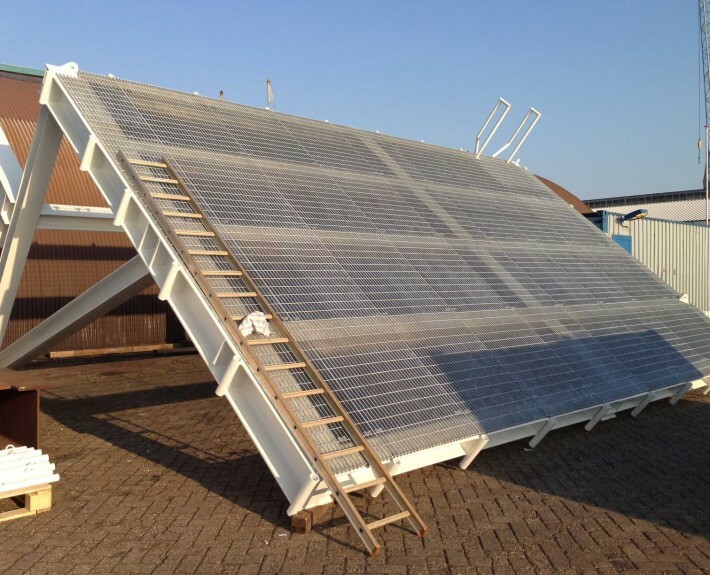 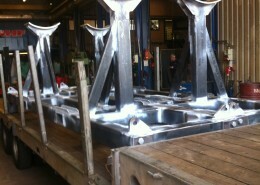 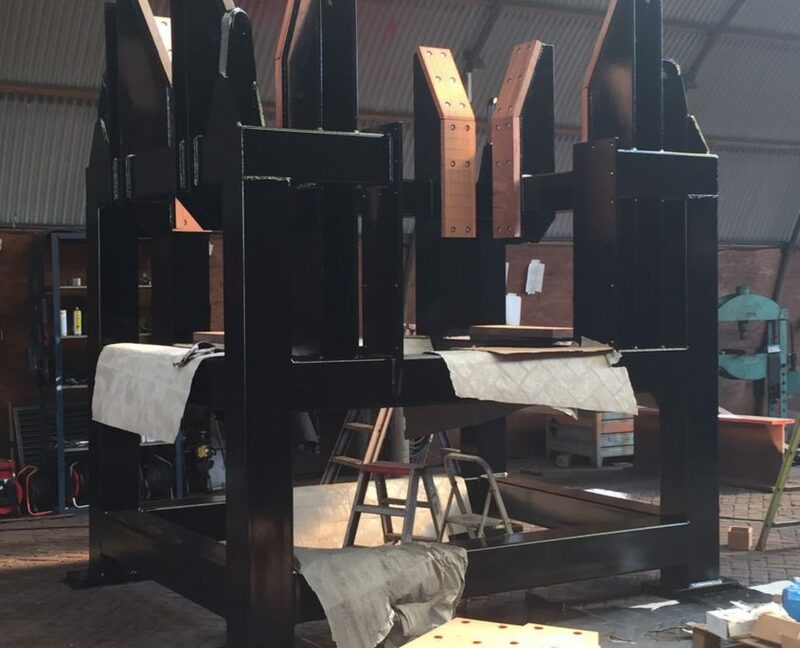 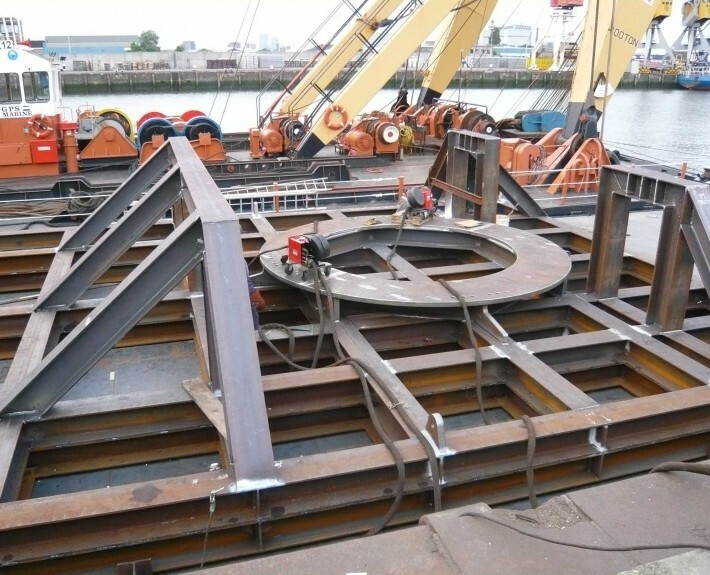 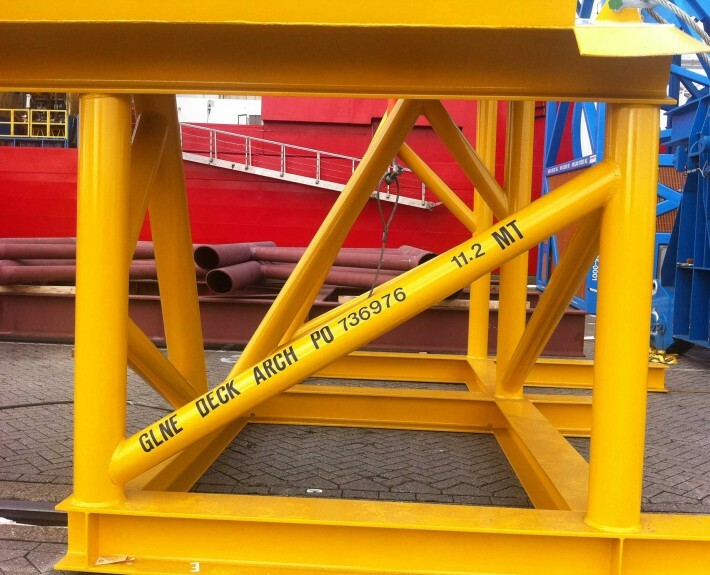 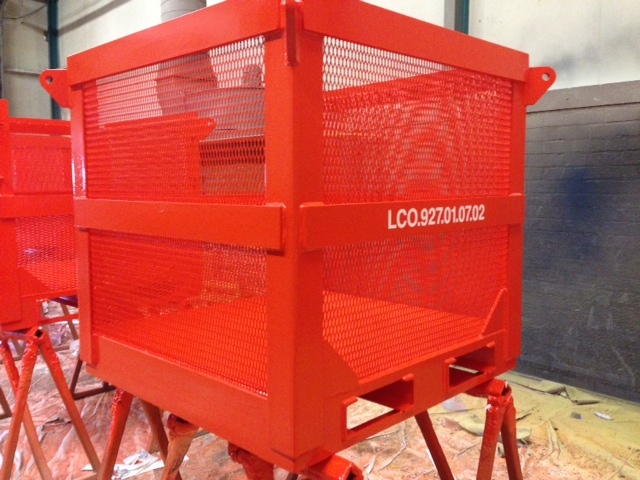 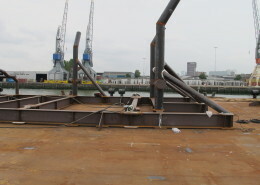 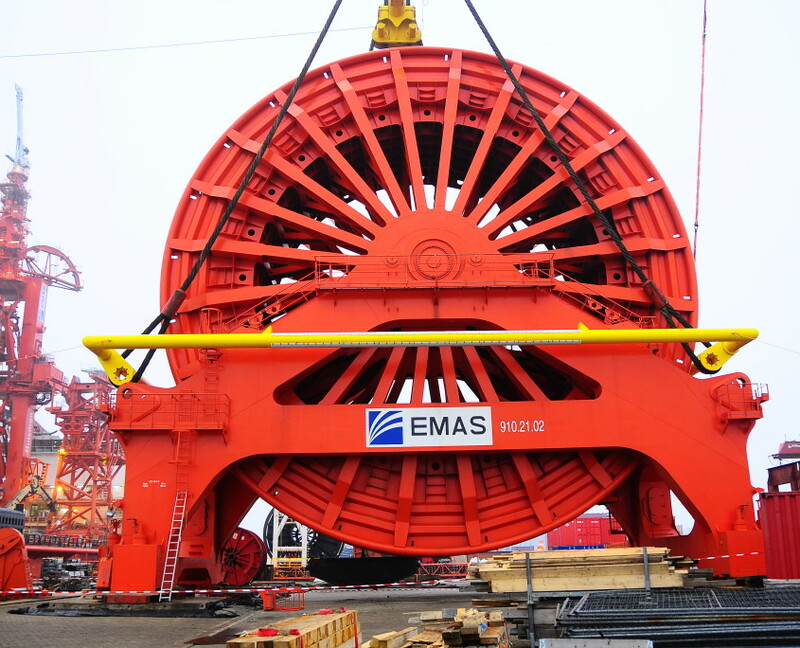 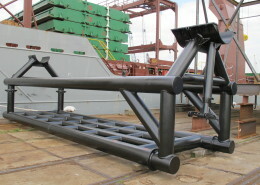 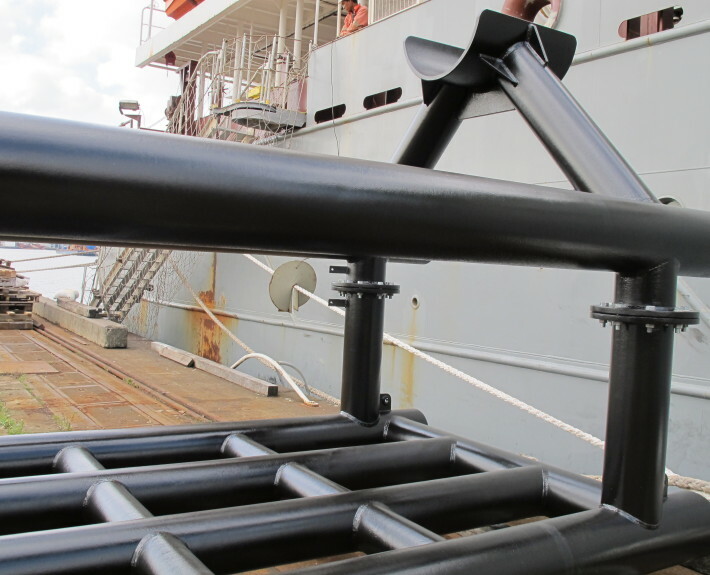 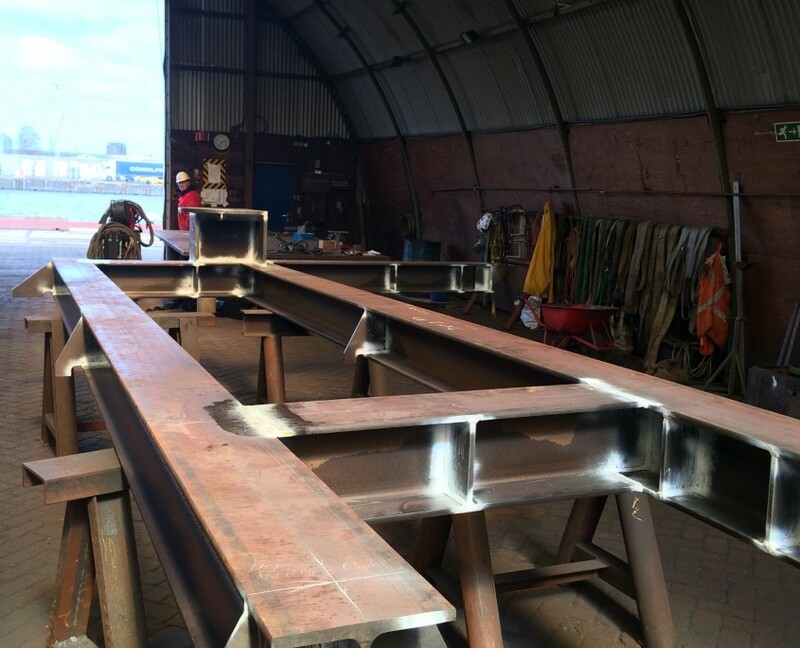 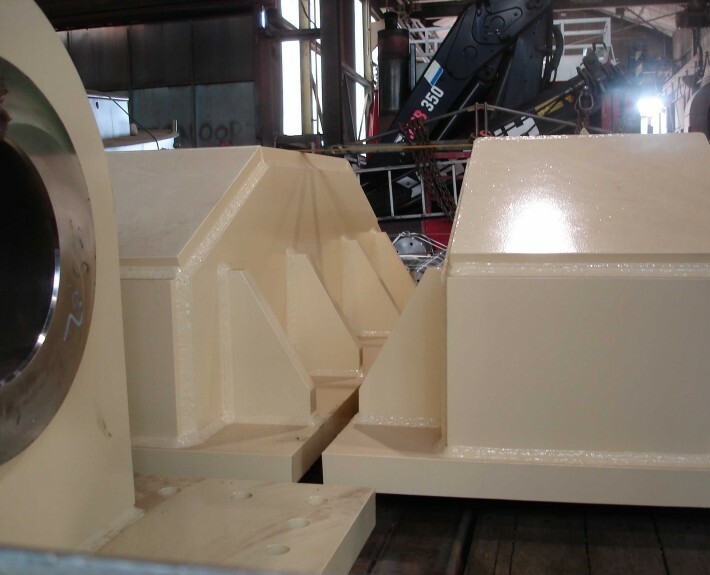 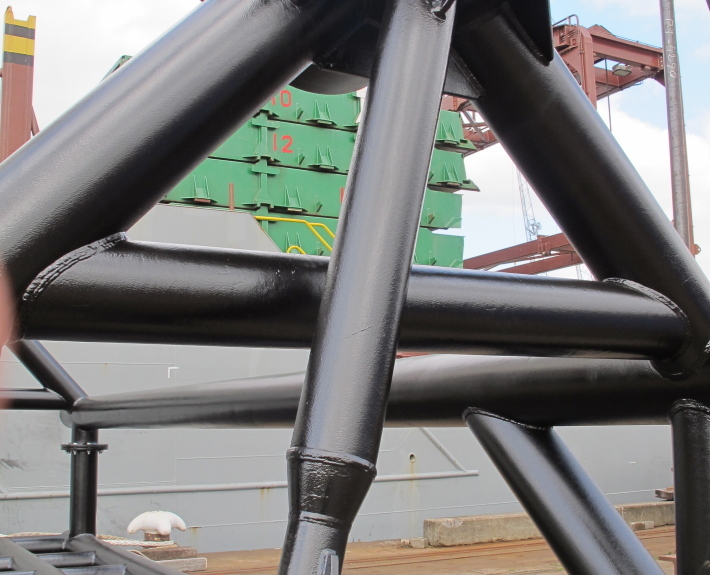 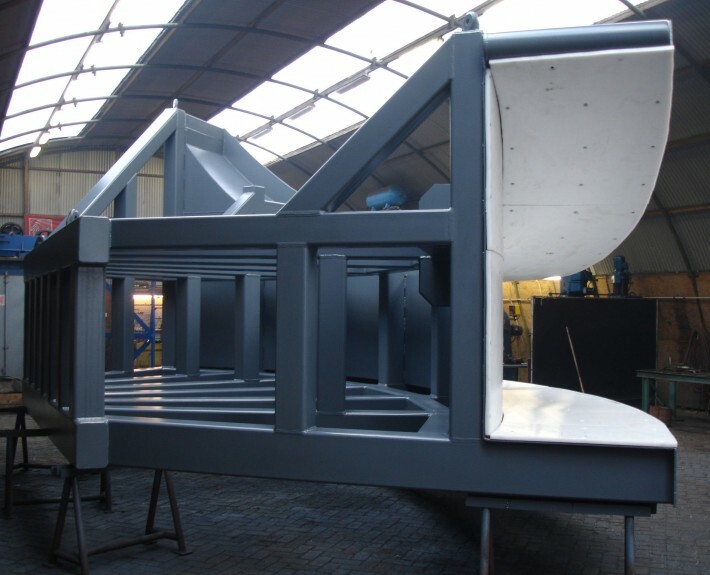 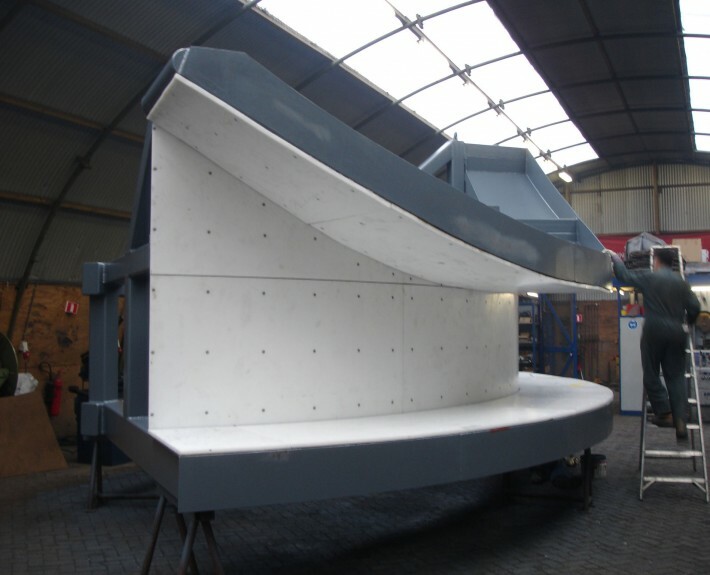 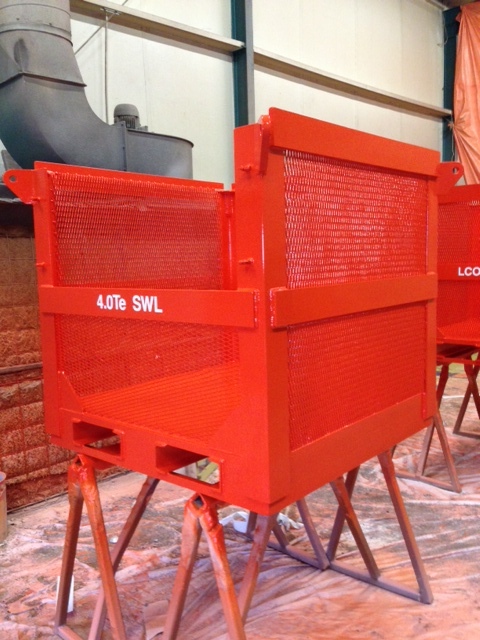 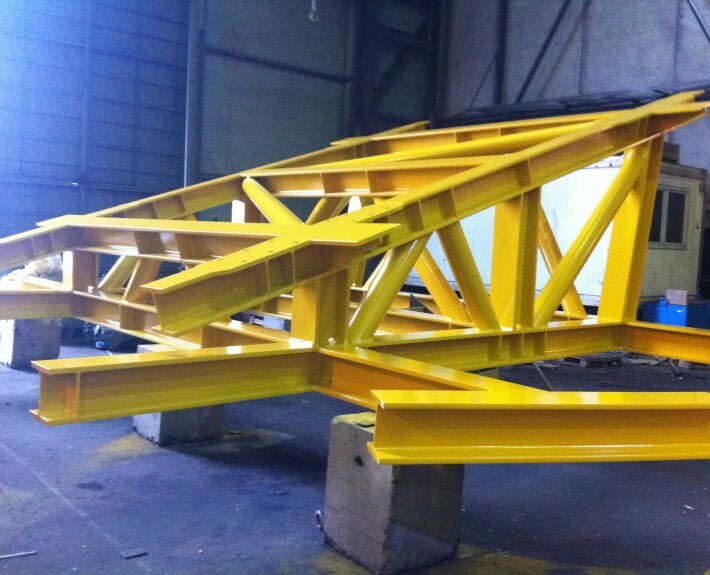 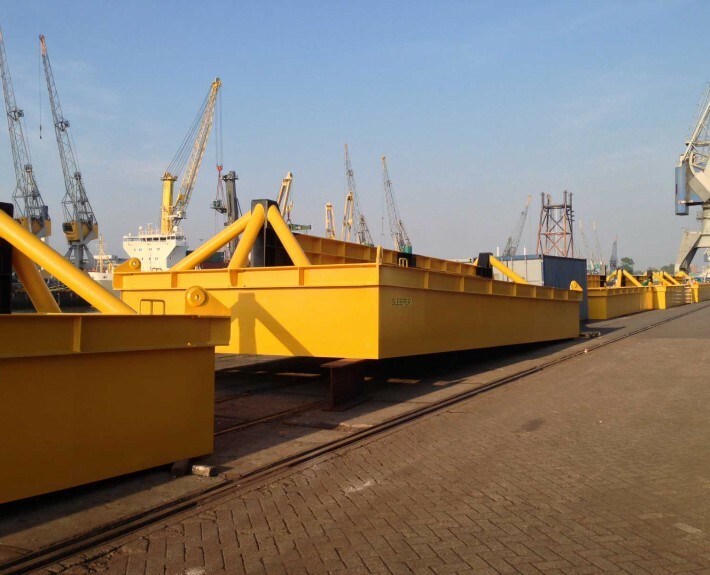 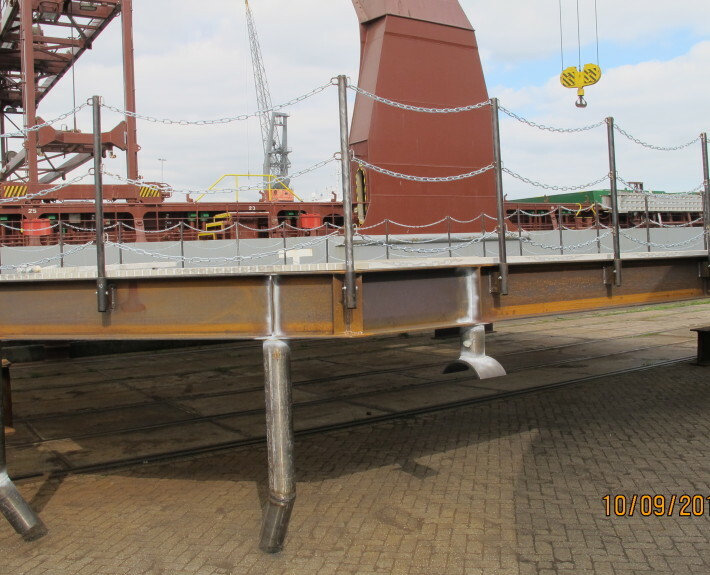 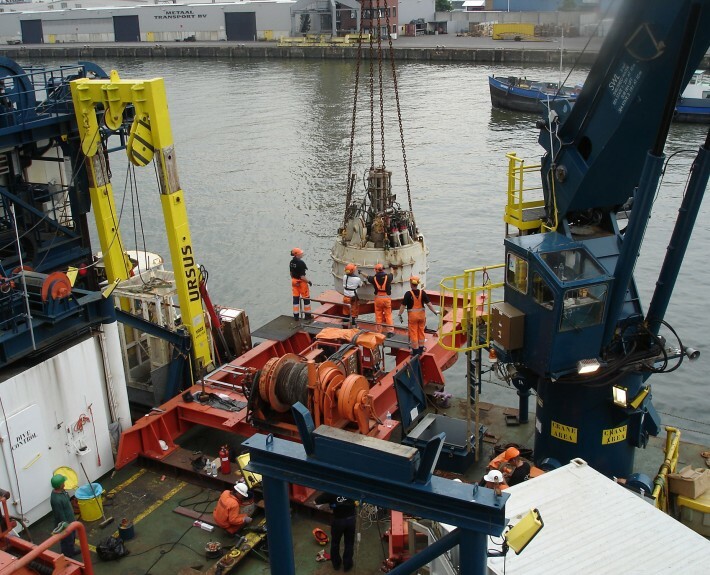 Sledge Hammer has fabricated the Cursor Winch Lift Frame for the Vessel Lewek Constellation. 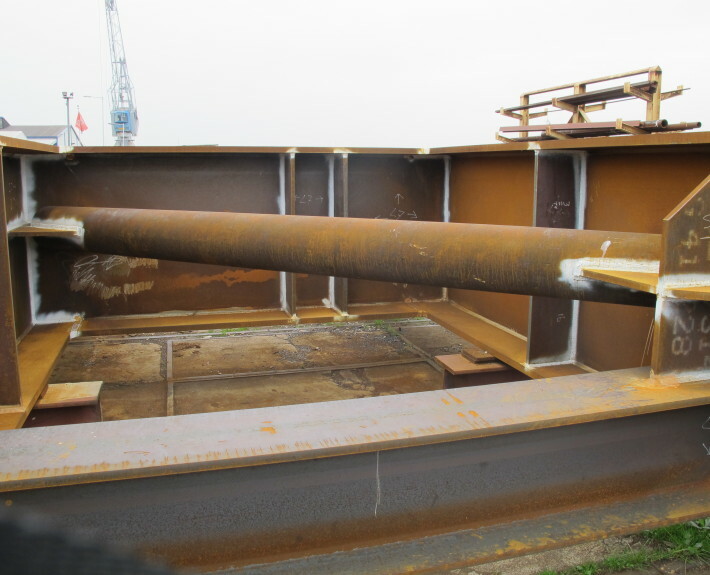 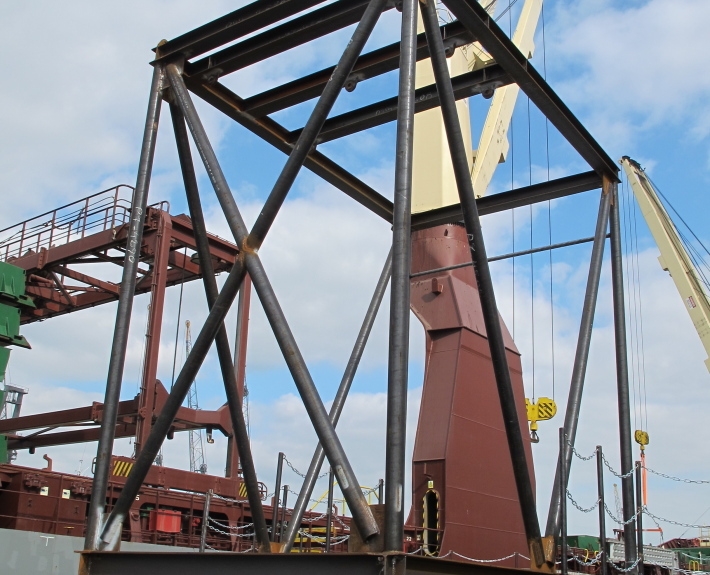 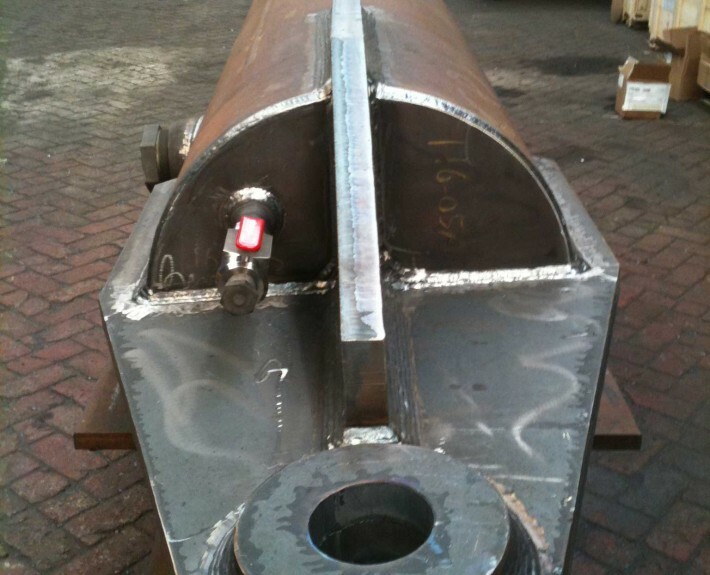 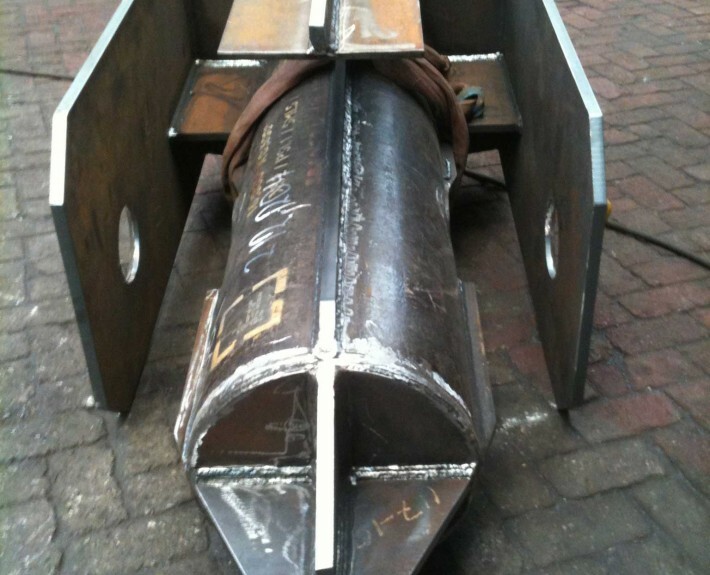 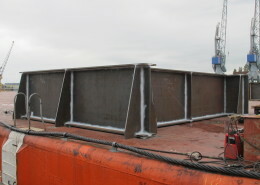 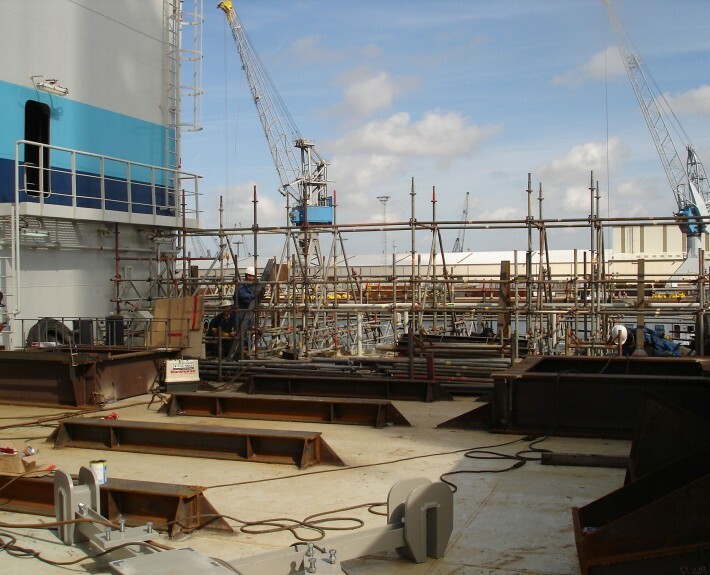 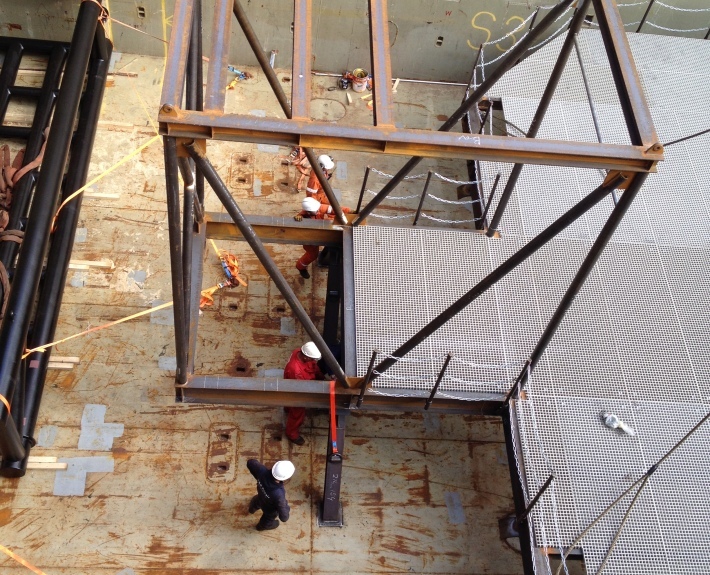 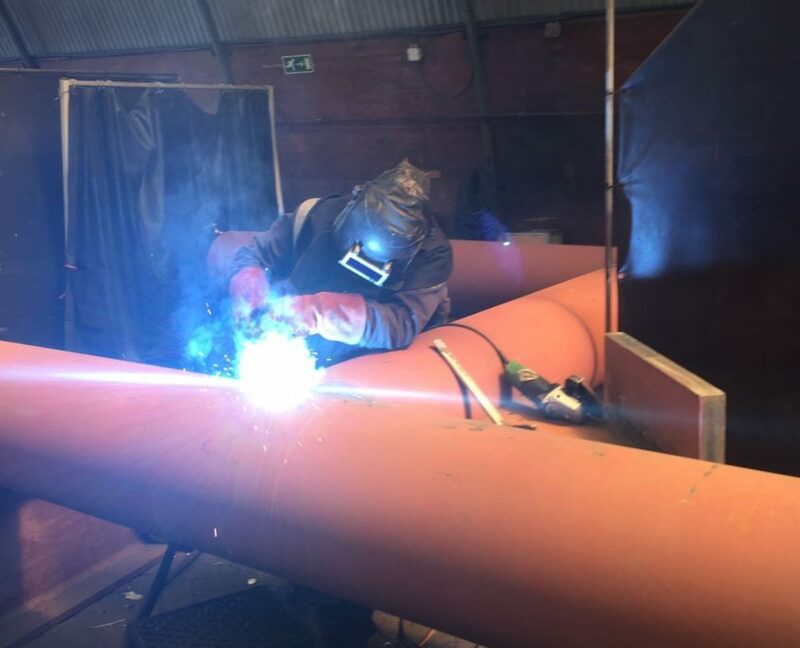 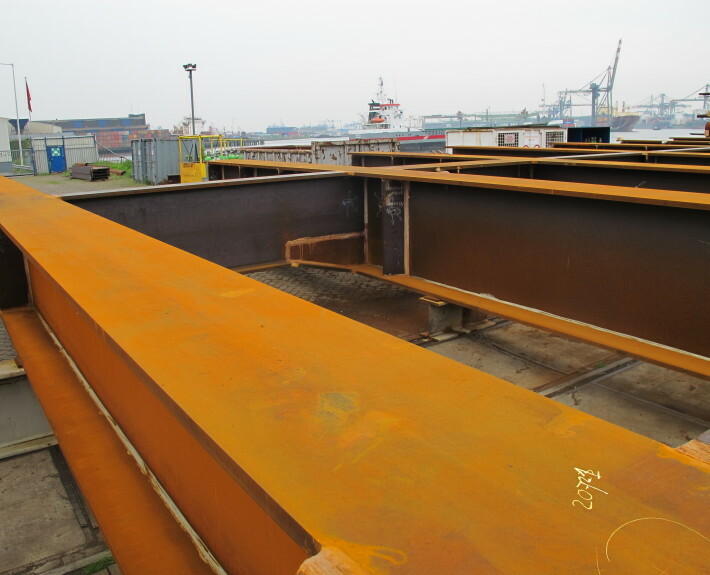 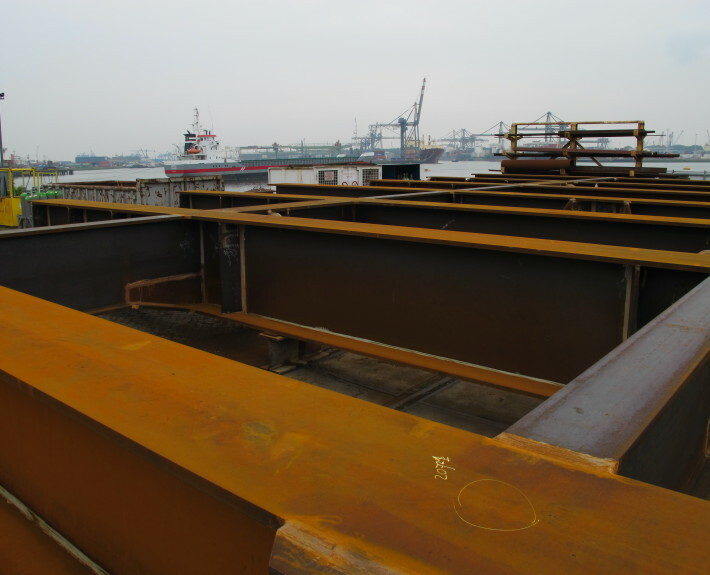 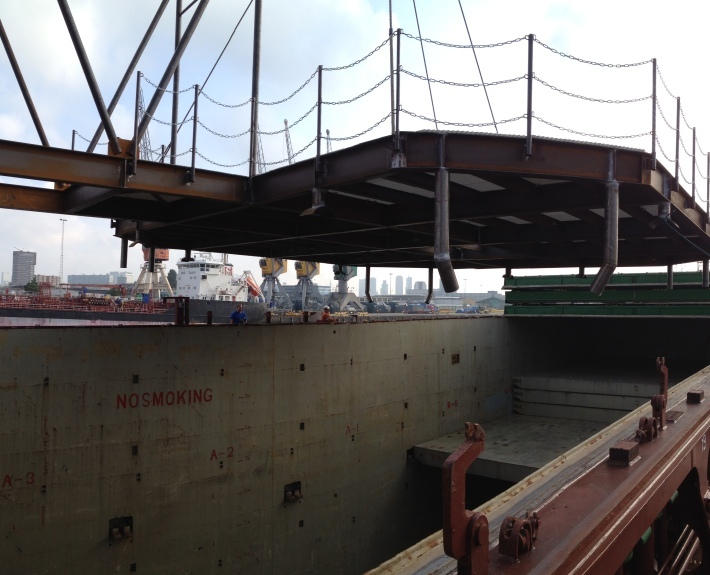 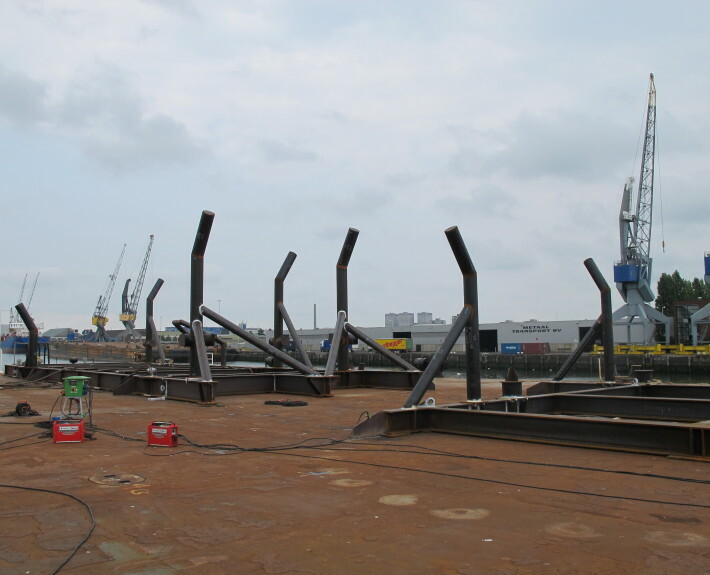 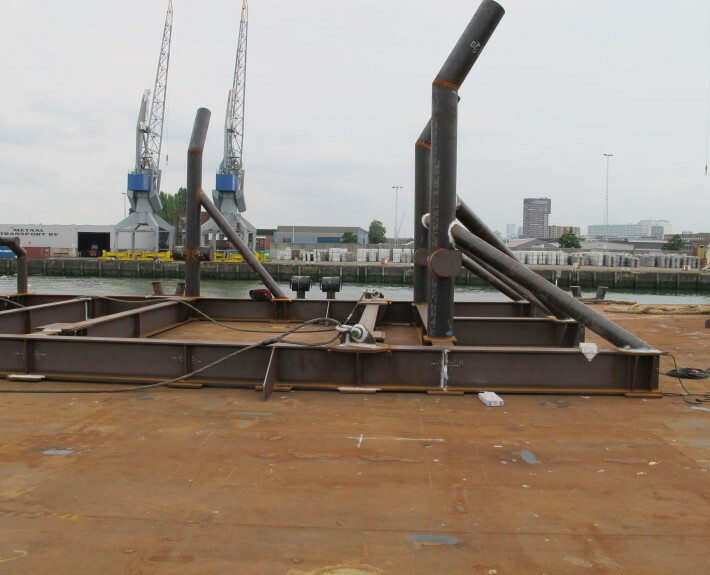 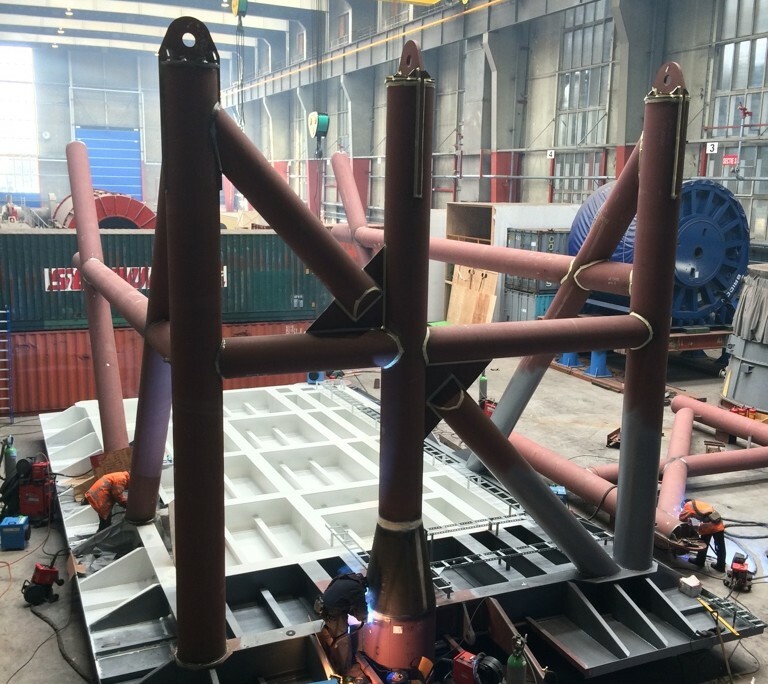 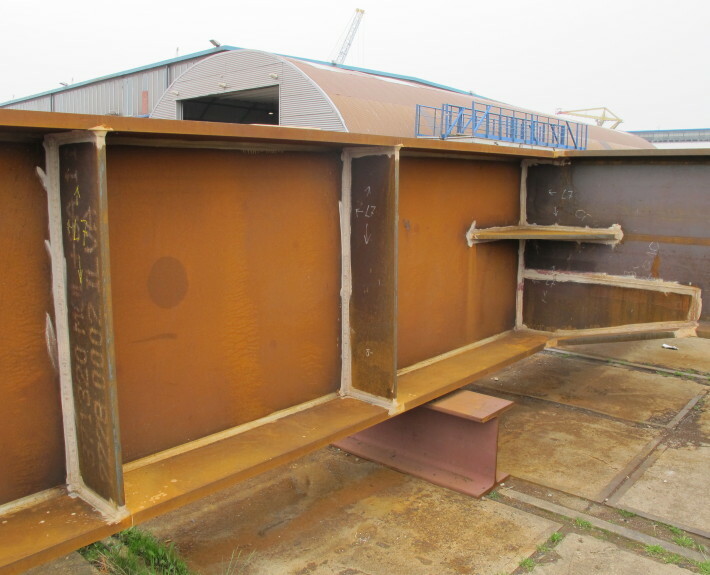 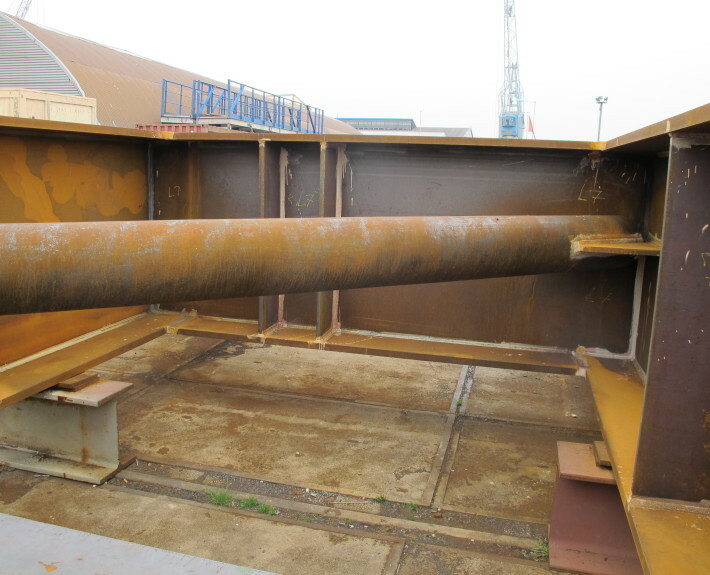 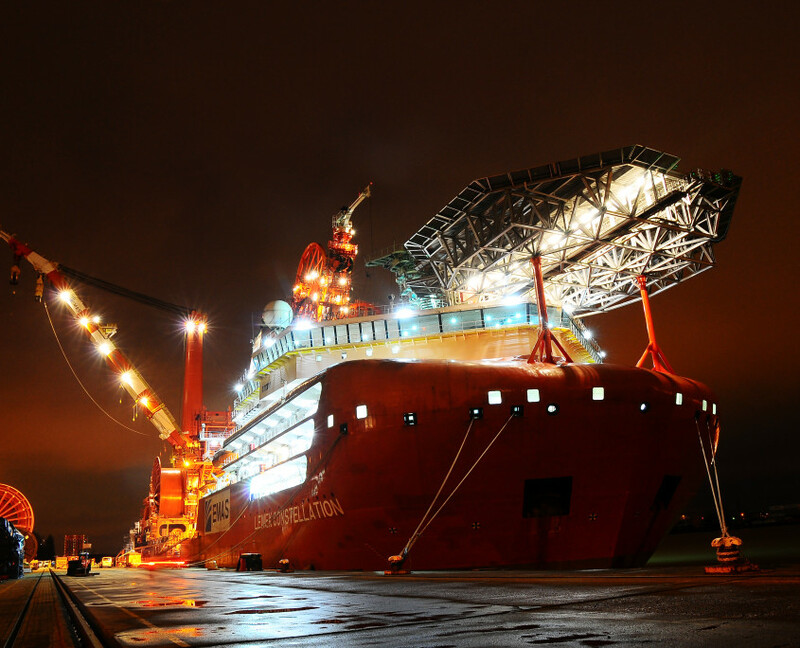 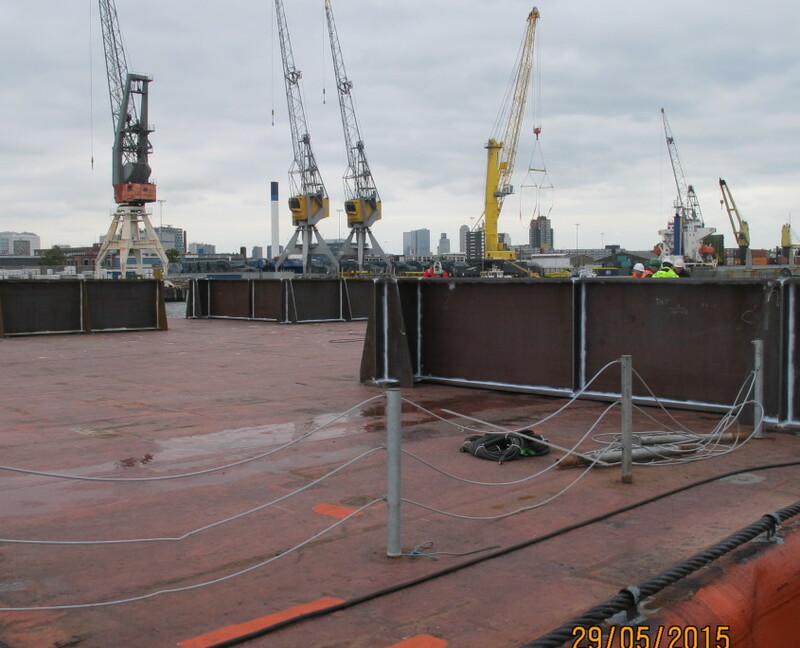 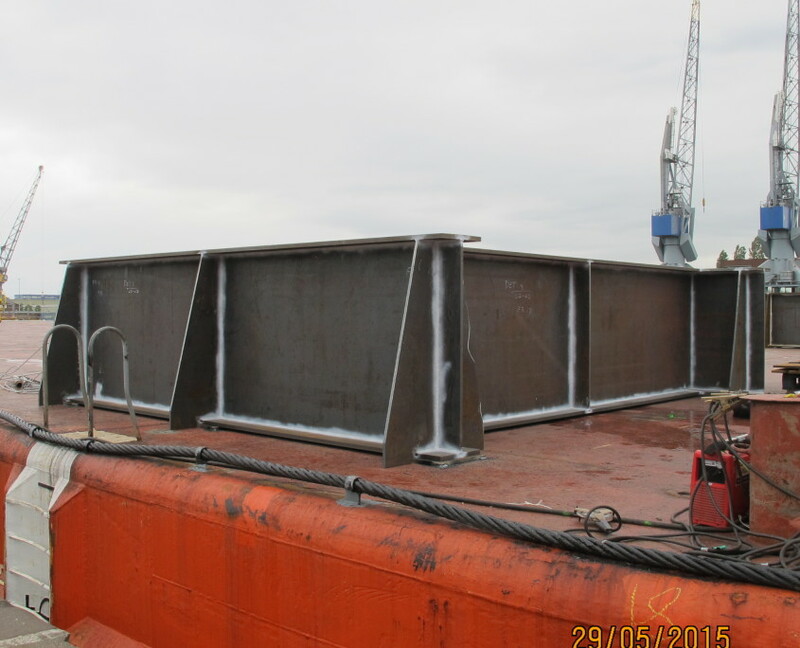 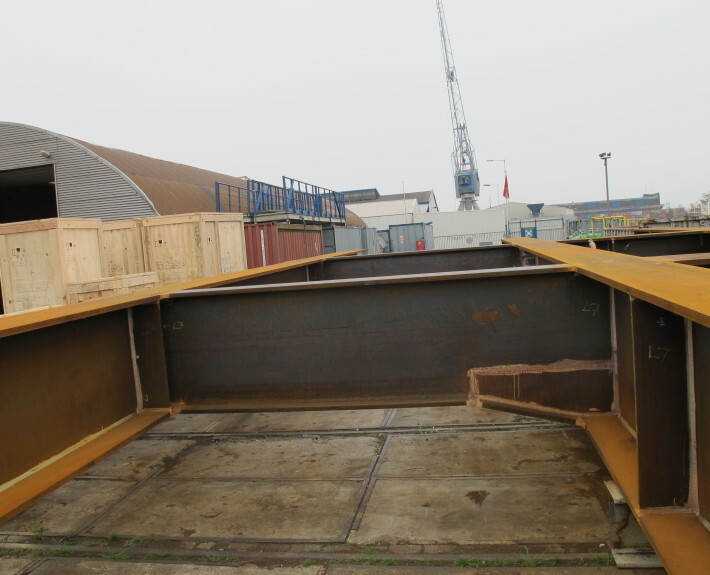 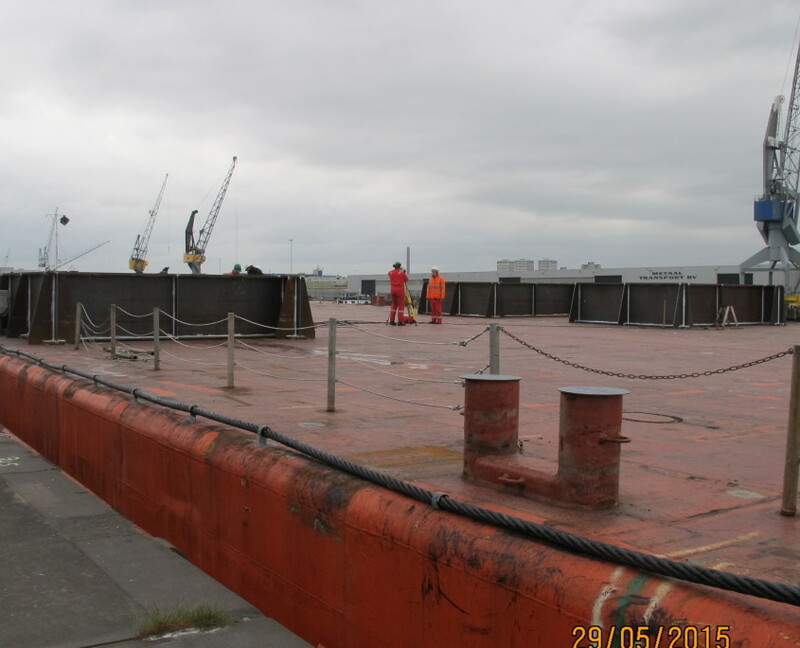 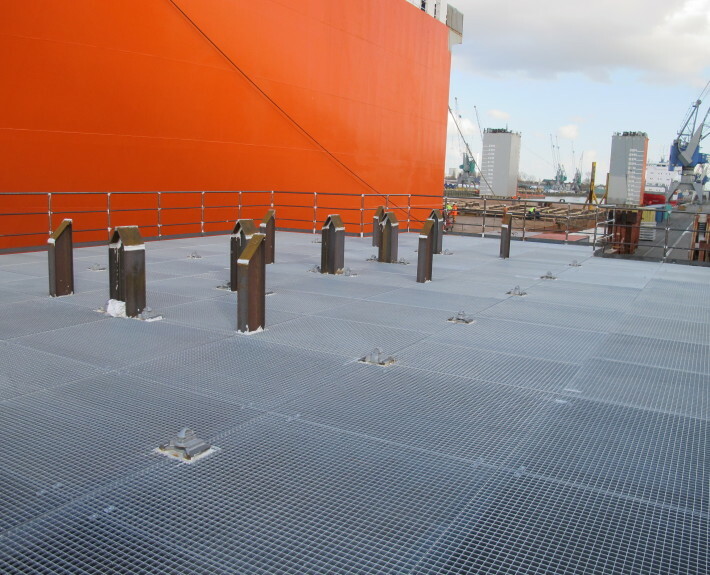 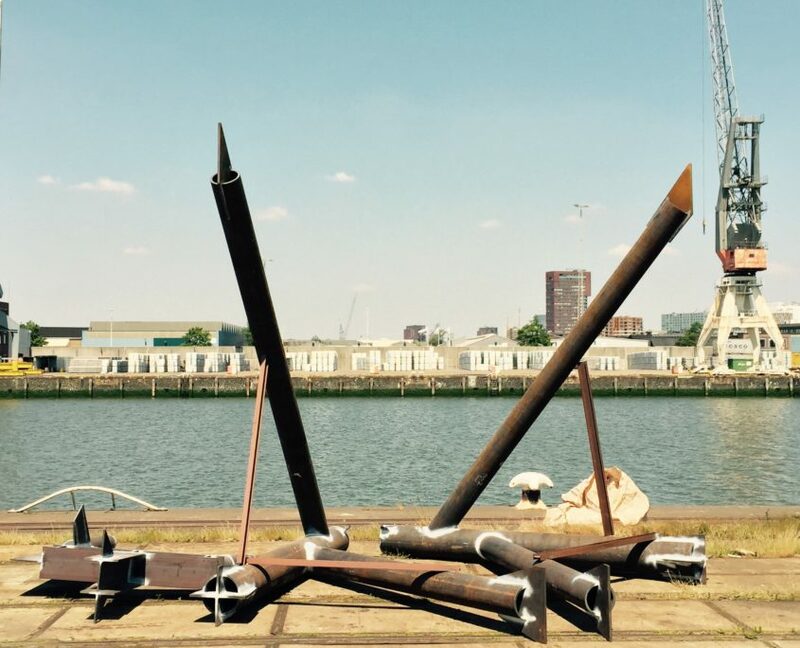 Sledge Hammer has fabricated & installed the Aft Tower for the Vessel Lewek Constellation. 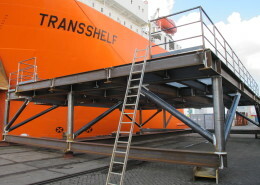 Good workmanship, teamwork and communication with the client shows in the end result. 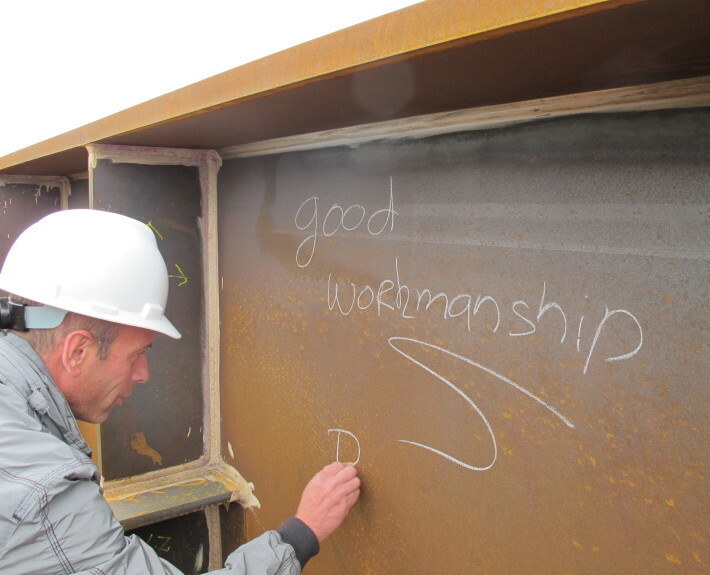 Sledge Hammer is proud to be able to stay true to its core values. 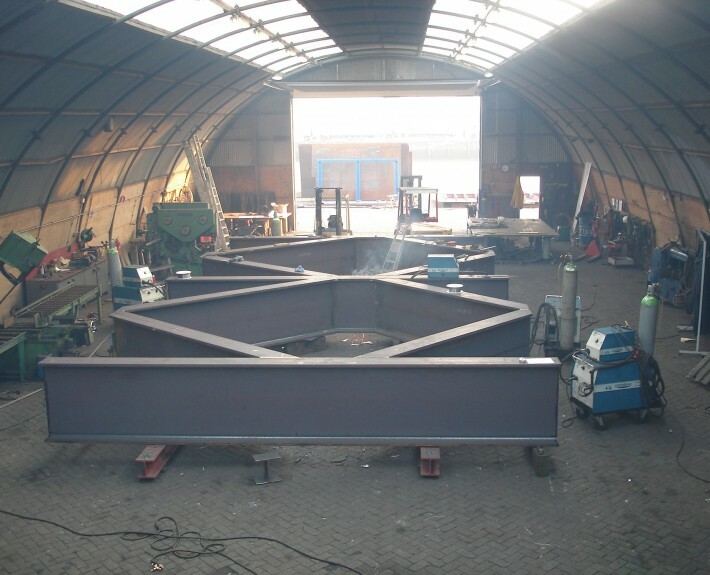 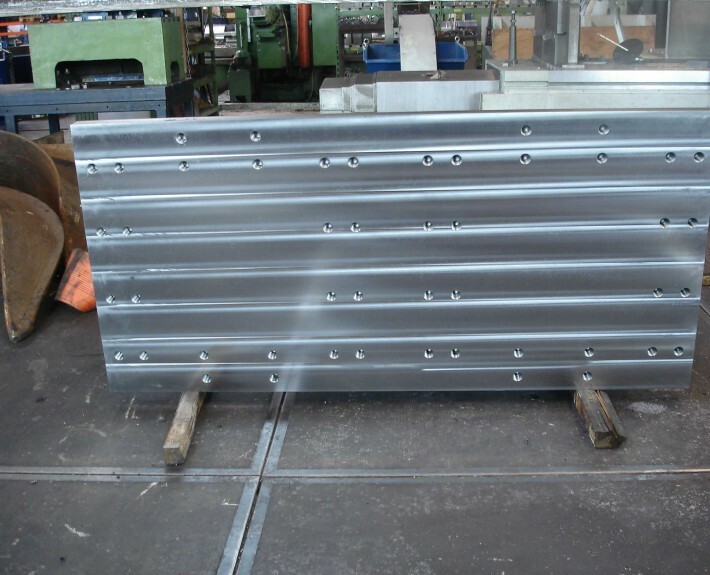 Fabrication of the Lifting template/ frame (Approx. 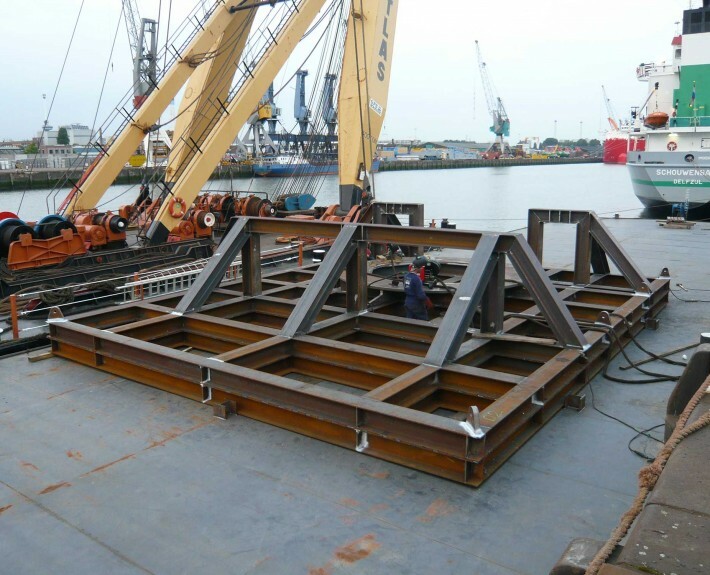 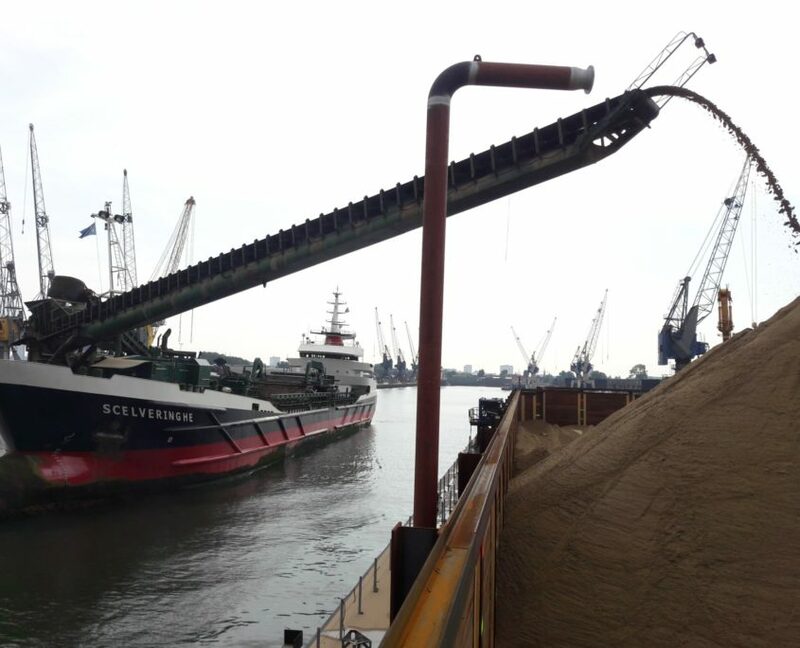 24 Tons) for the Lewek Constellation vessel. 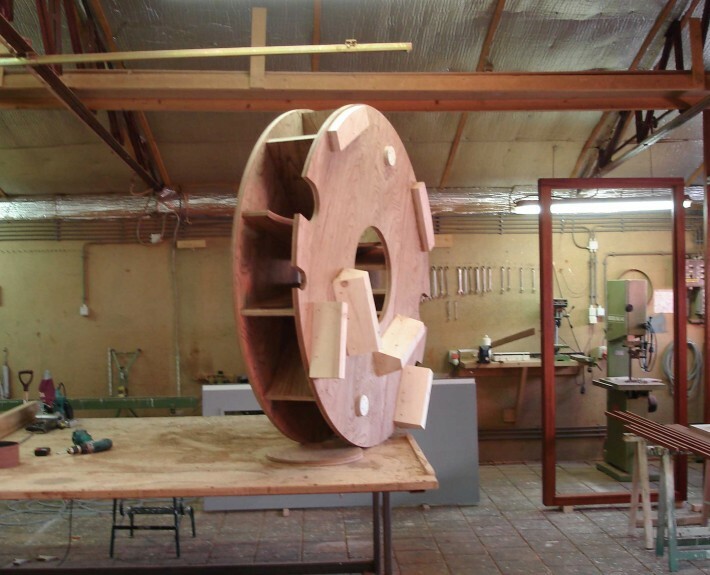 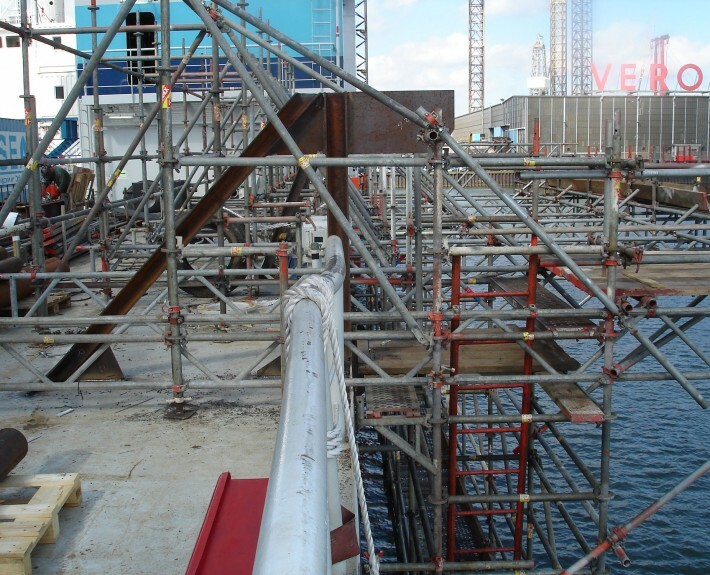 For the NENE Project Sledge Hammer fabricated a Rigging Platform and a Support Frame. 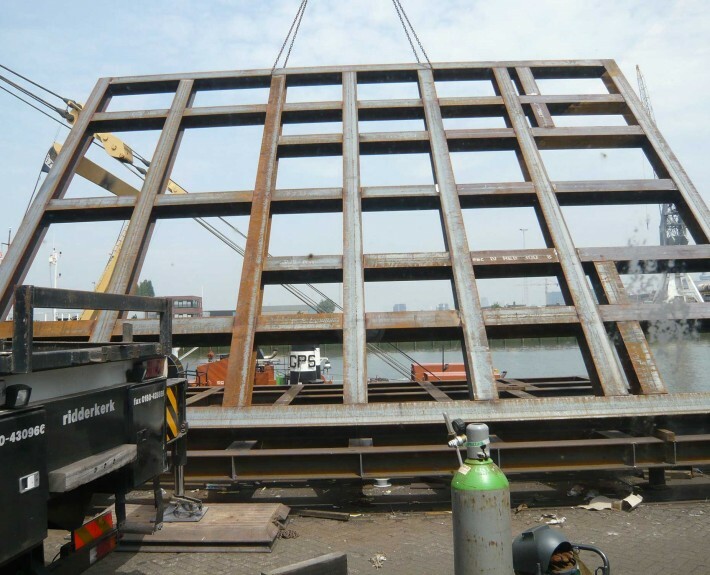 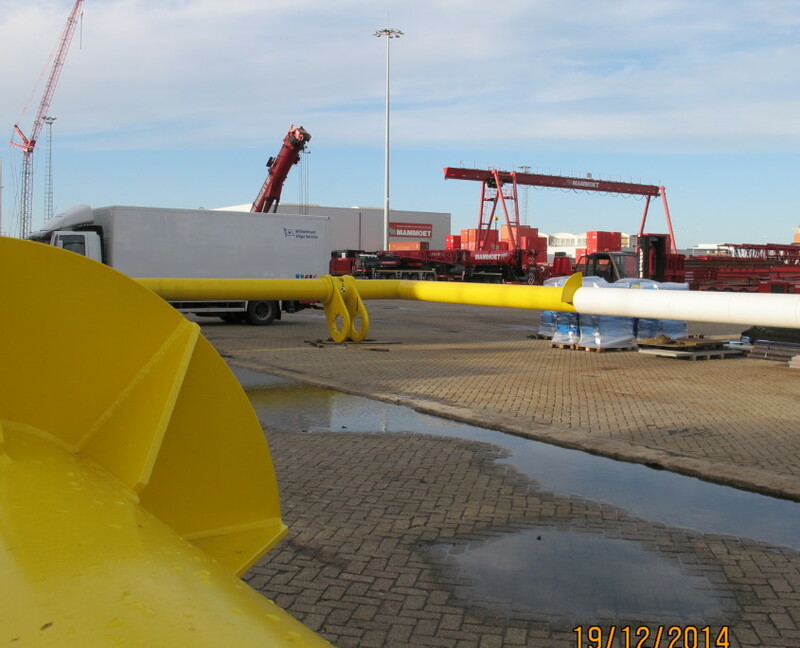 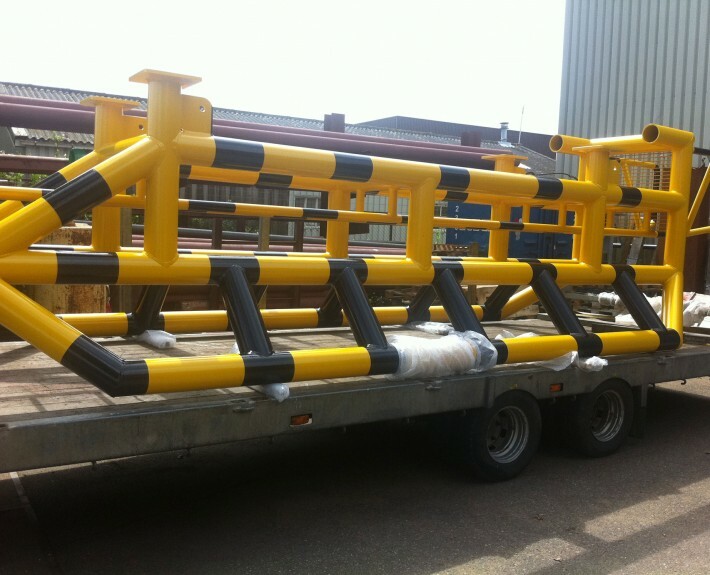 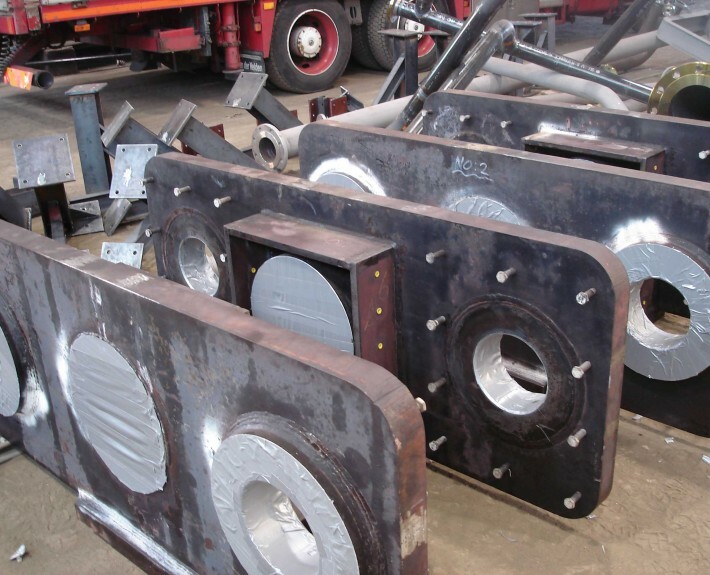 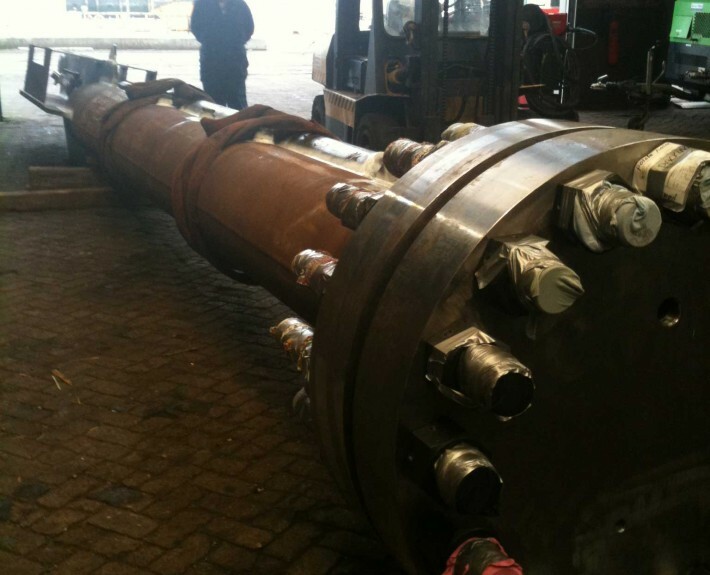 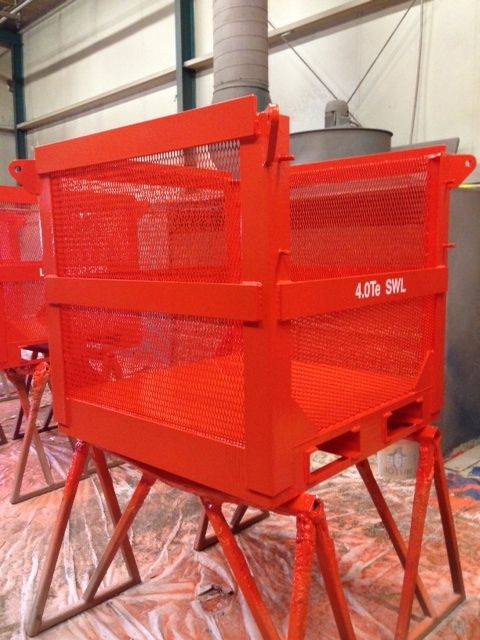 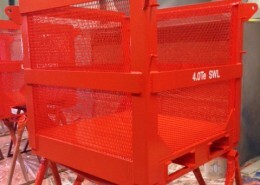 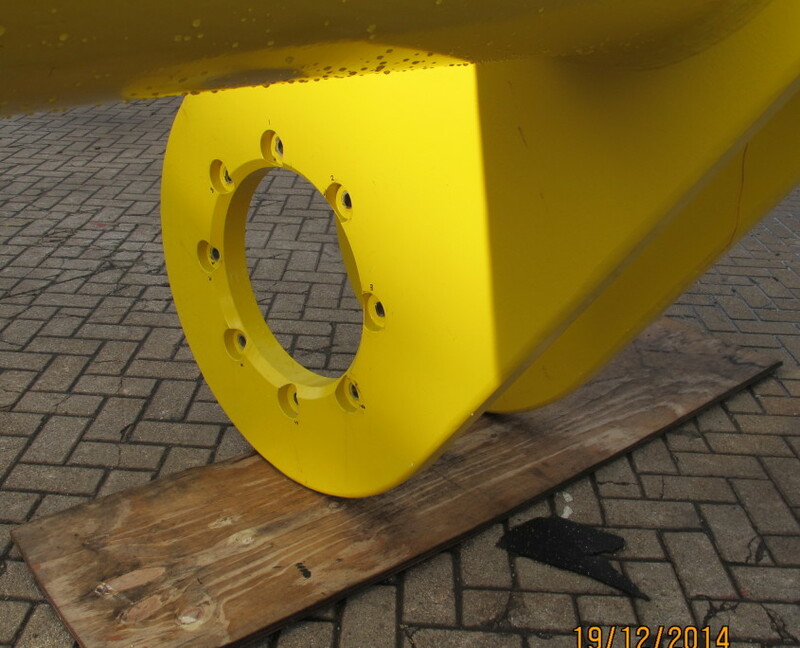 These fabrications have been lifted directly from our quayside onto the M.V. 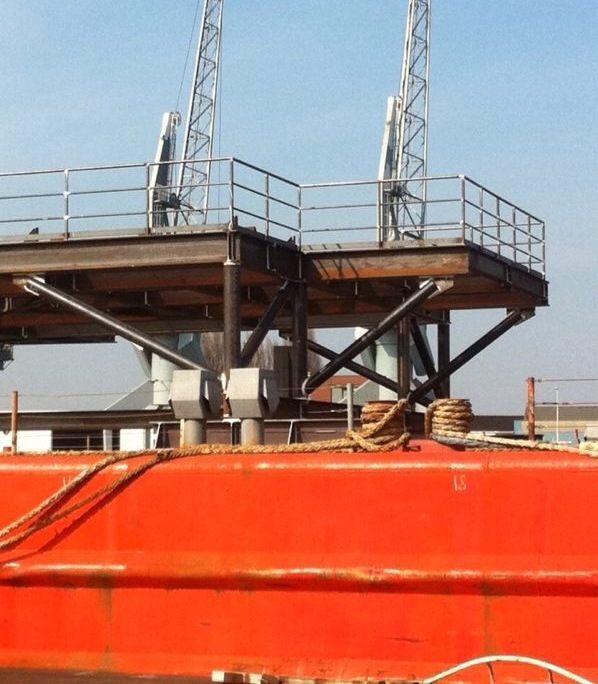 Vectis Castle. 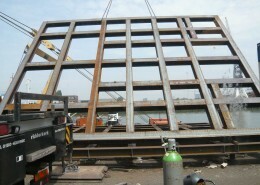 For this project we fabricated 3 various type of frames. 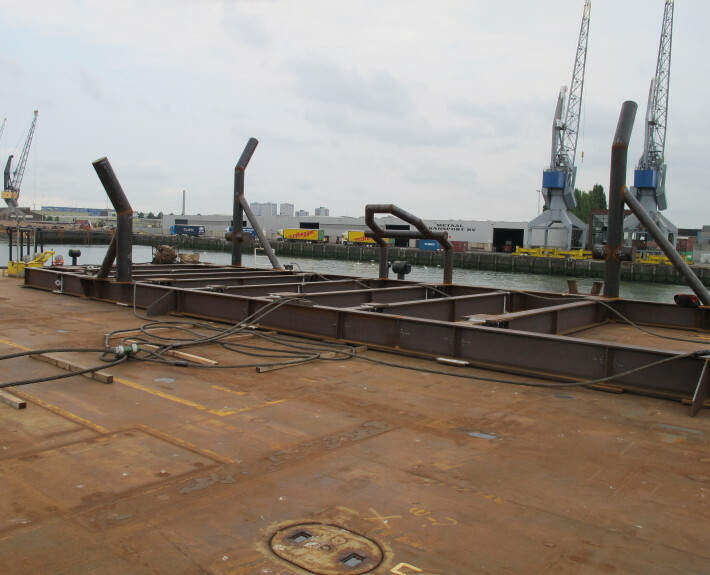 These frames have also been sea-fastened by Sledge Hammer on the AMT Discoverer. 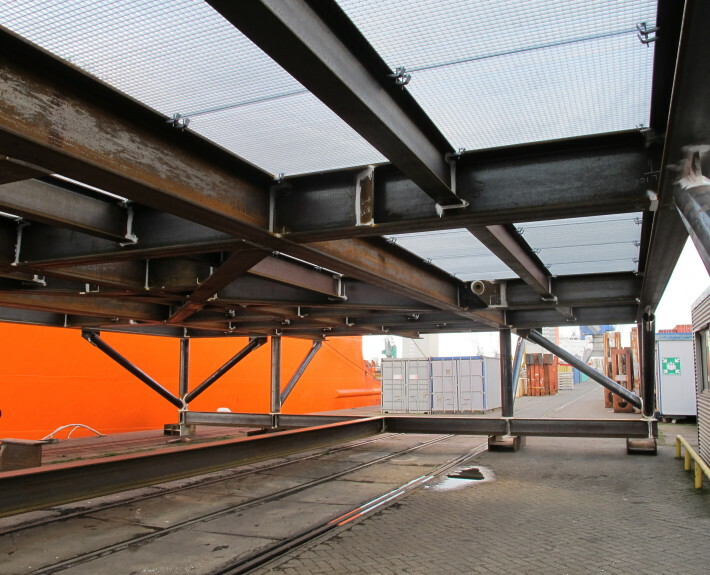 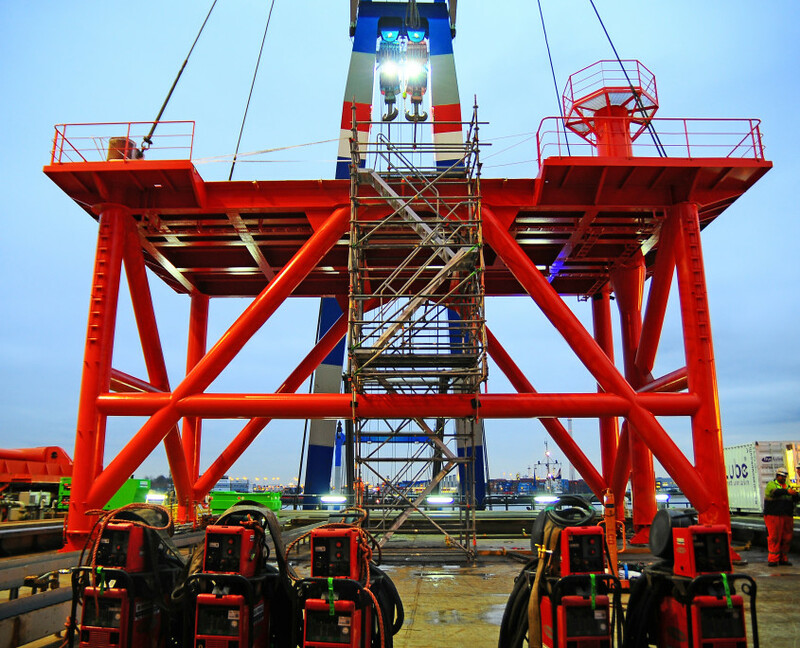 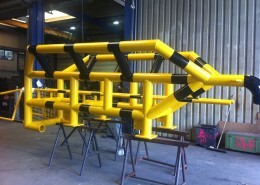 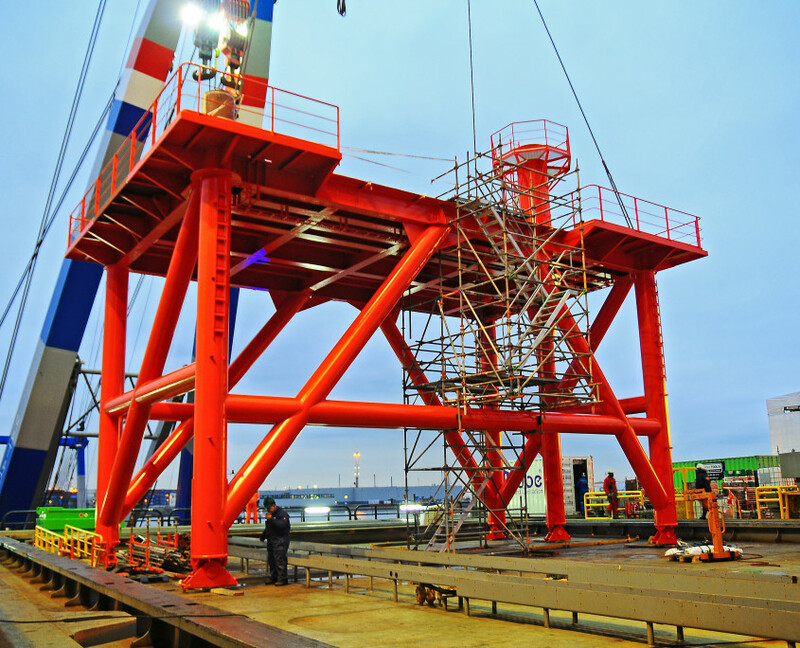 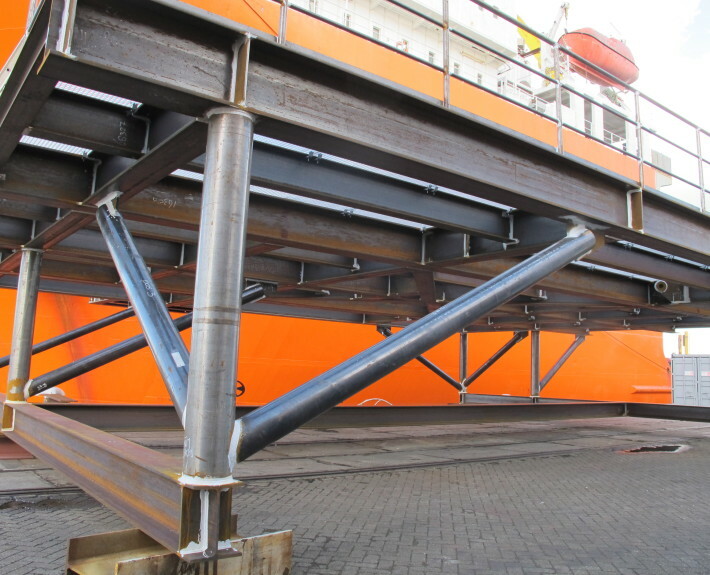 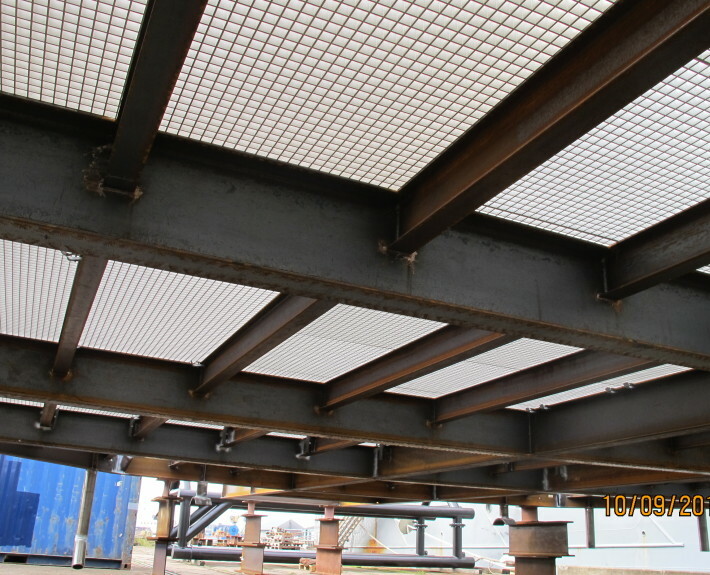 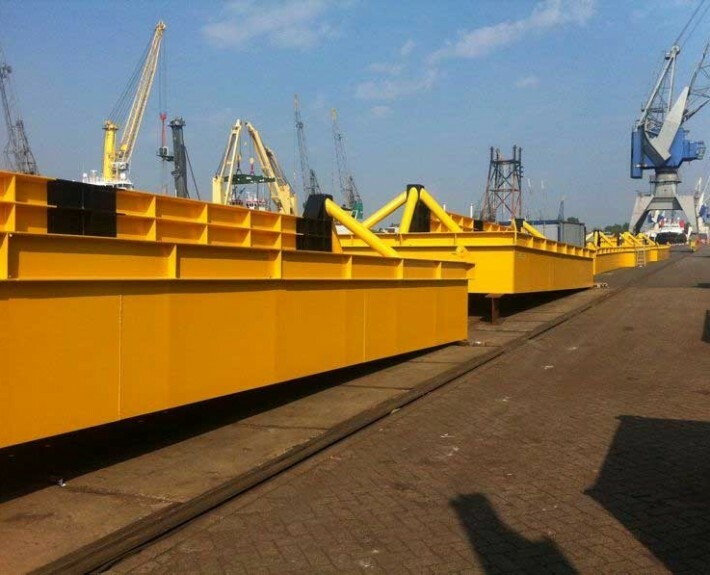 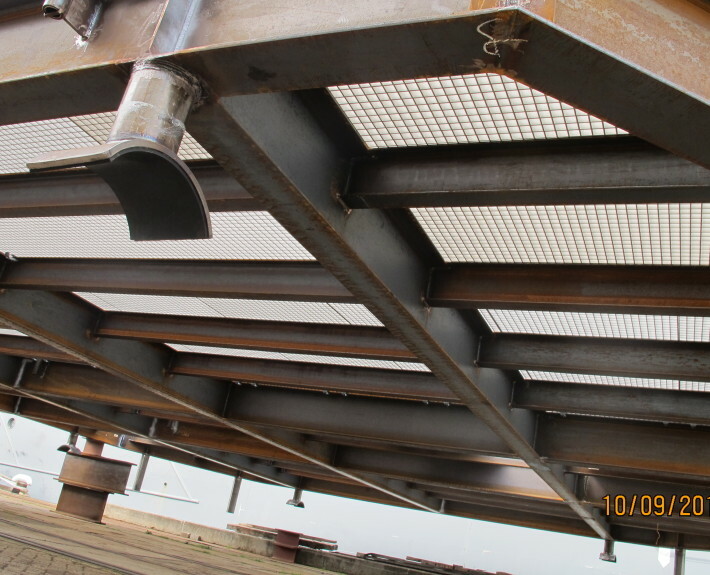 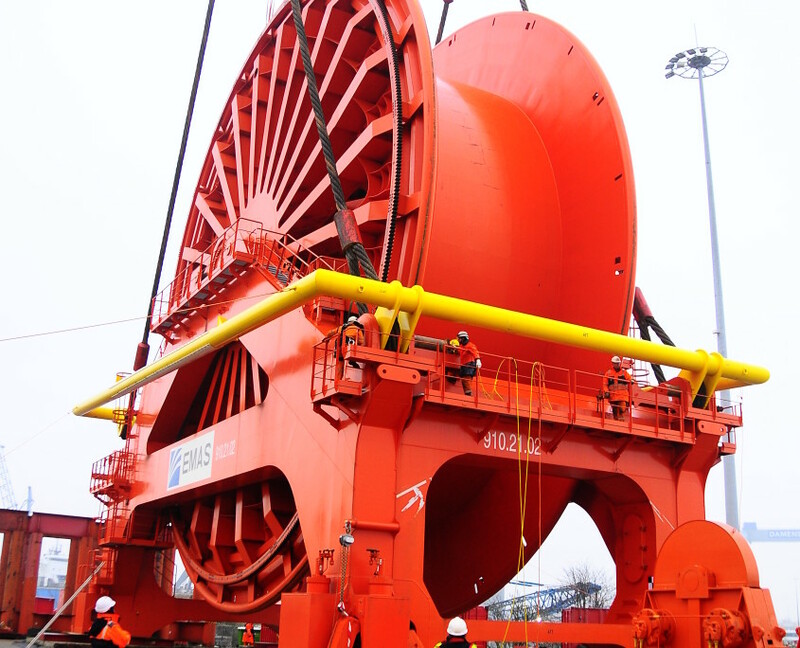 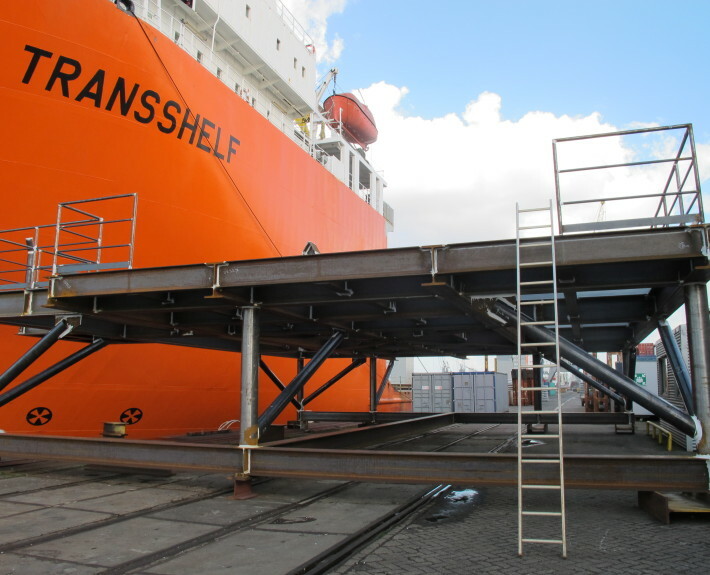 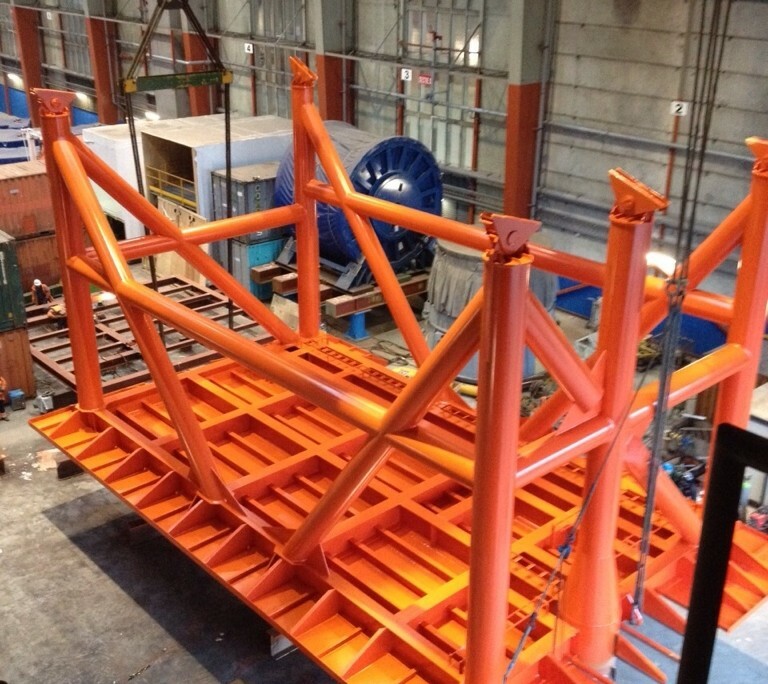 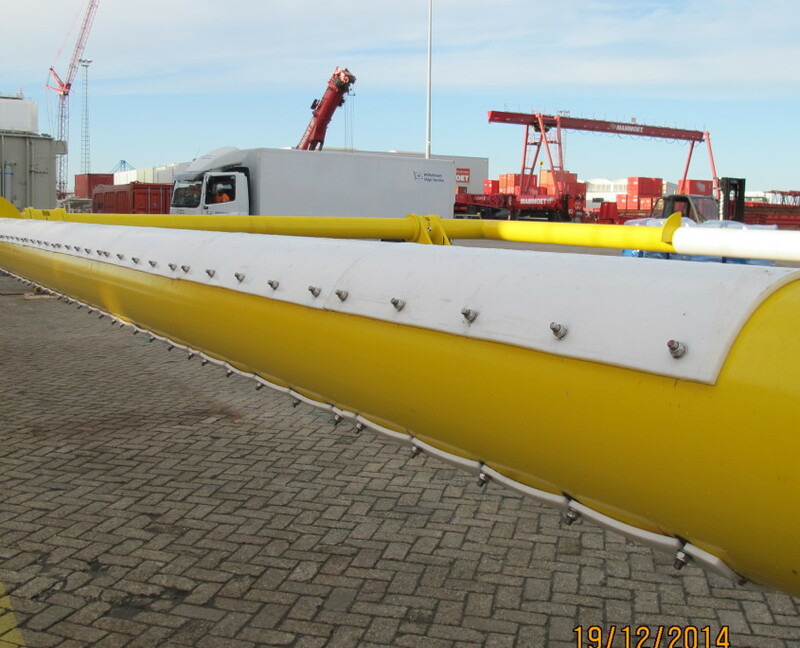 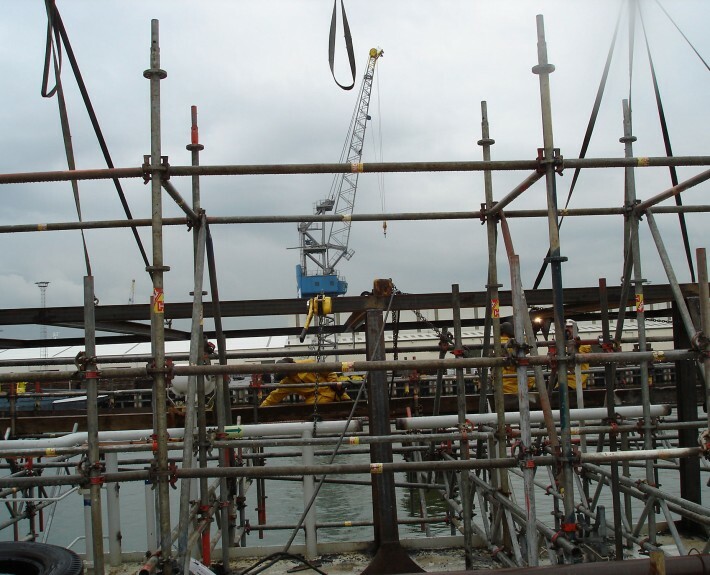 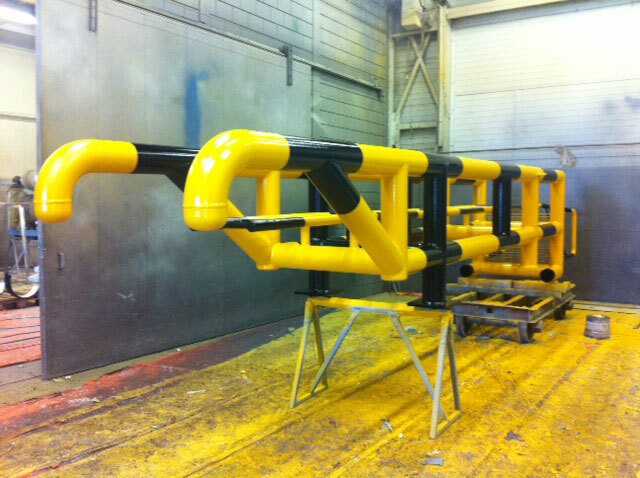 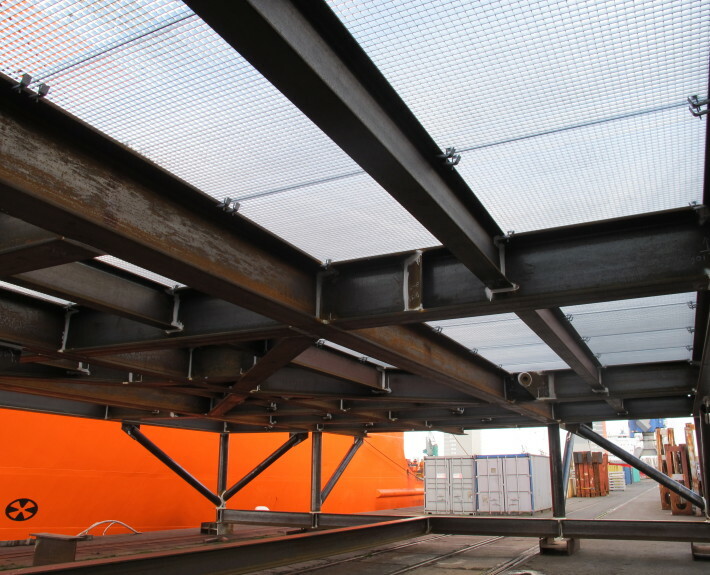 The fabrication of this Transport Frame was part of the GirRi FPSO2 project. 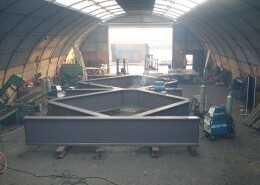 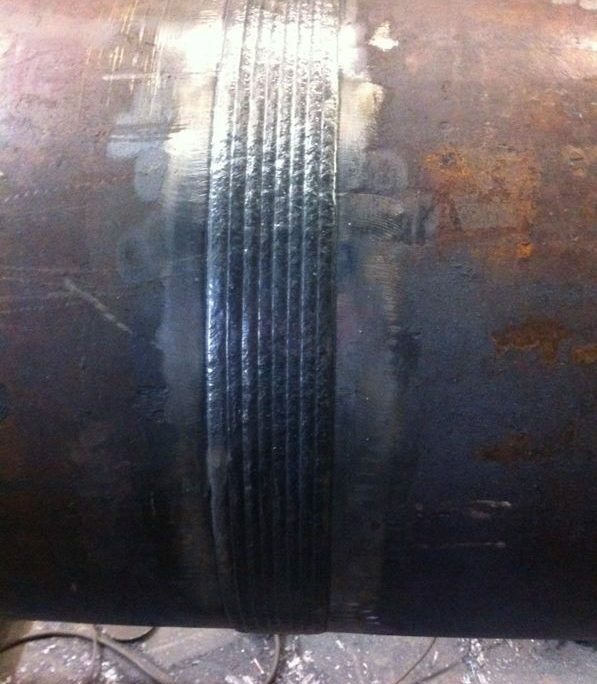 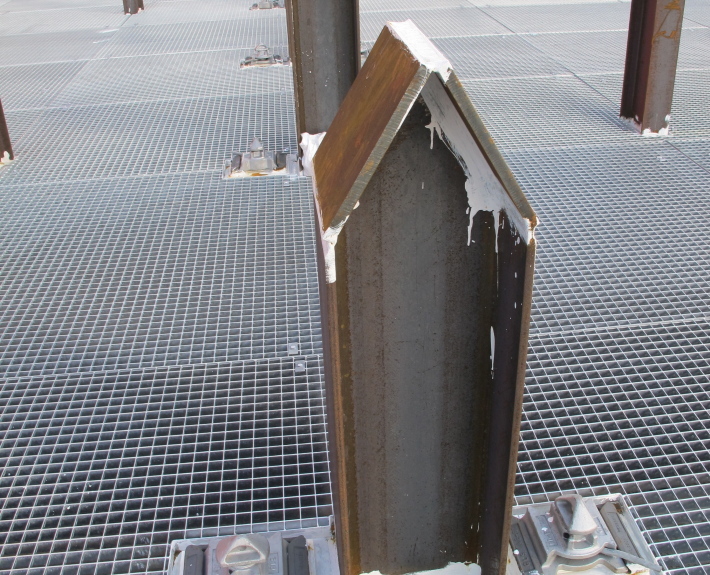 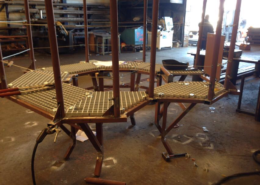 This fabrication was part of the Sylwin Alpha Project. 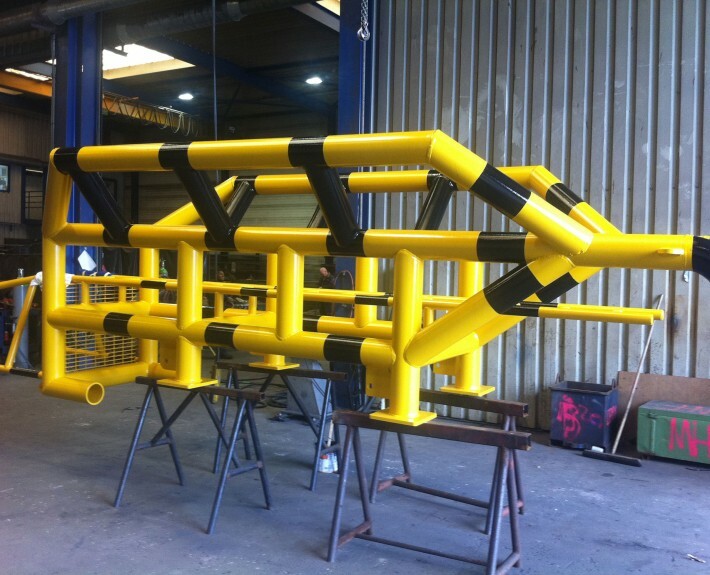 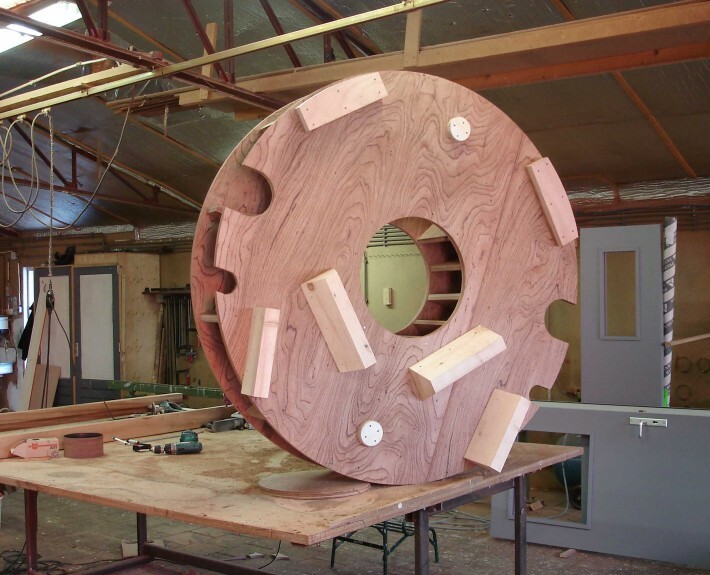 For our client SubSea7 we have created a life size mock-up before Sledge Hammer started fabricating the rest of the frame. 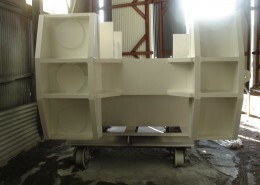 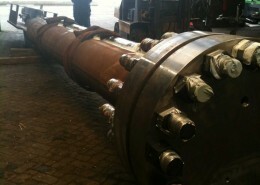 For this project Sledge Hammer fabricated 4 ea. Sleepers. 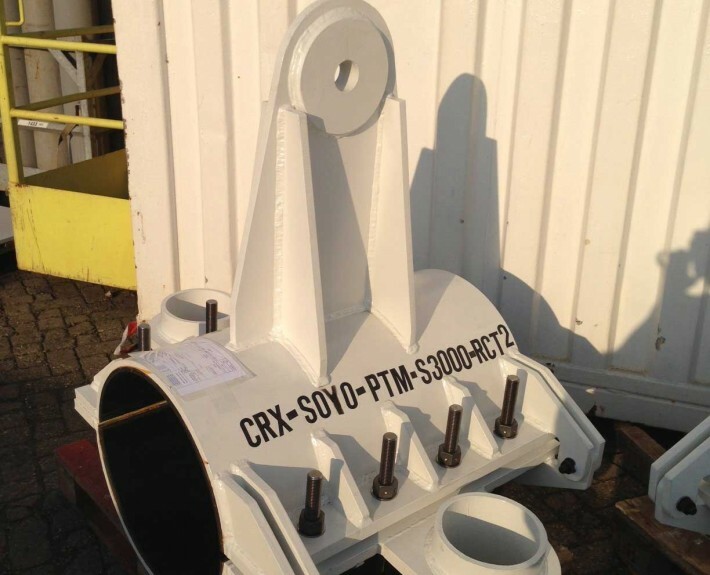 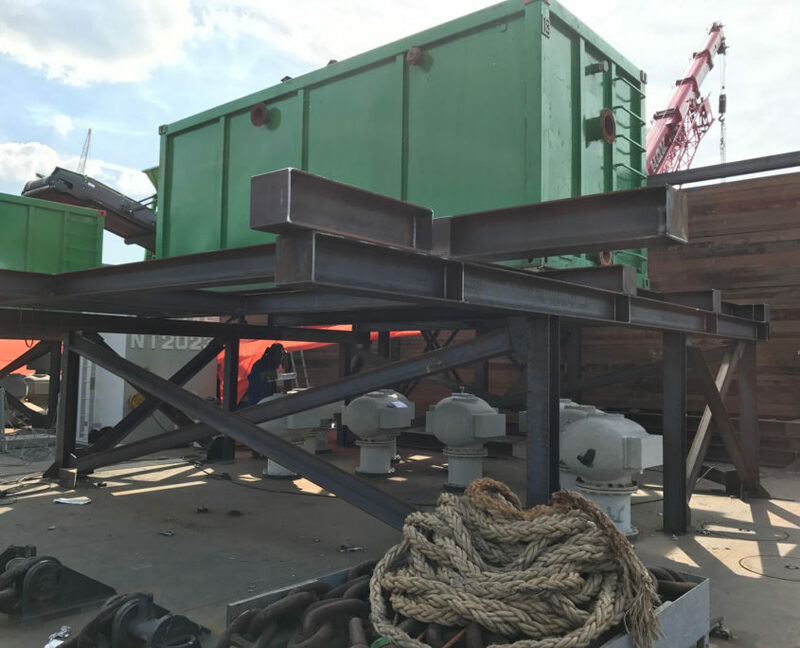 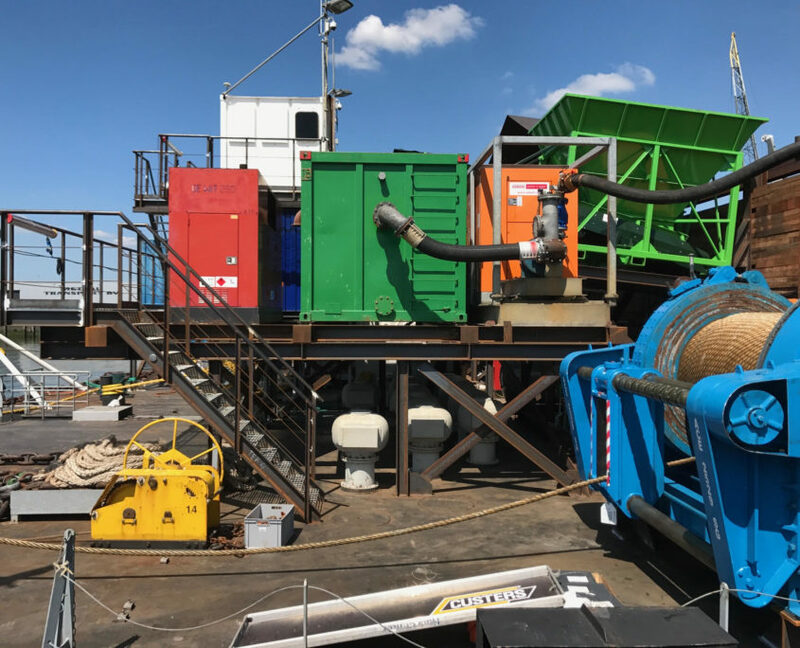 For the CRX Pointe Noire-Congo project Sledge Hammer fabricated a Riser Working Platform, Riser Seafastenings, Riser Supports and a Riser Lifting Clamp. 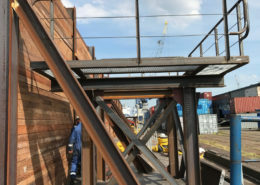 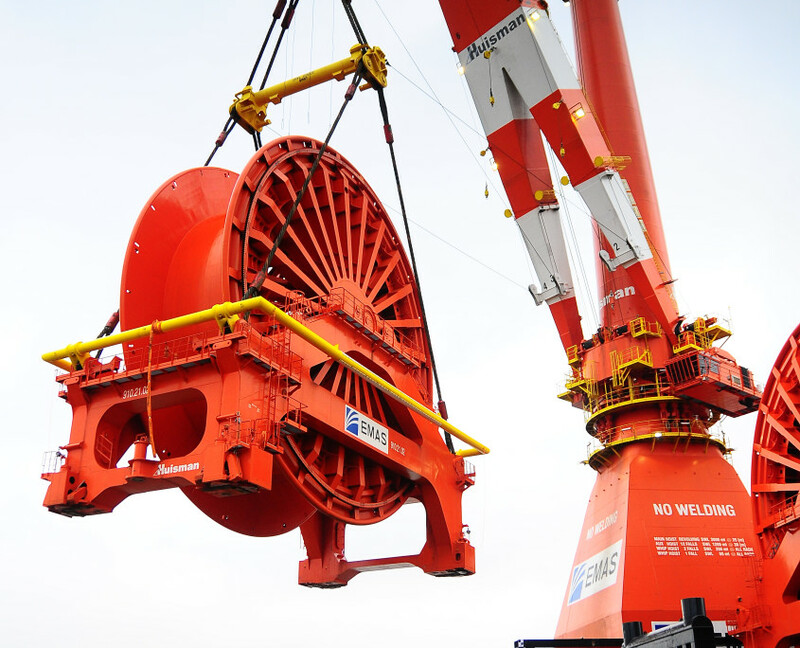 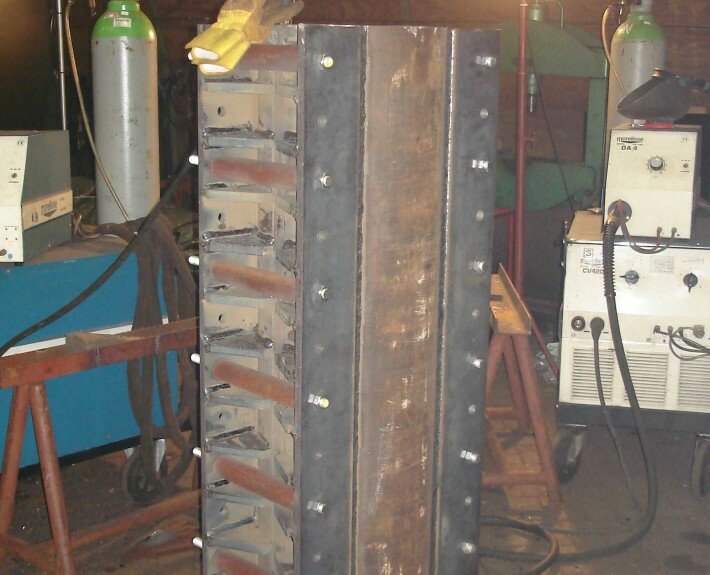 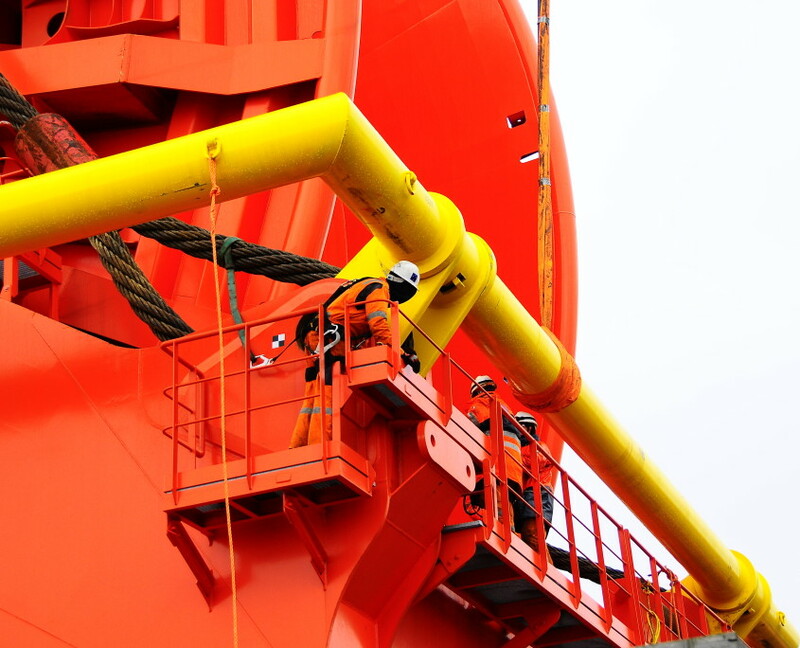 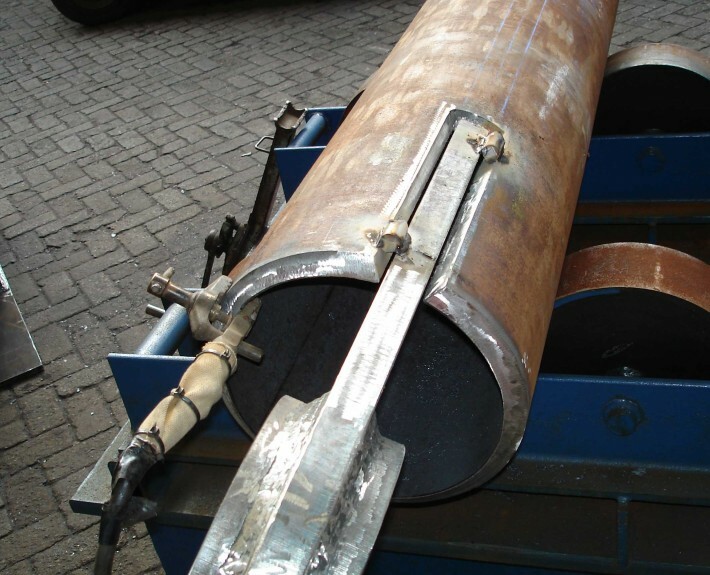 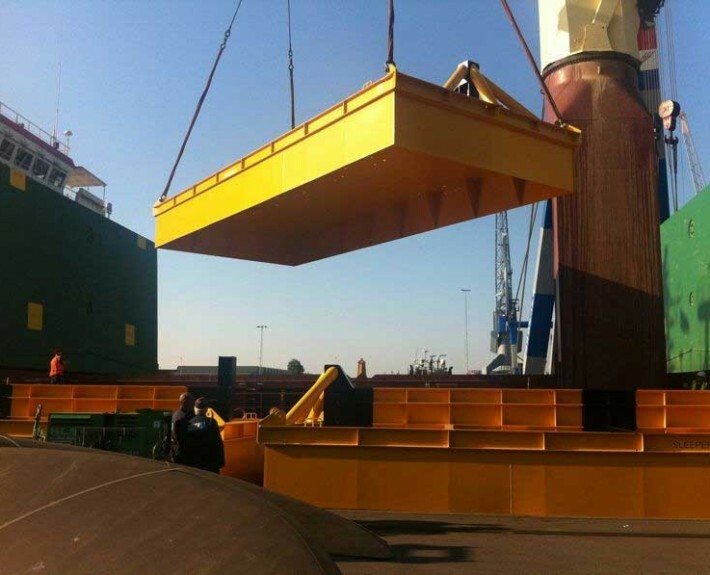 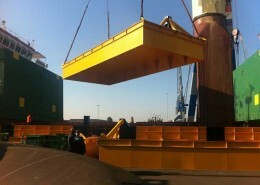 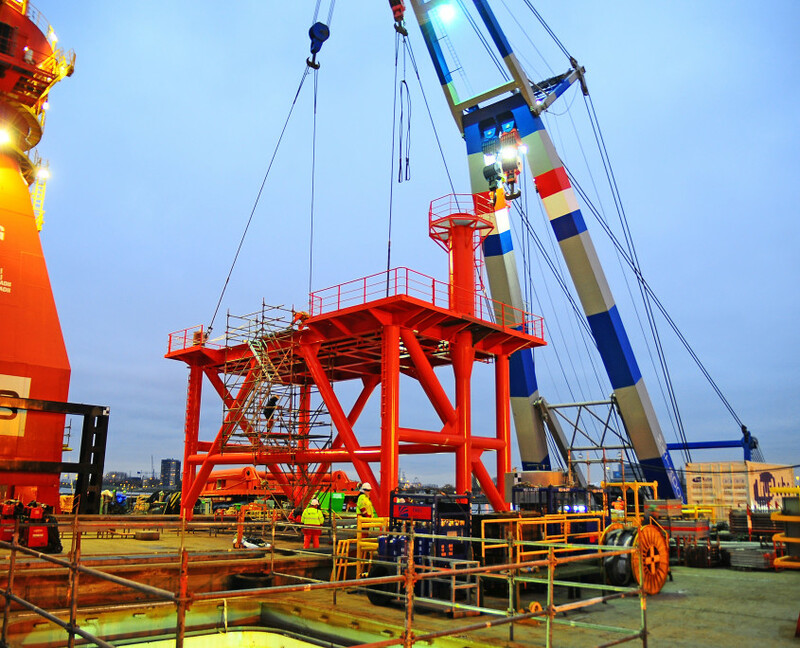 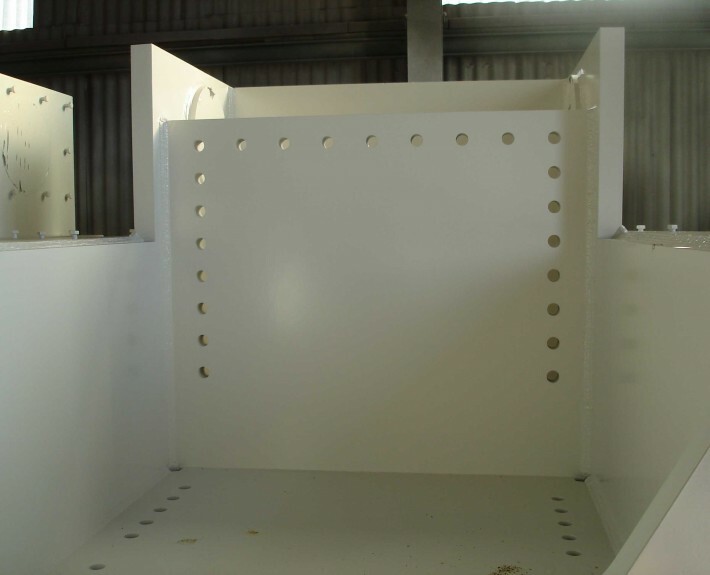 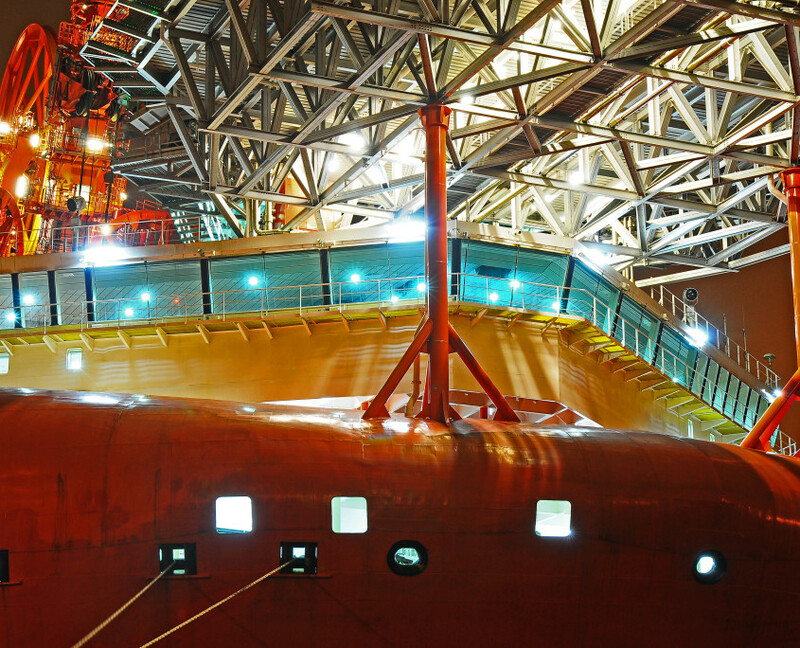 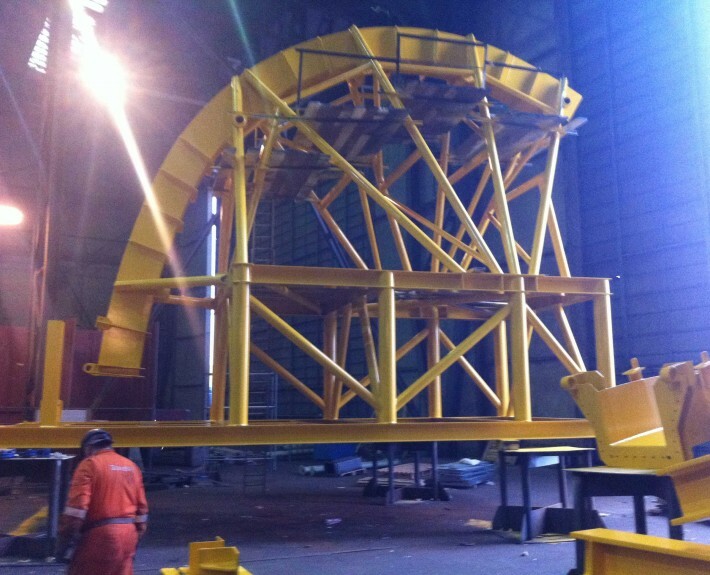 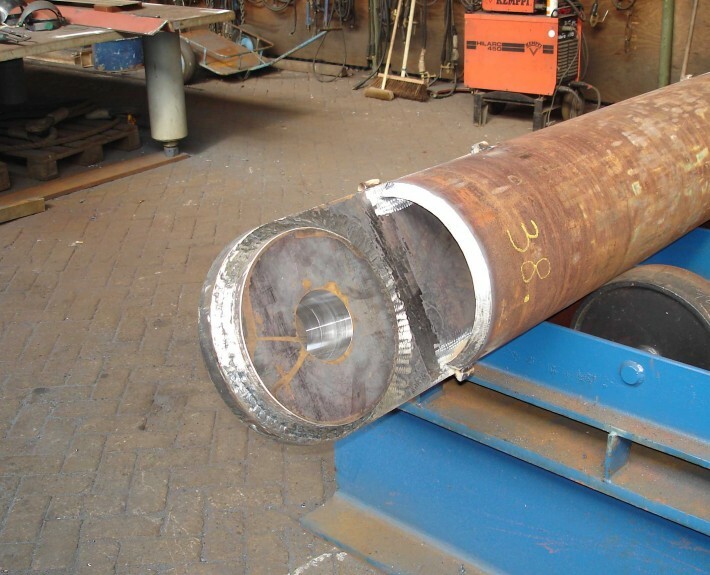 Fabrication and the trial fit test has been witnessed and certified by DNV. 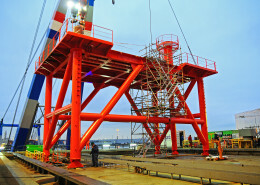 At the end a digital Databook has been compiled for the client. 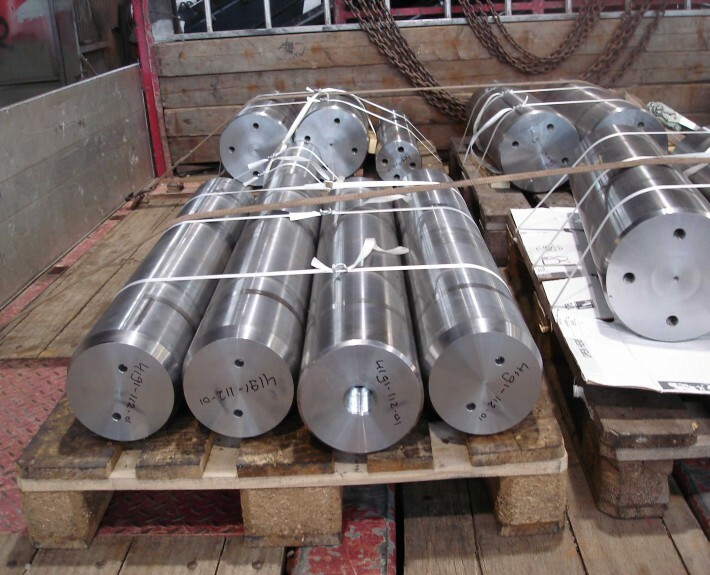 Traceability is an element Sledge Hammer does not take lightly. 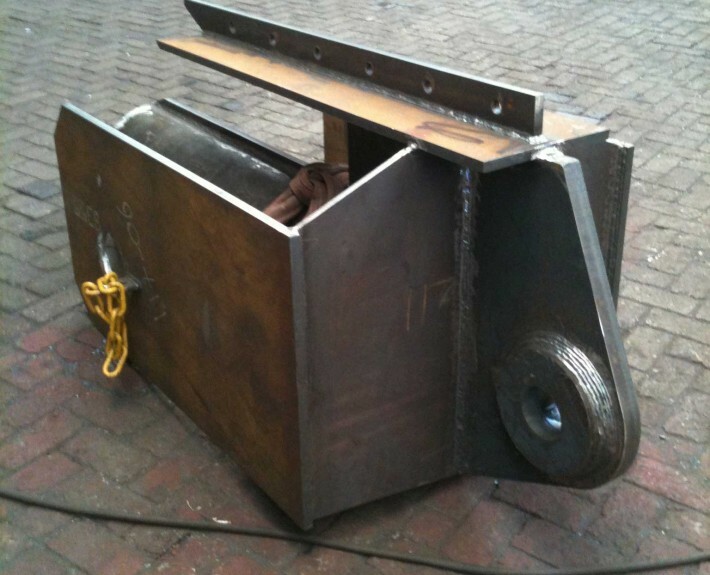 For the CRX Project Sledge Hammer fabricated the Emergency abandonment-, buckle recovery- & laydown pig receiver head. 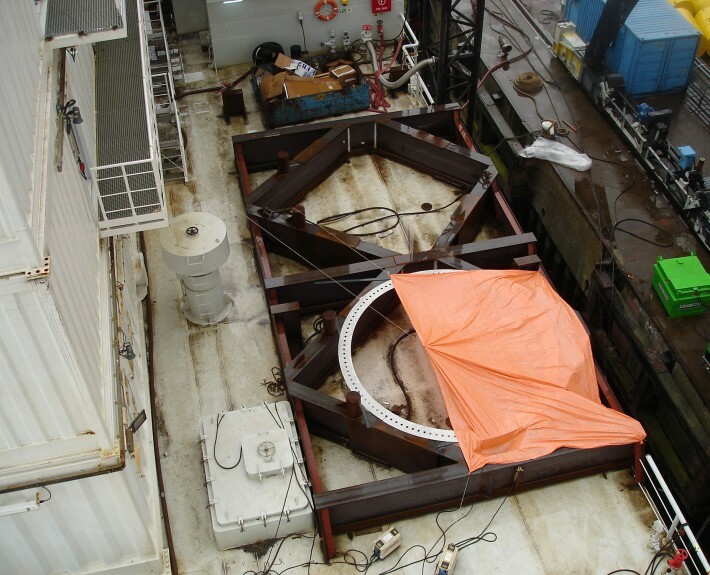 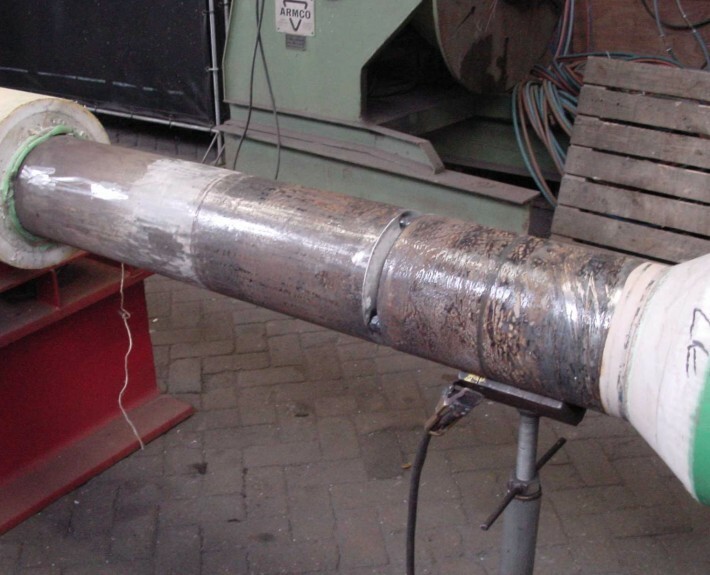 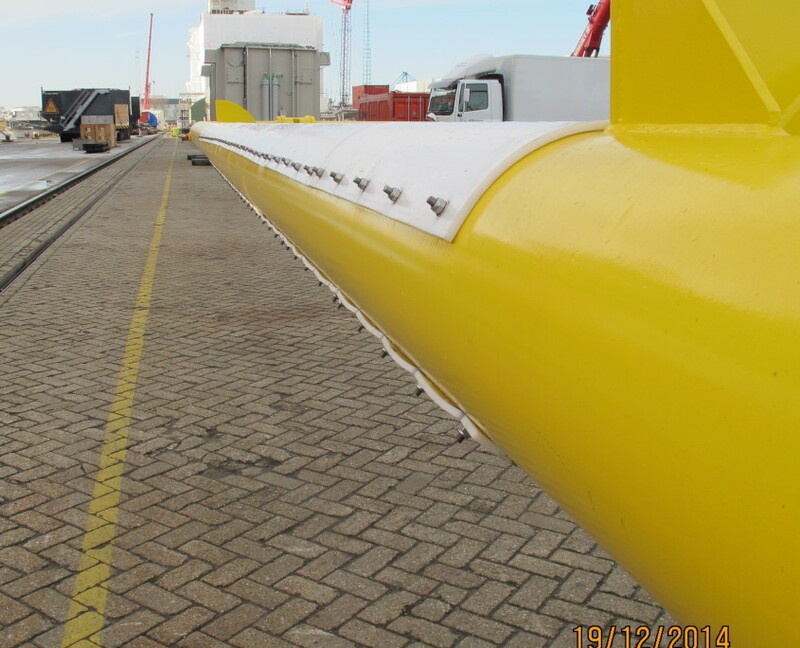 Sledge Hammer has additionally performed a hydrotest under the witness and certification of DNV. 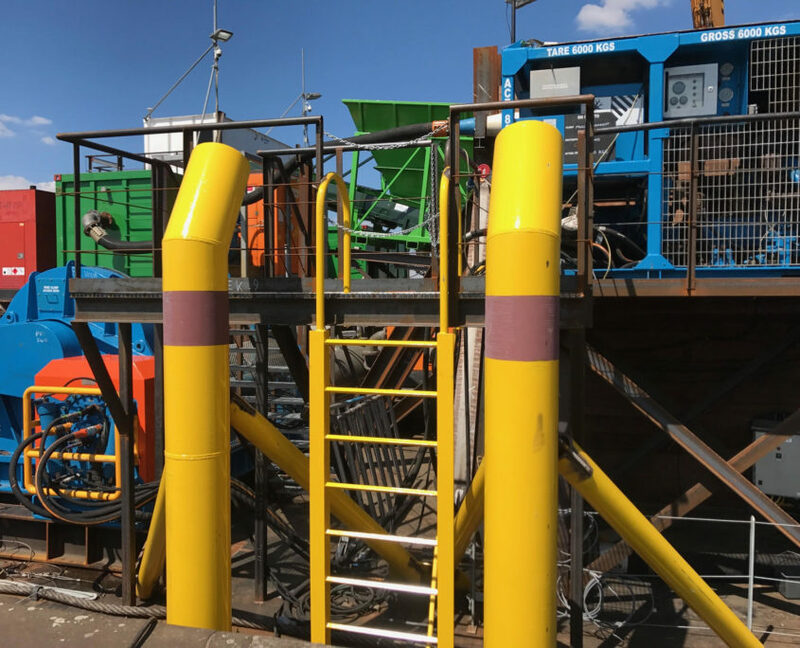 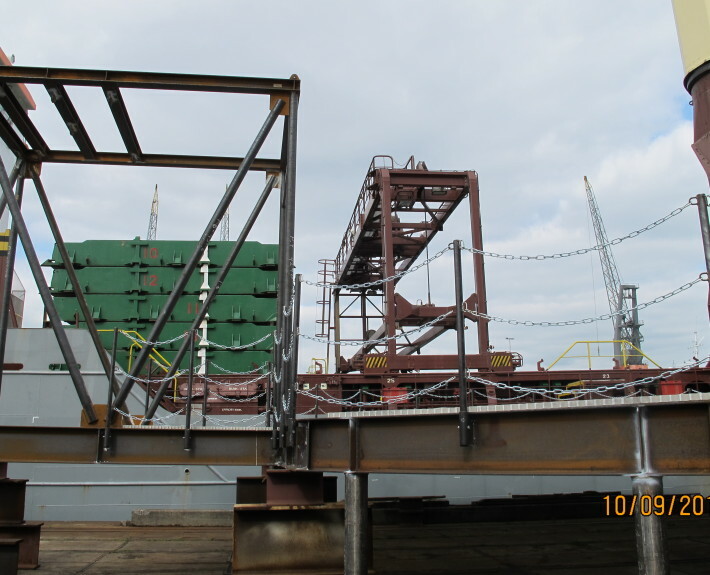 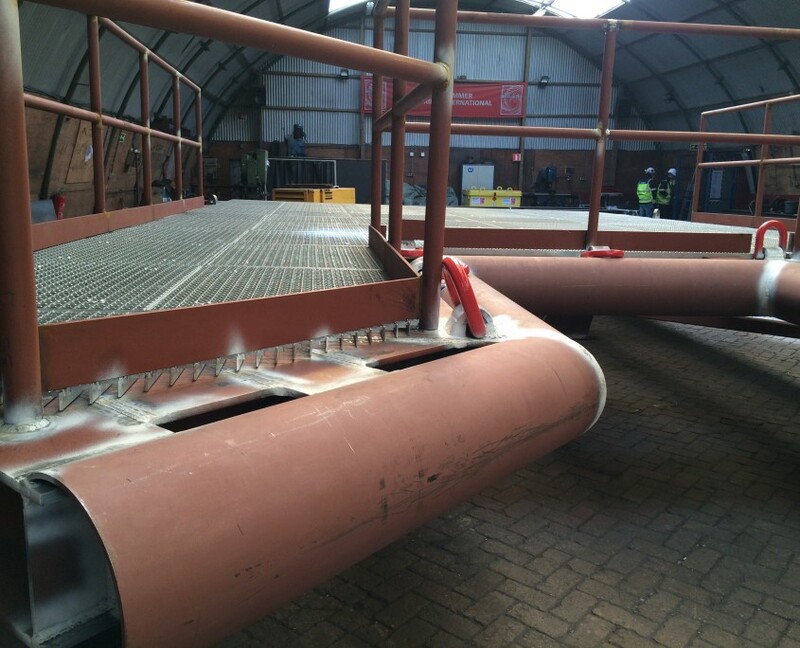 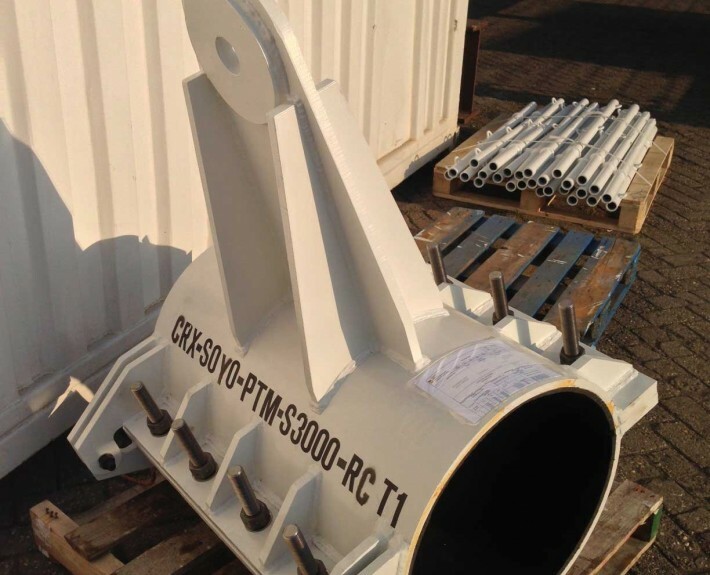 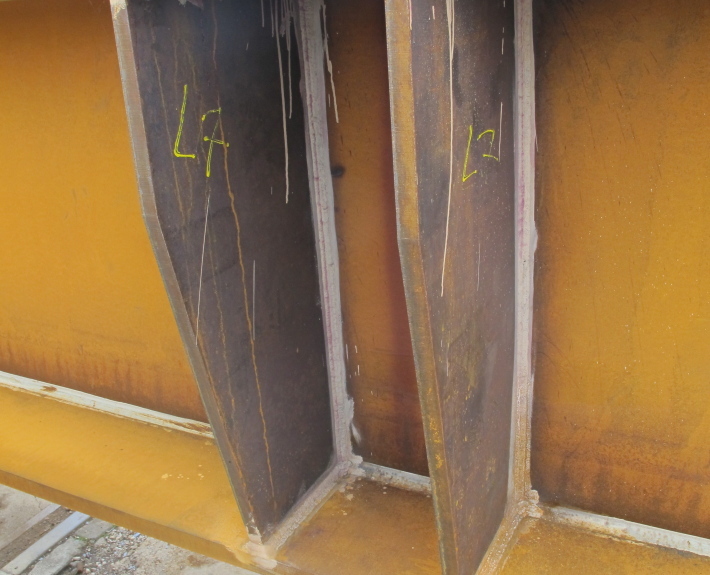 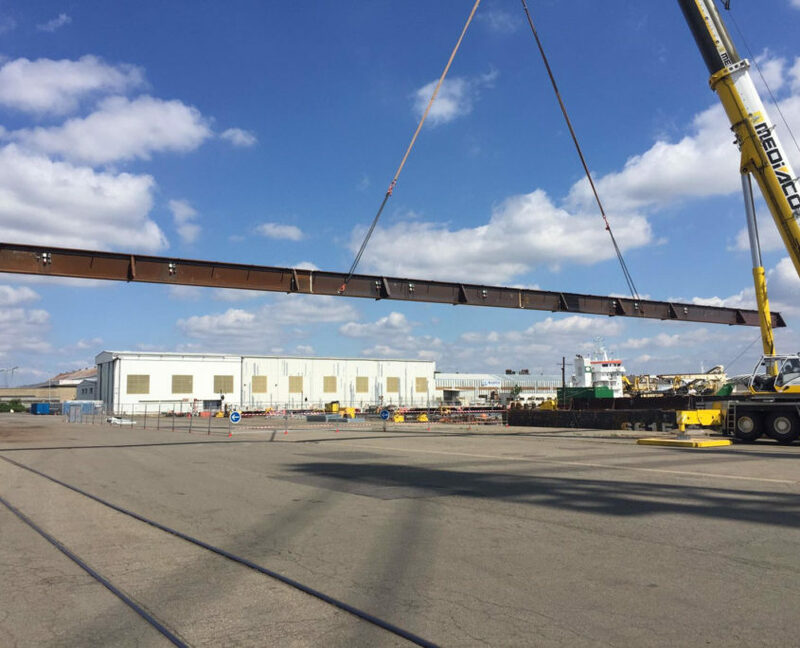 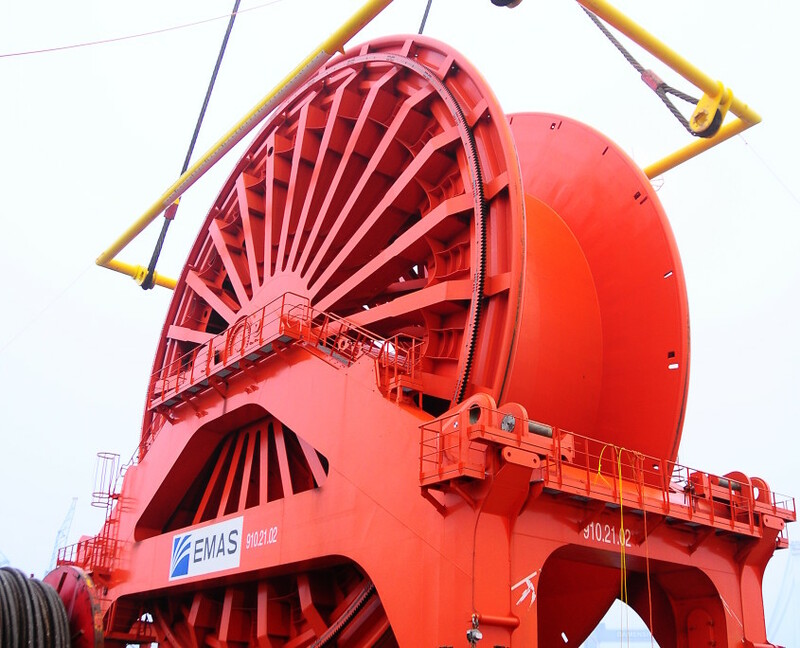 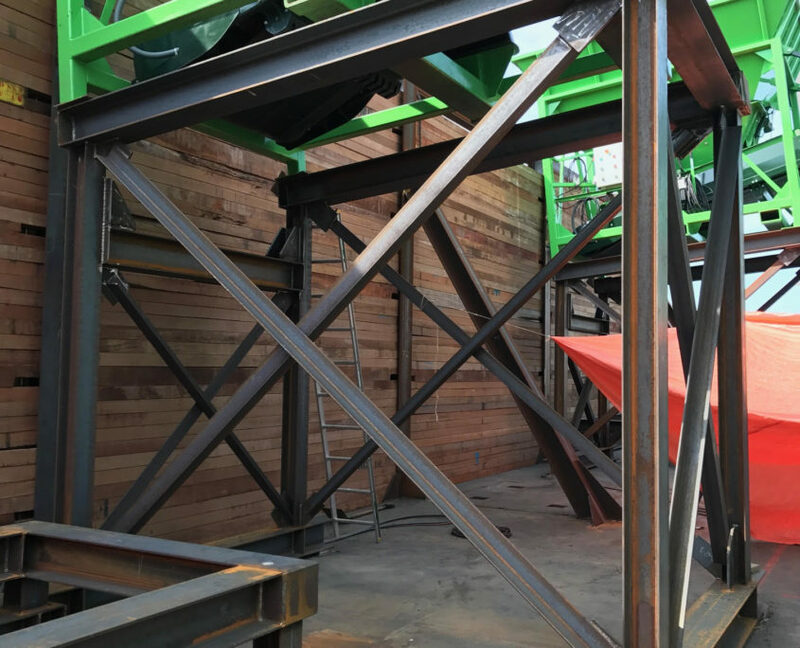 Sledge Hammer has fabricated an Overboarding Chute, a Tensioner Frame and a Deck Arch for the Guara Lula Project of Petrobras.